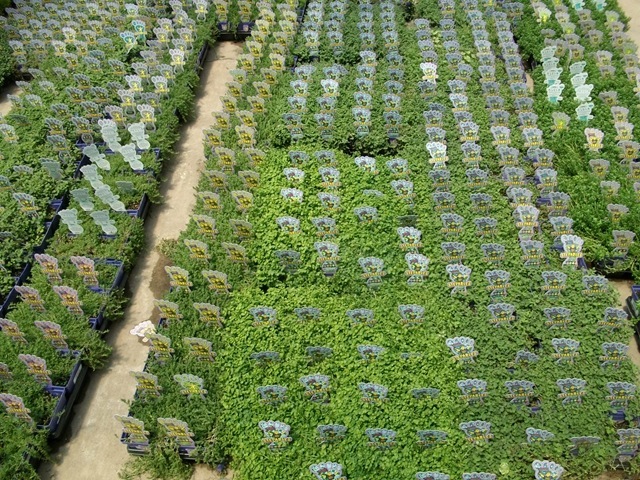 We have actually caught up with last year’s year-to-date sales. 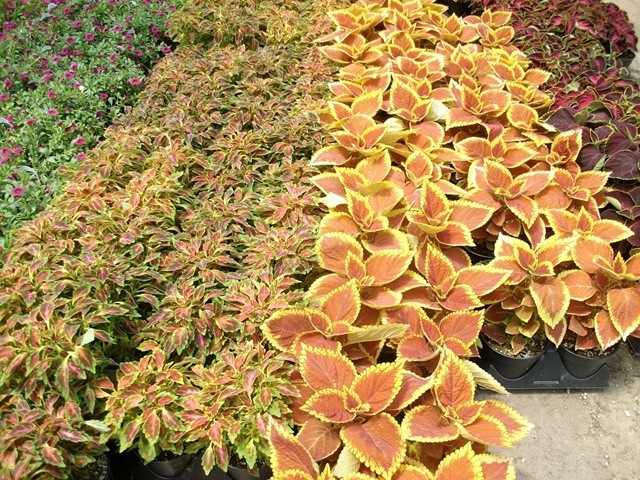 As recent as last week, we were discussing how much product we had left and the impact that not selling those plants would have on us. 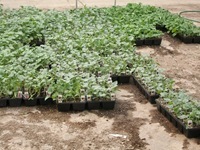 Then this week we sell a huge chunk of that inventory. 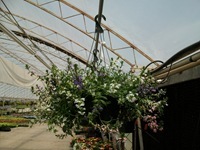 Thanks to all our customers and we hope that you have caught up too and may be ahead of last year? 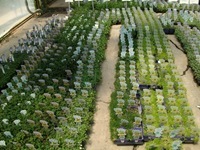 We still have a lot of inventory on hand. 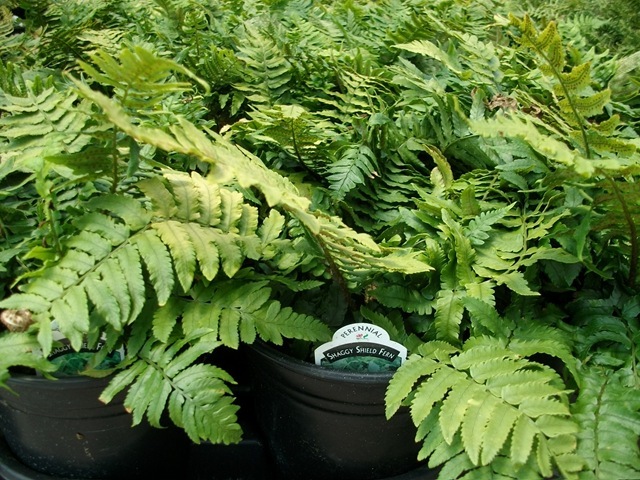 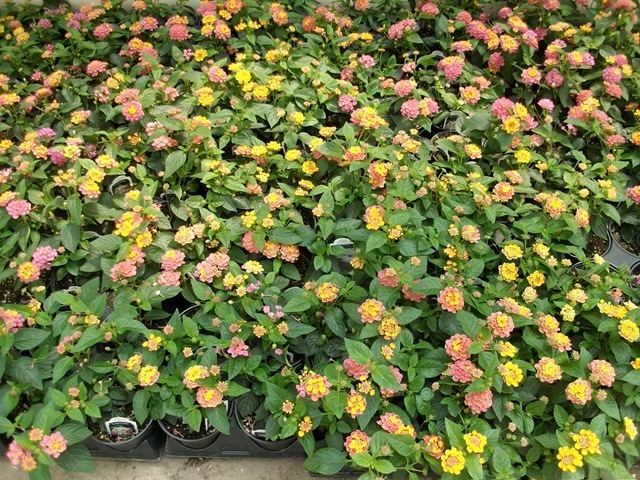 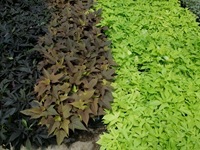 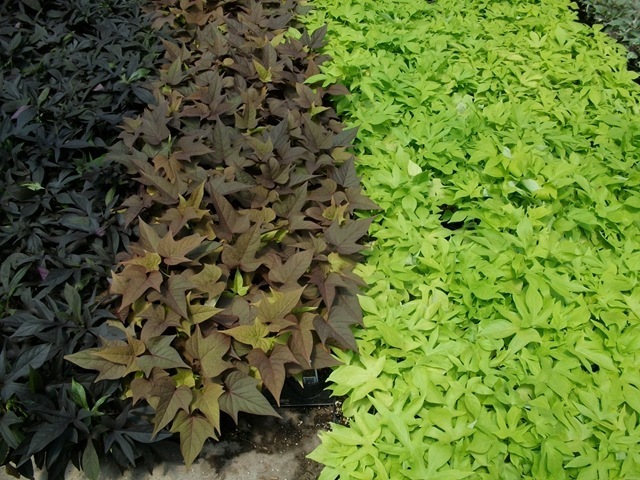 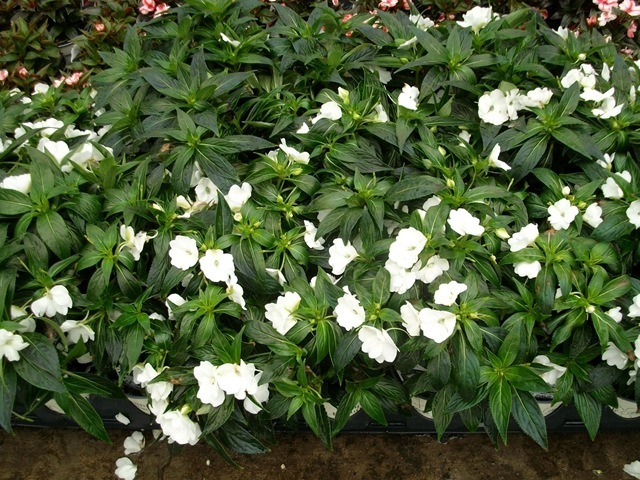 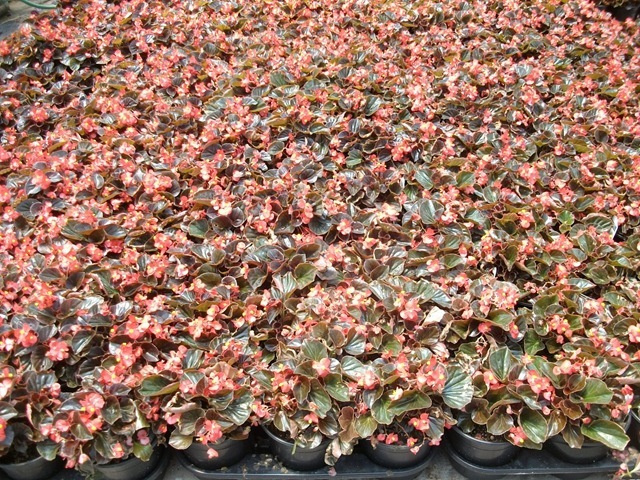 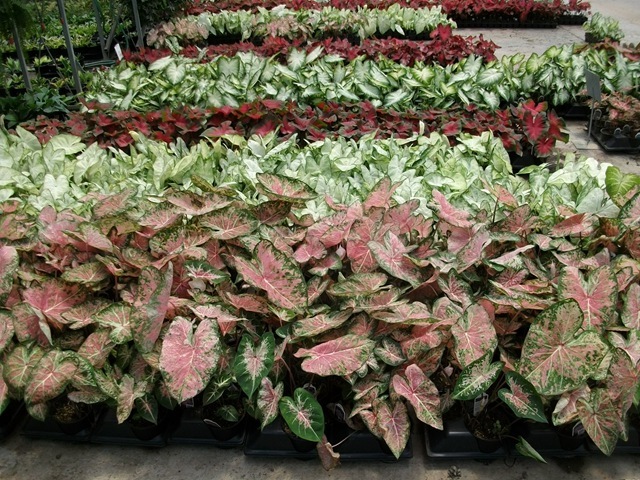 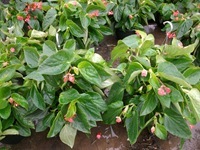 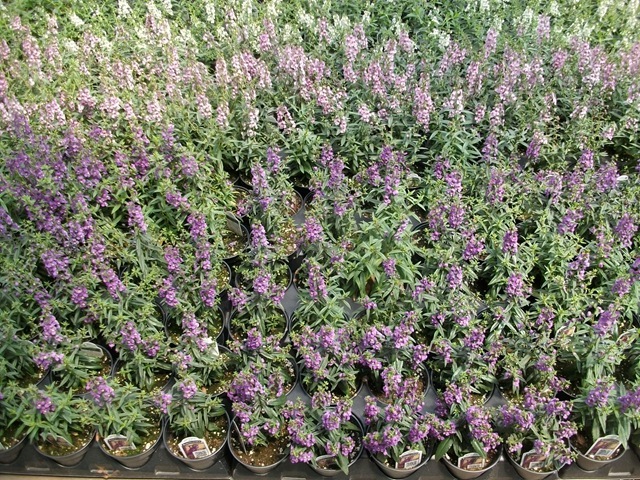 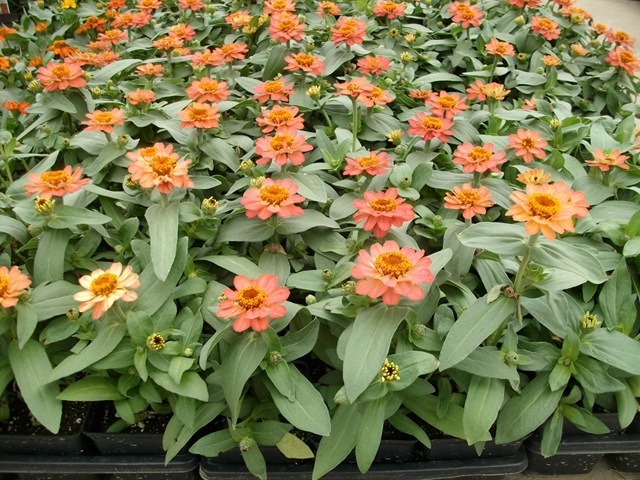 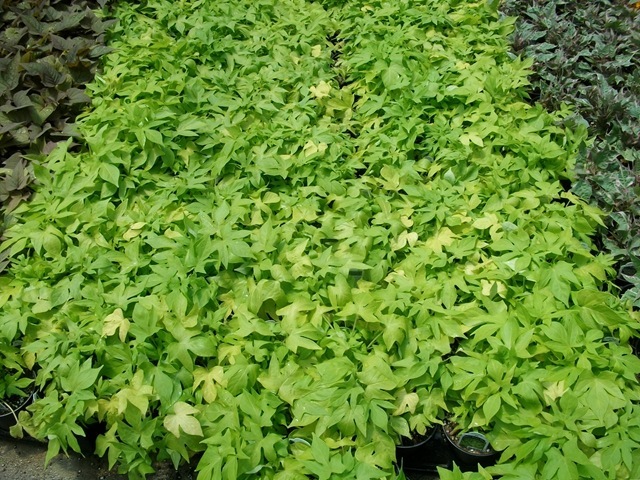 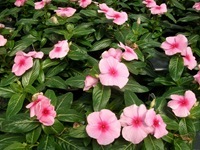 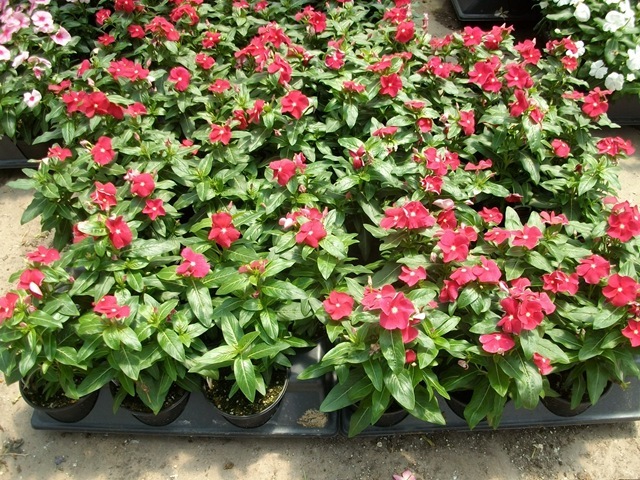 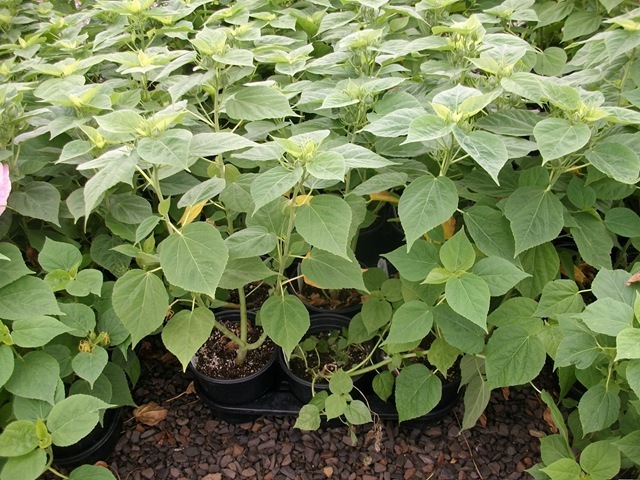 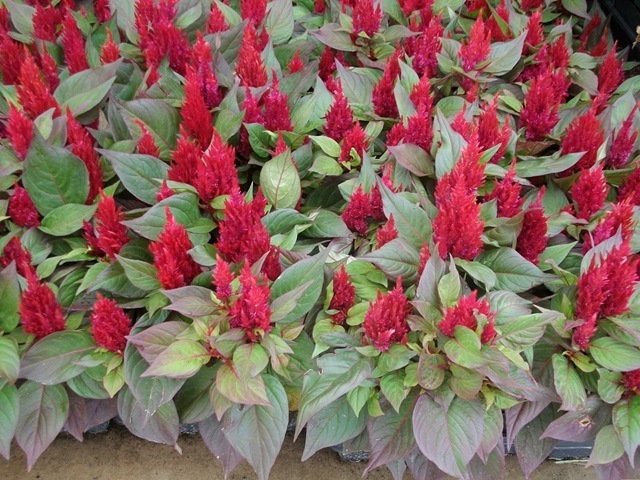 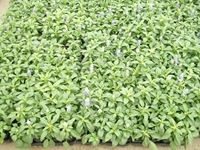 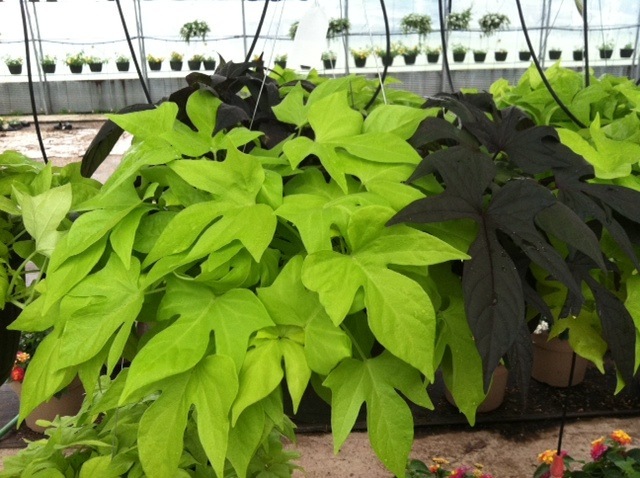 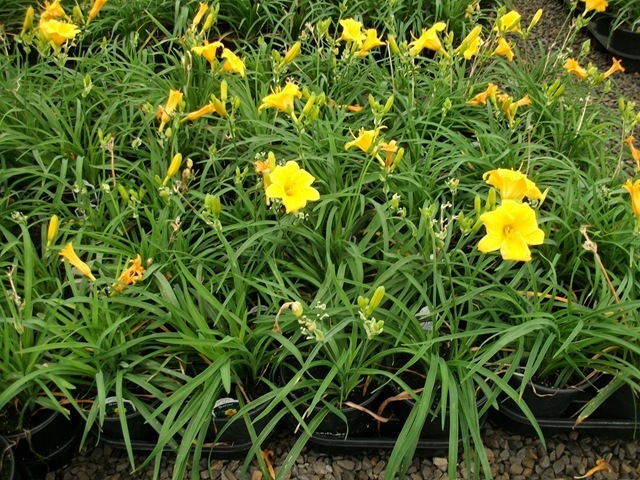 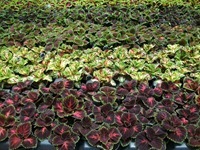 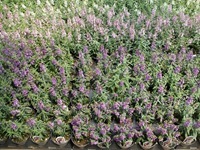 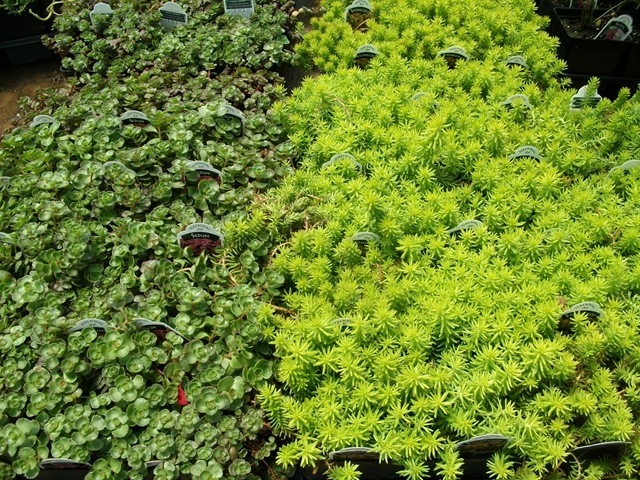 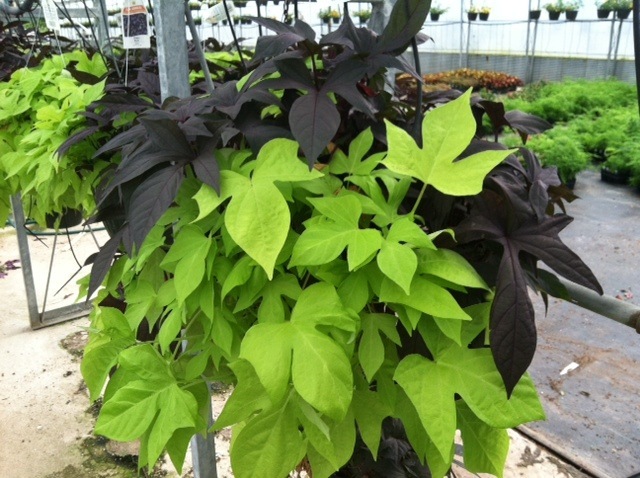 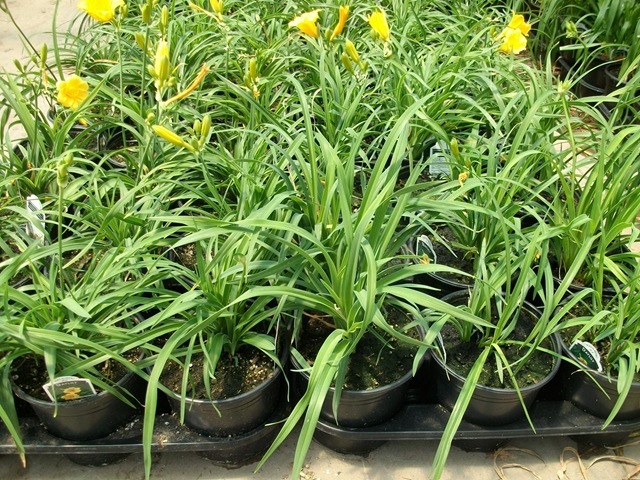 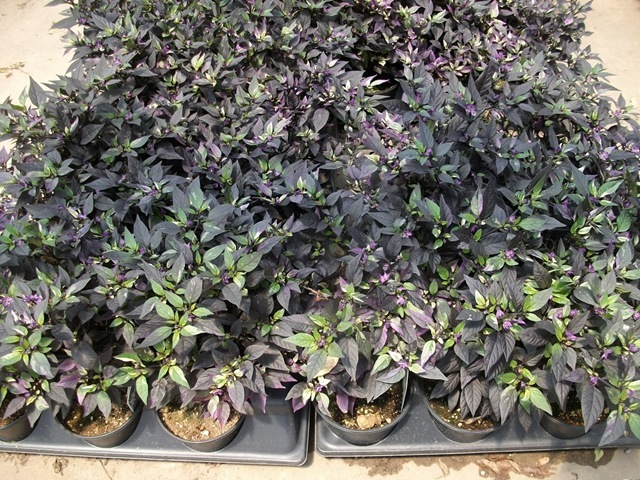 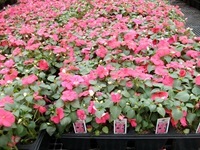 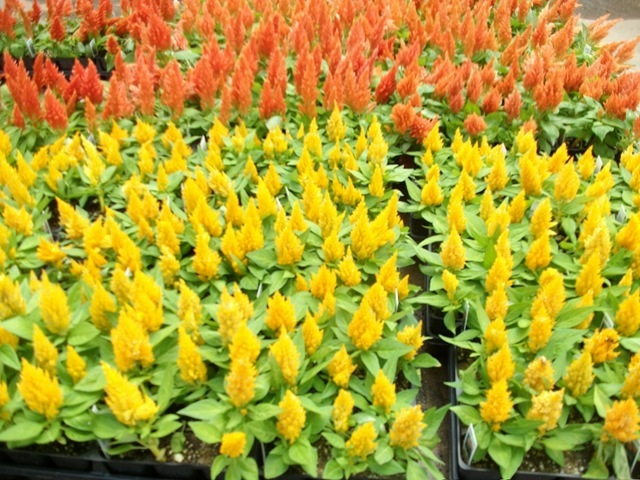 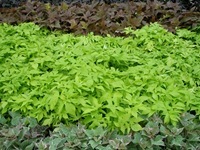 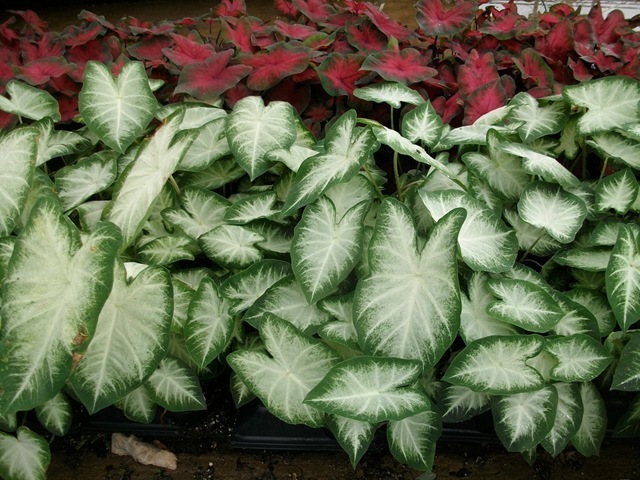 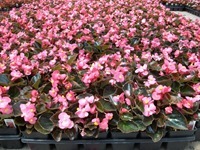 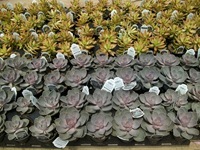 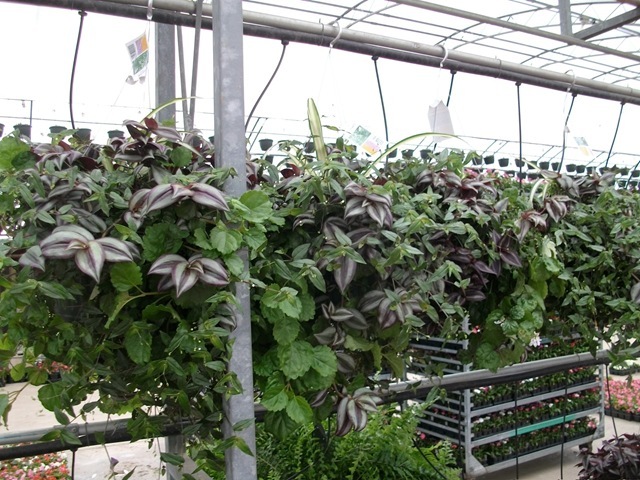 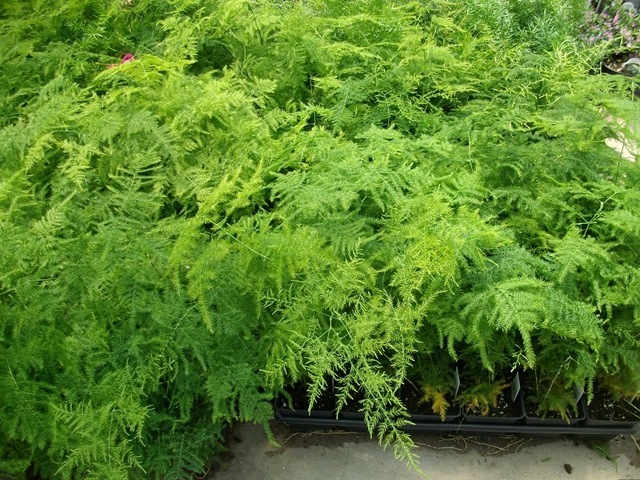 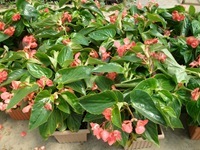 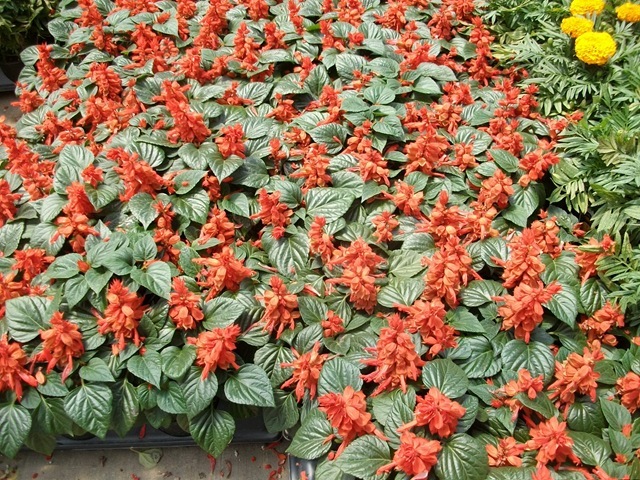 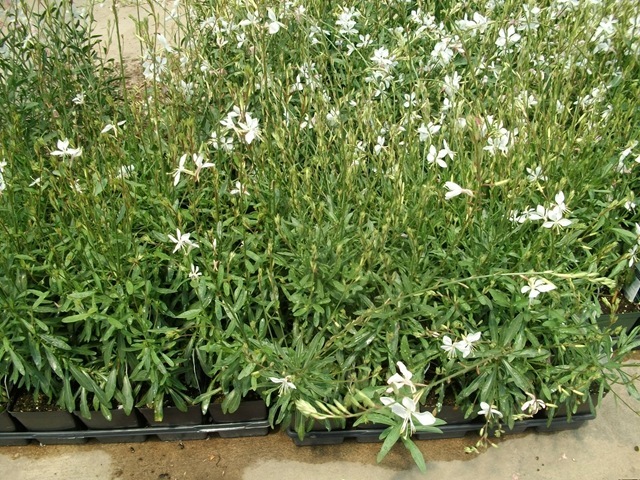 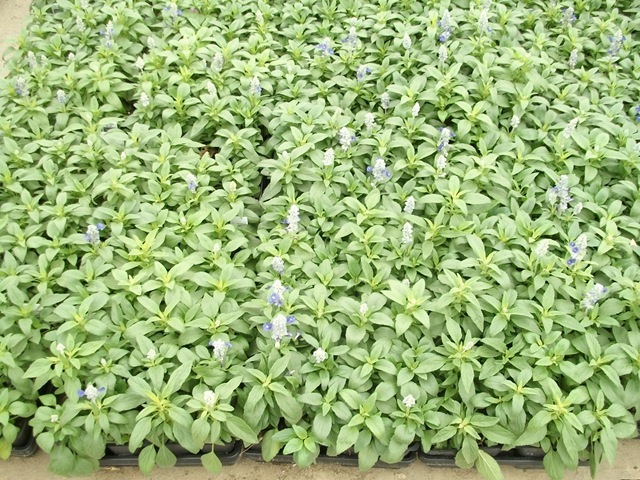 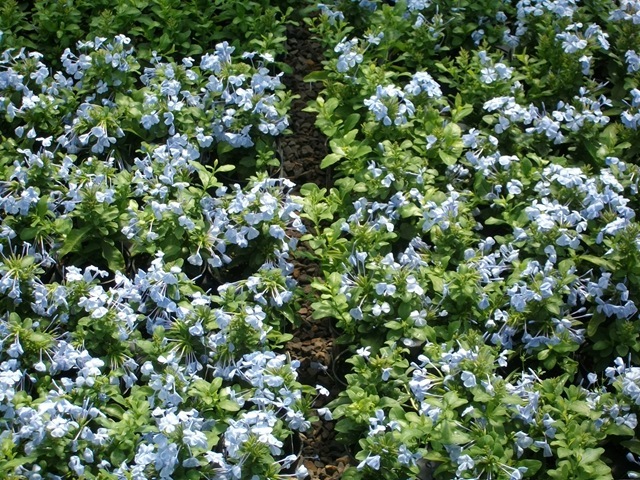 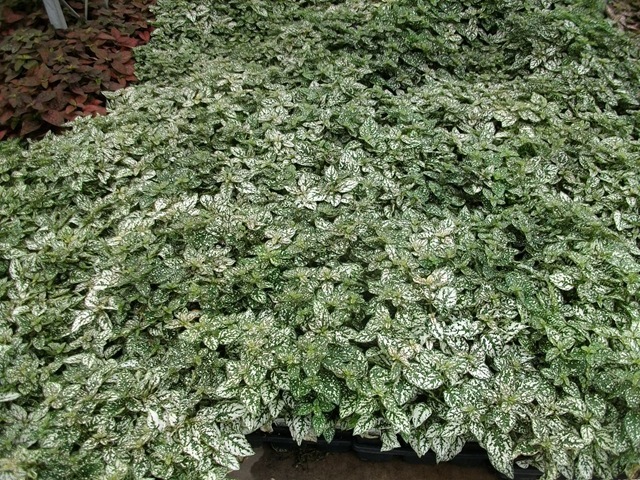 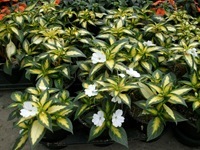 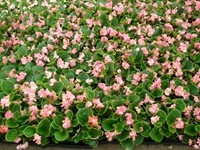 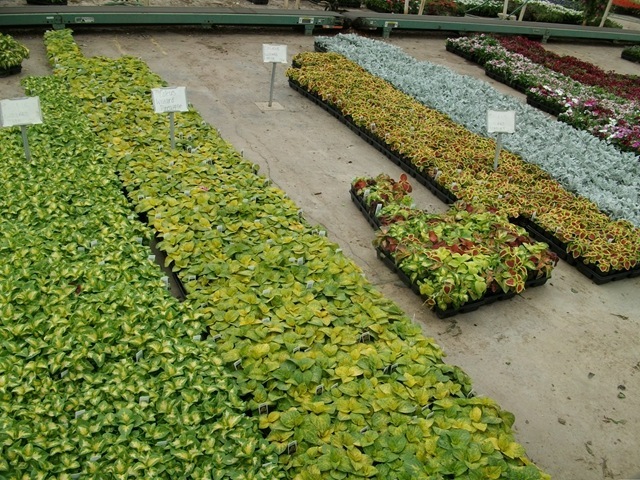 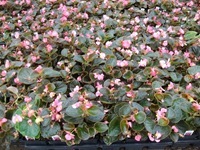 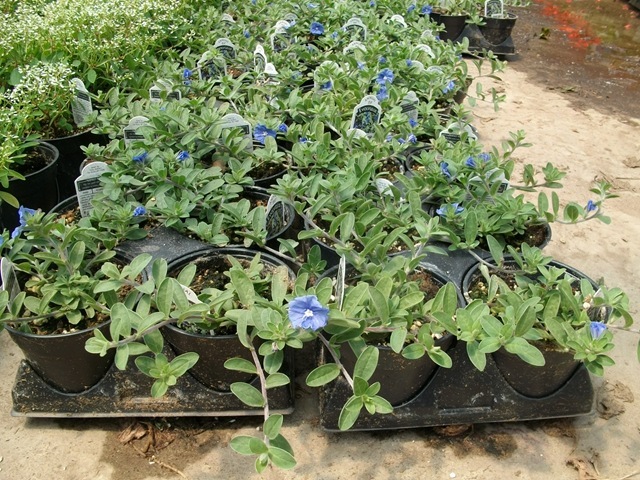 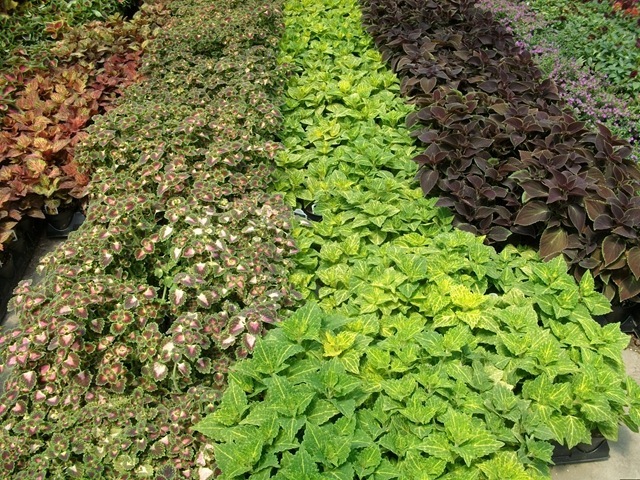 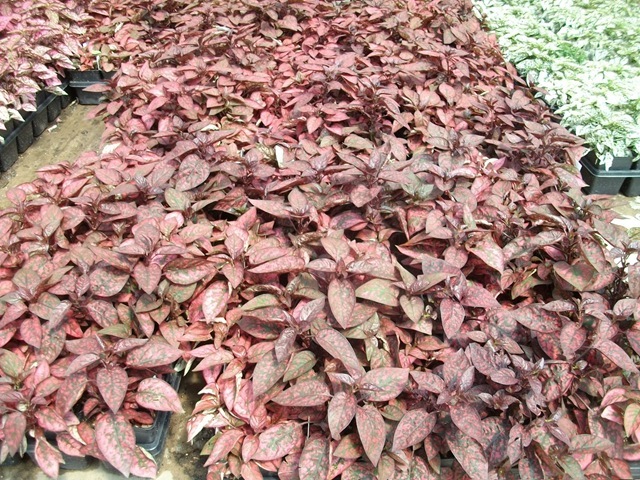 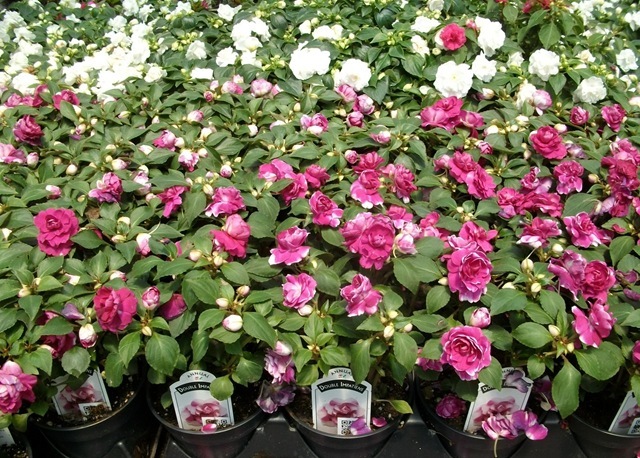 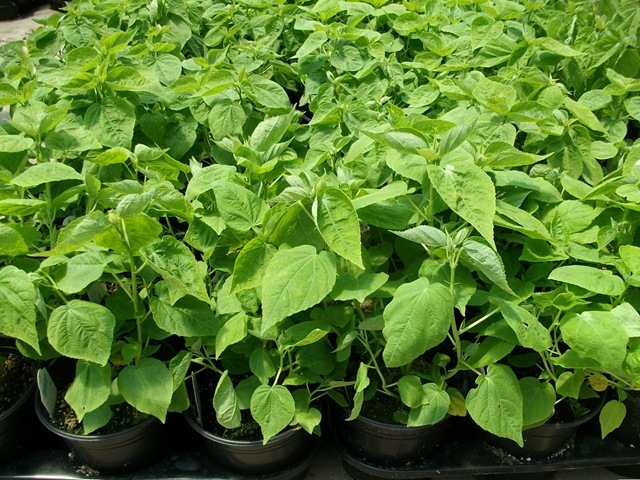 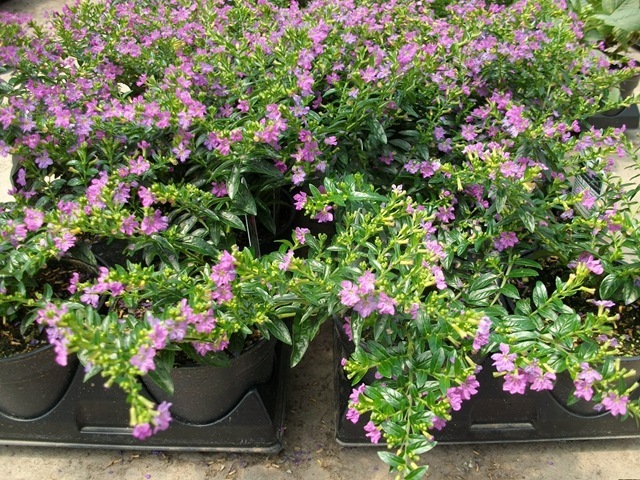 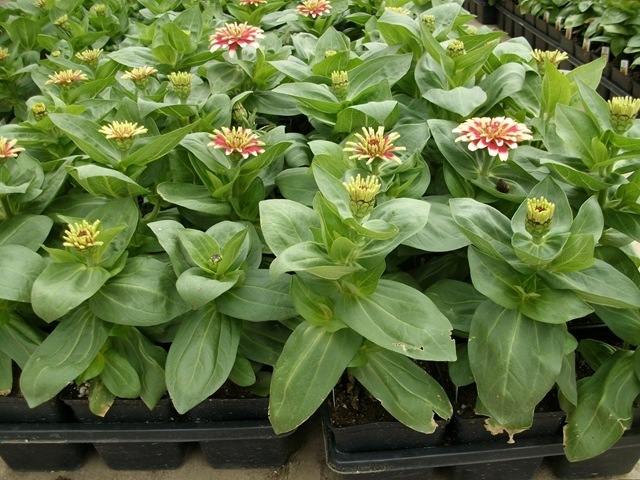 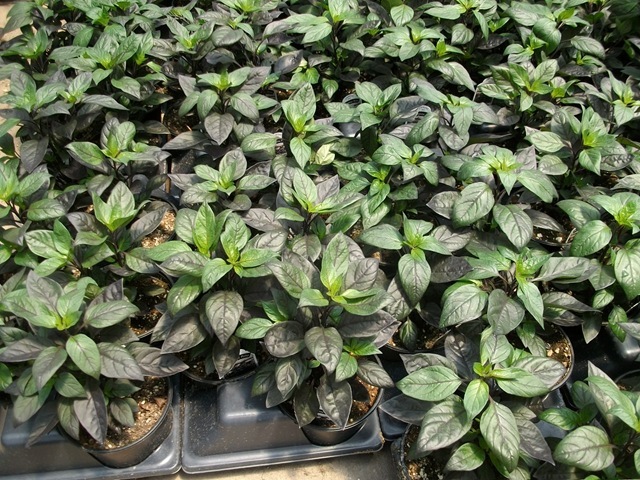 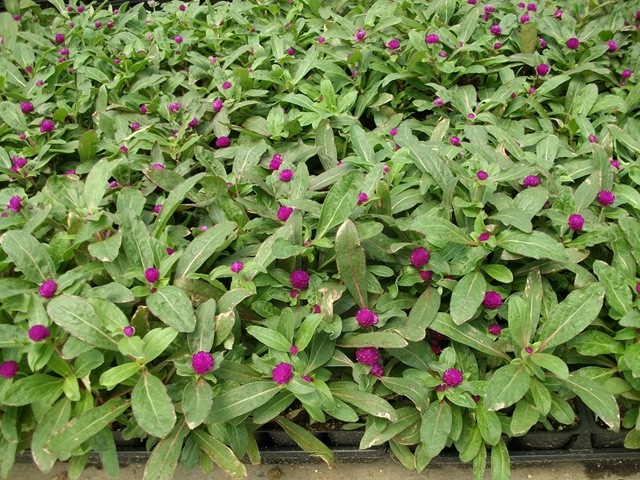 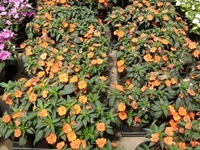 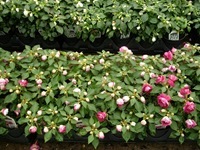 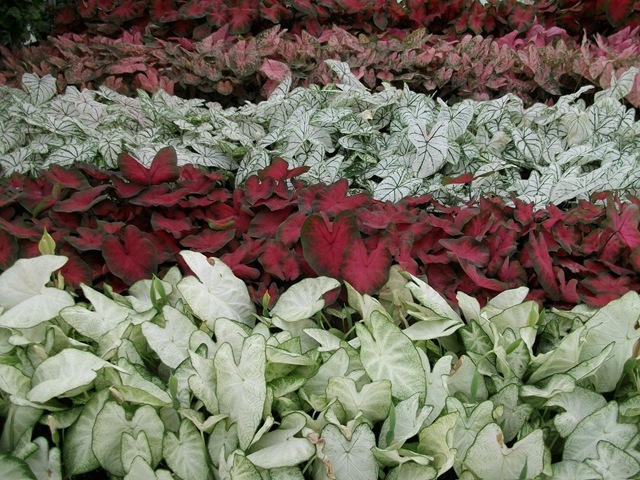 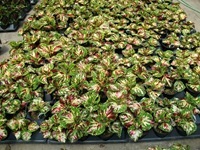 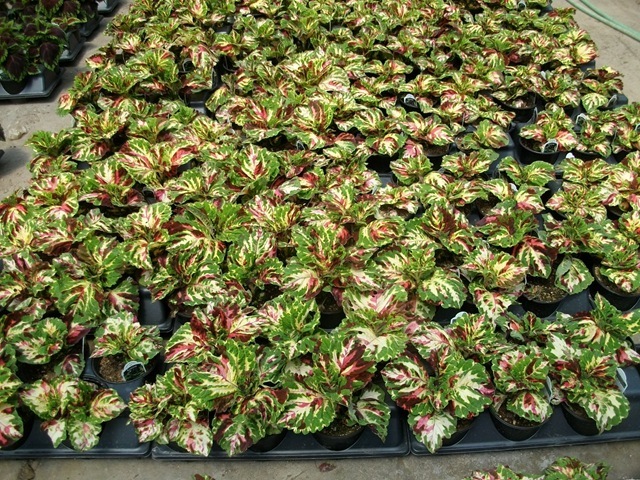 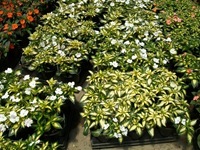 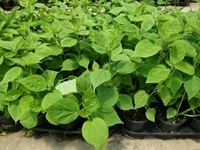 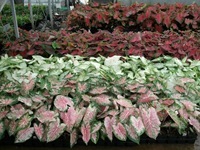 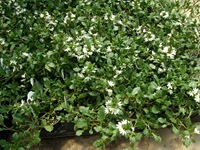 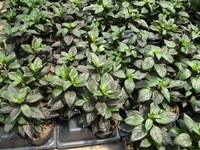 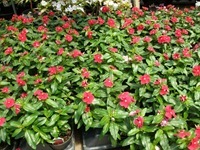 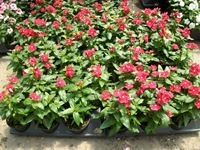 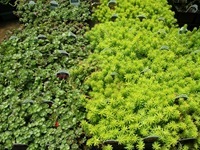 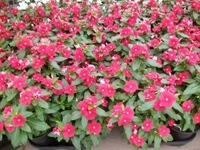 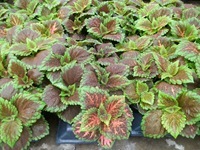 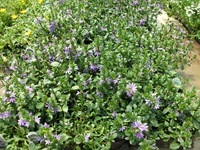 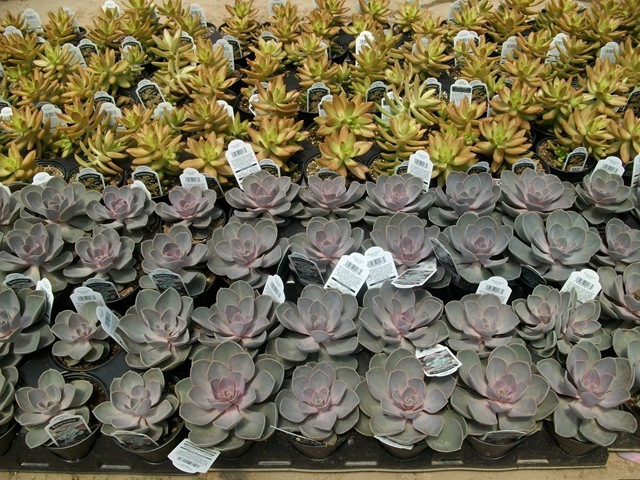 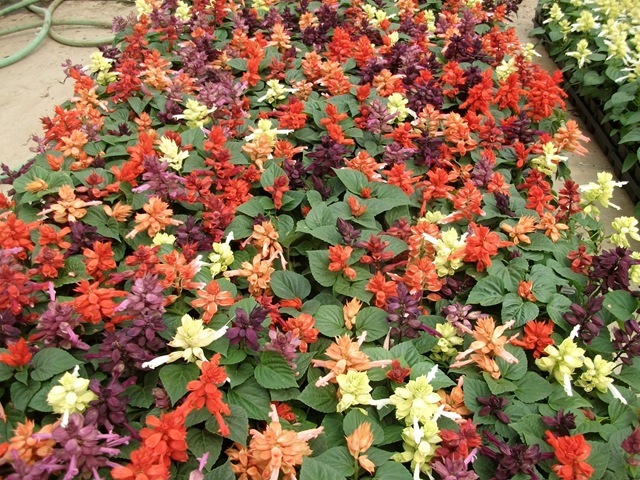 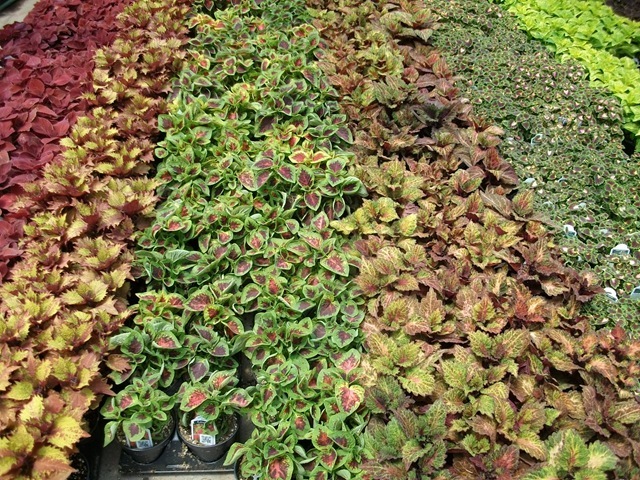 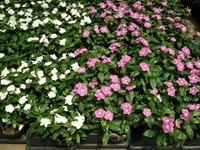 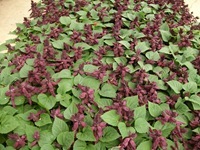 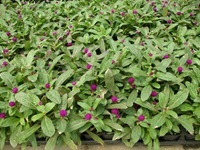 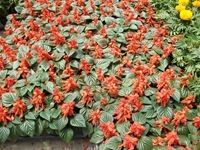 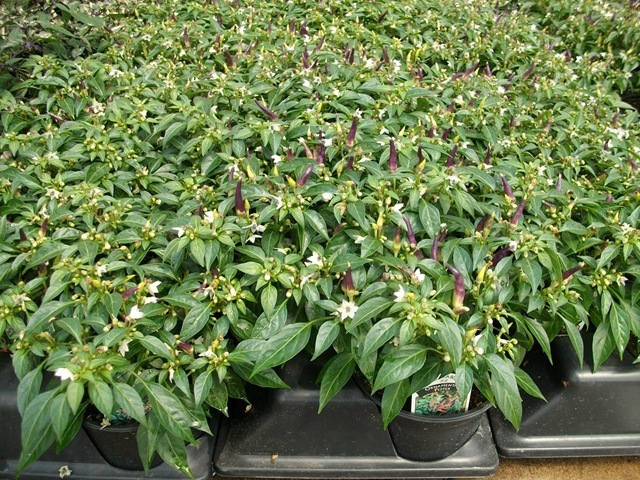 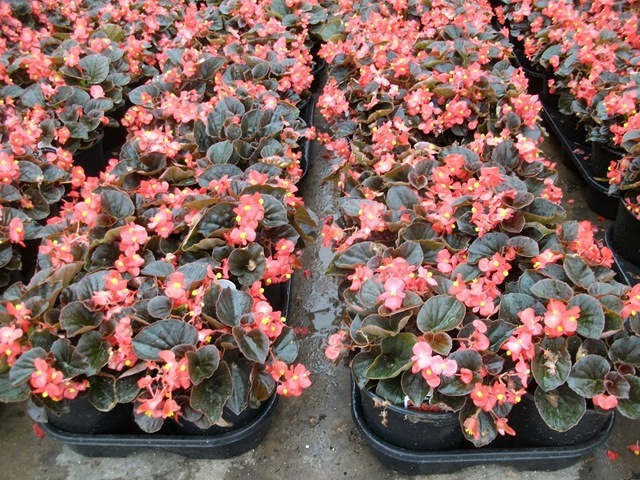 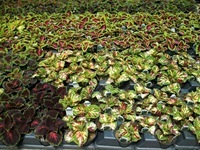 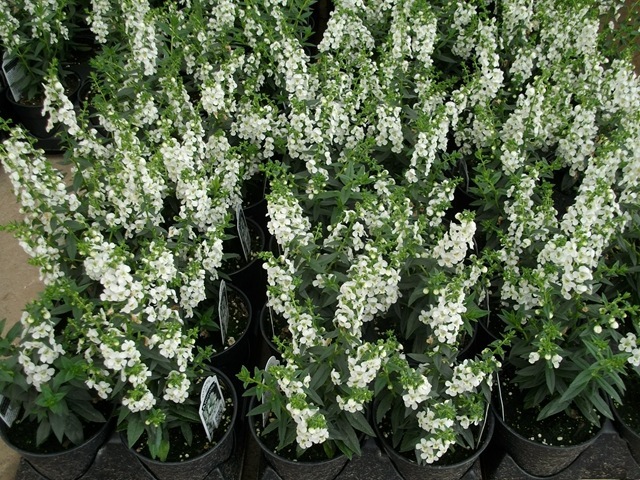 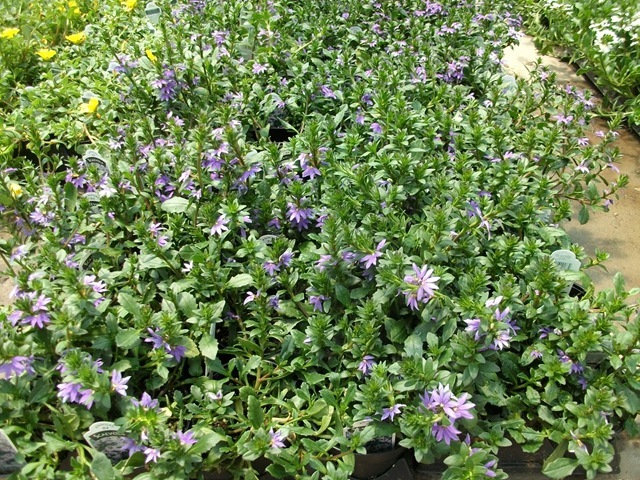 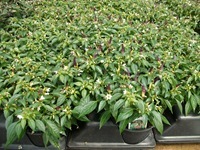 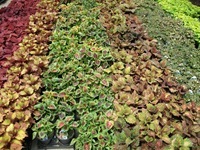 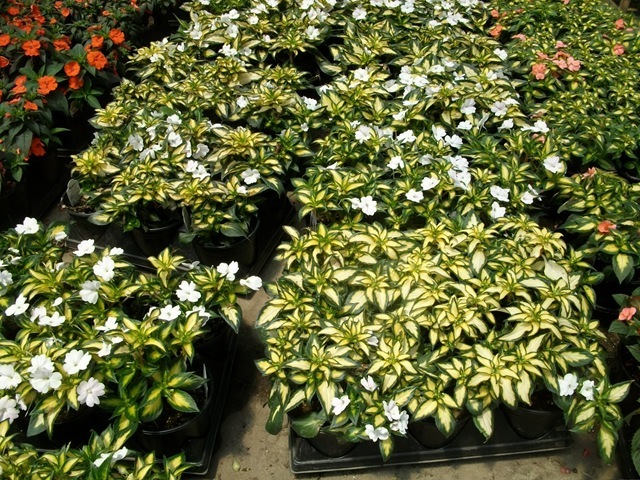 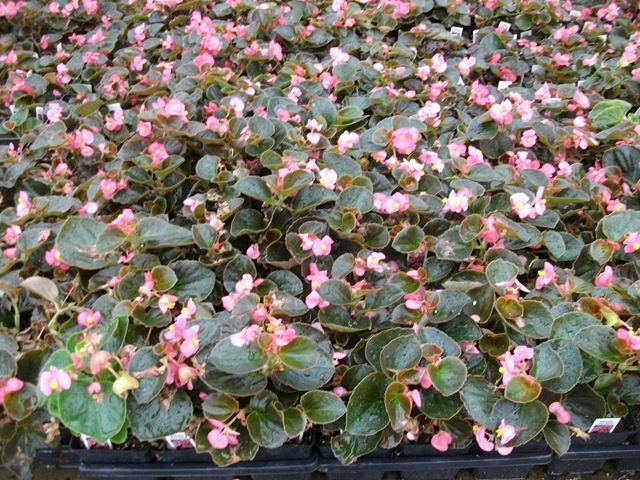 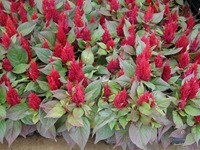 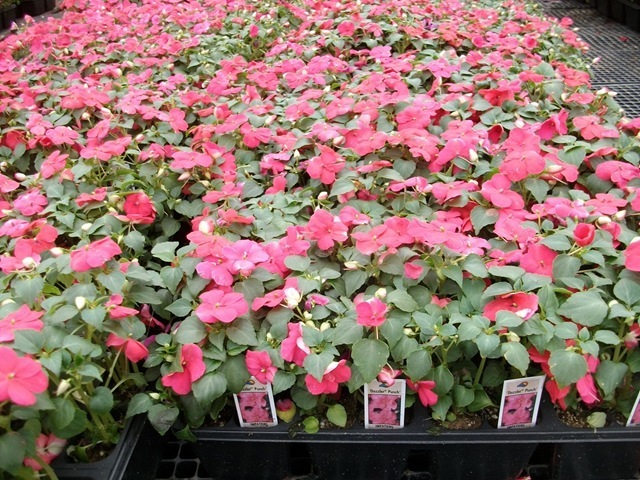 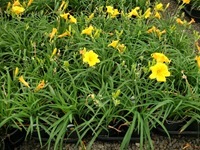 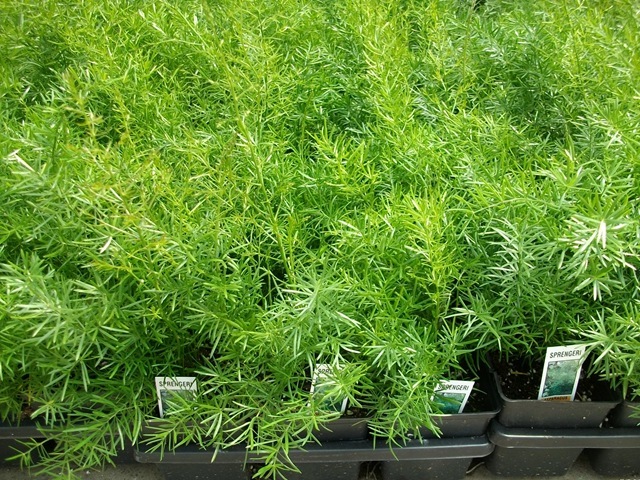 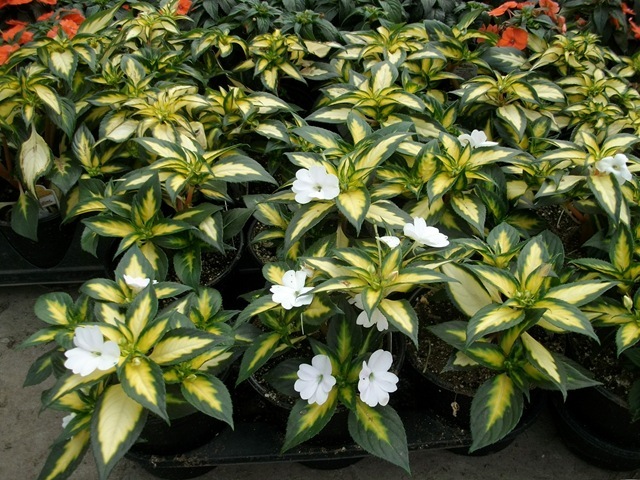 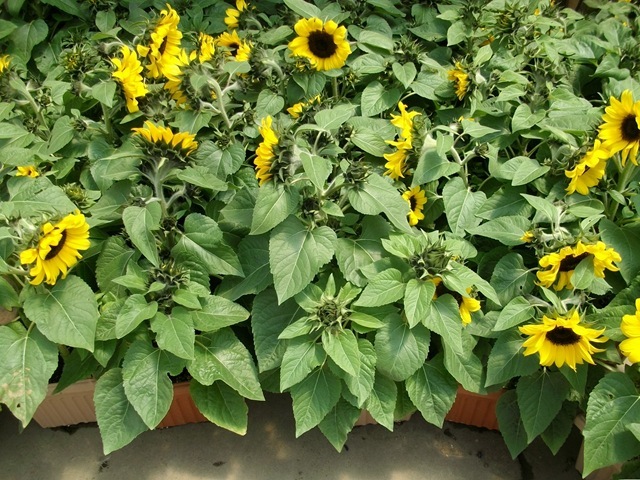 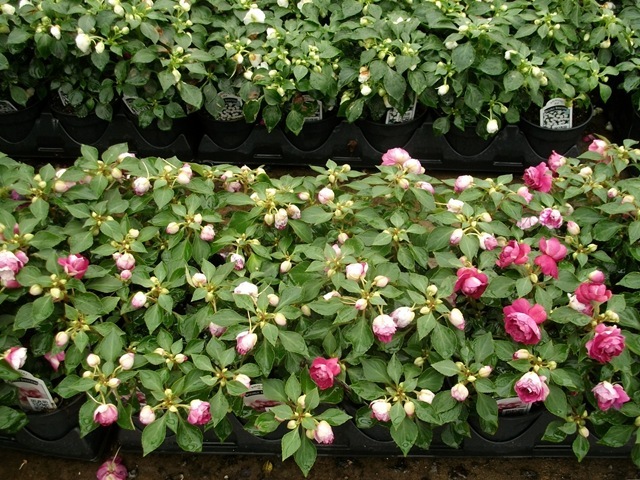 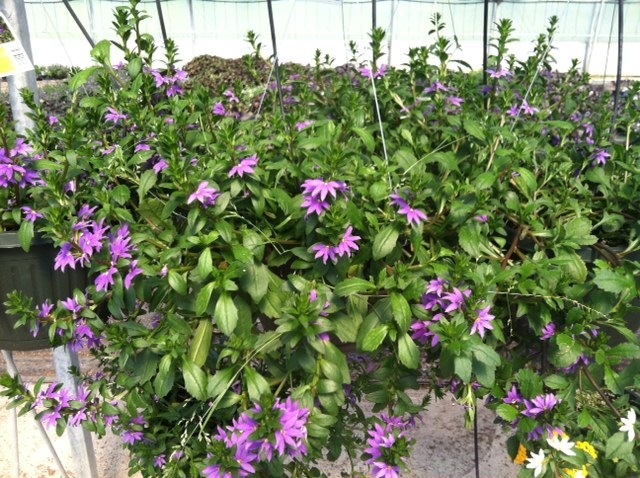 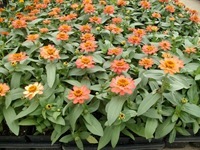 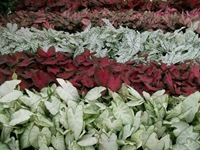 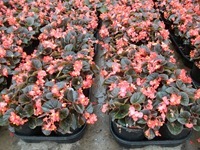 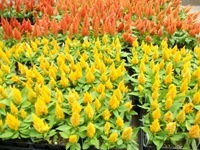 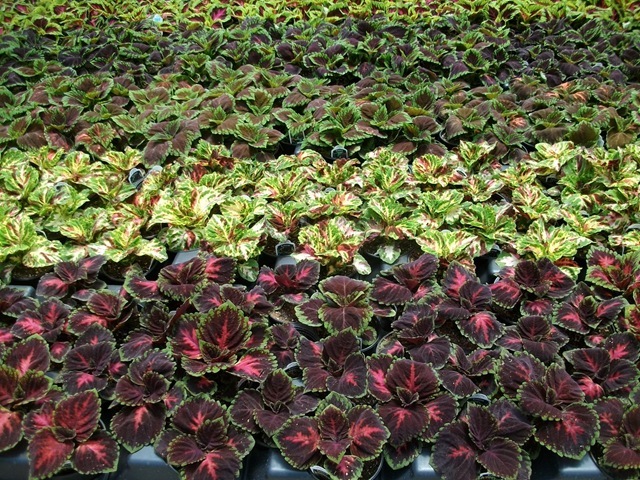 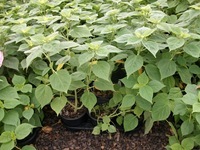 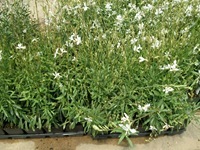 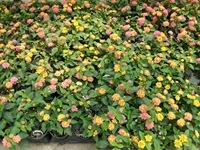 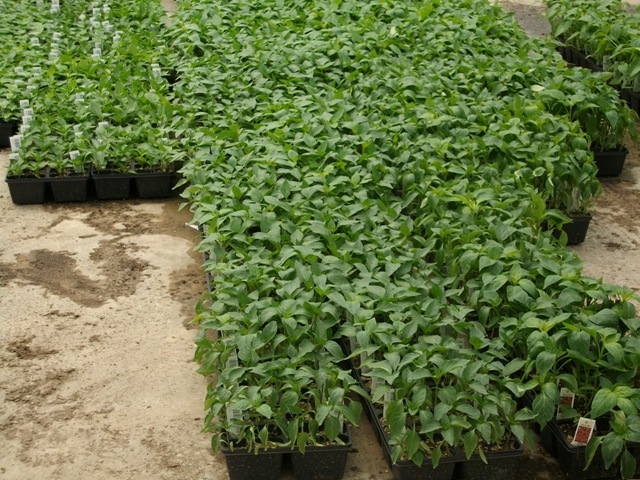 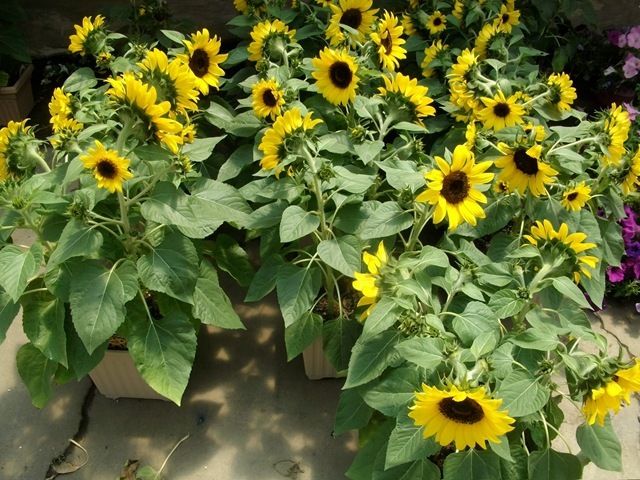 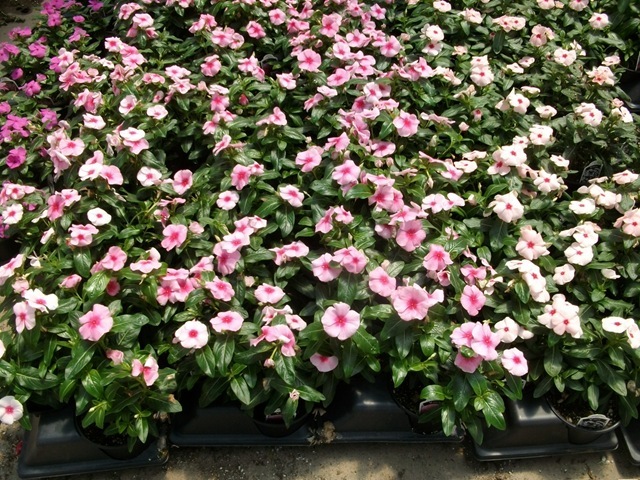 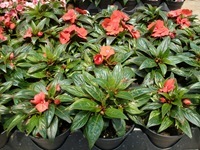 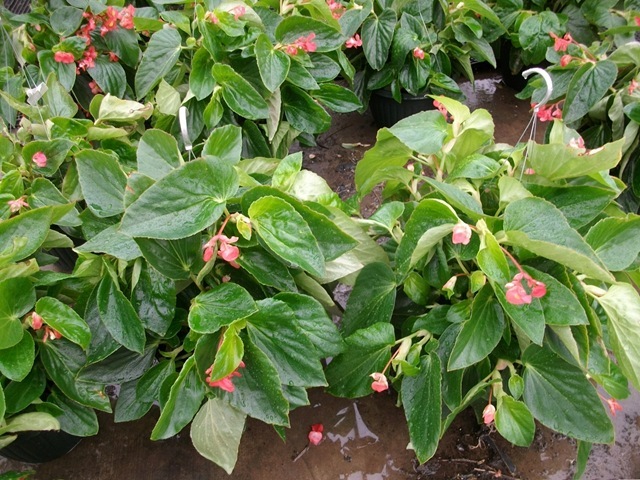 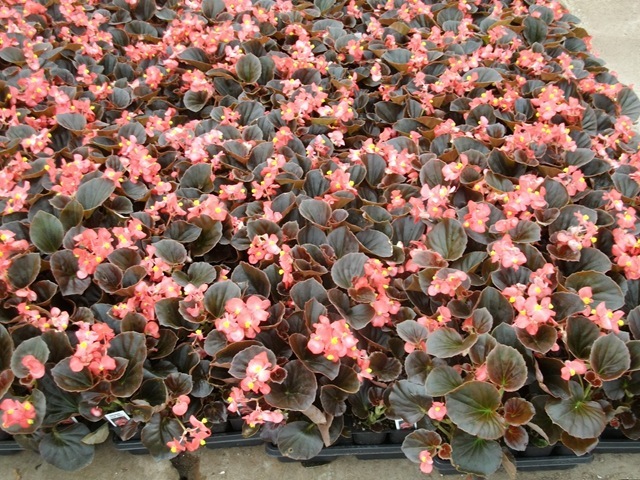 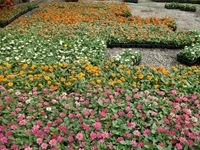 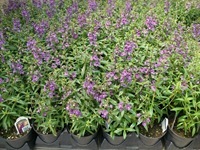 We had a few late plantings of select items that just got ready last week. The weather is helping sales since it has not been that hot yet, but we can do without all the severe weather. 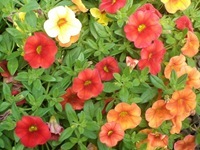 We have been under a tornado watch since Wednesday night. 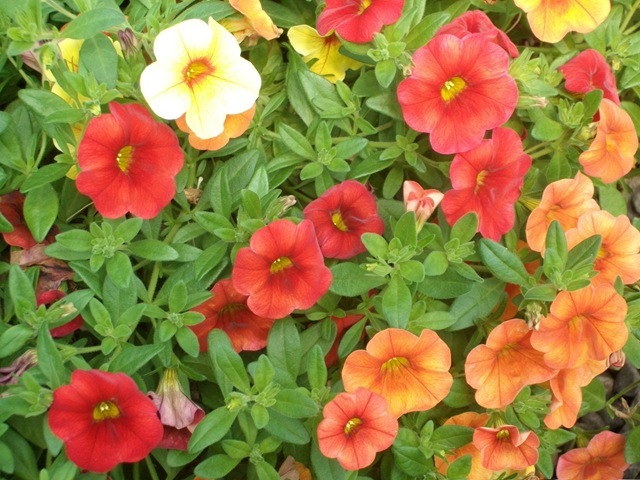 I am not going to ramble much in this post. 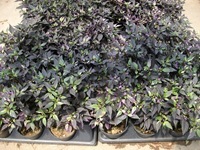 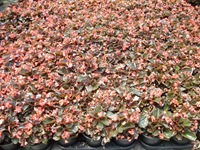 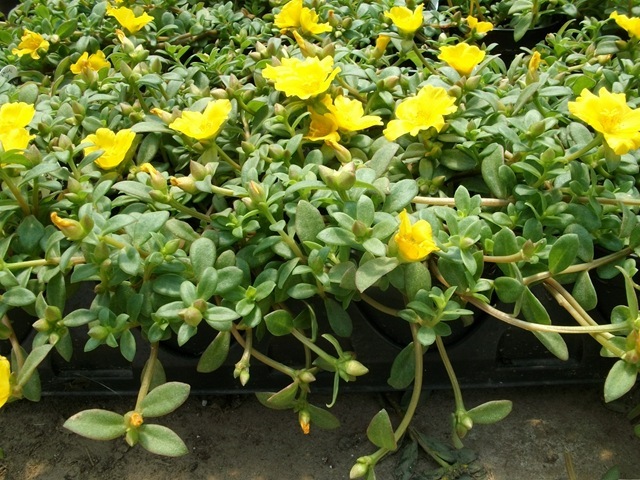 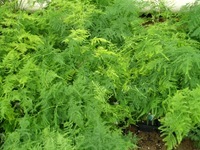 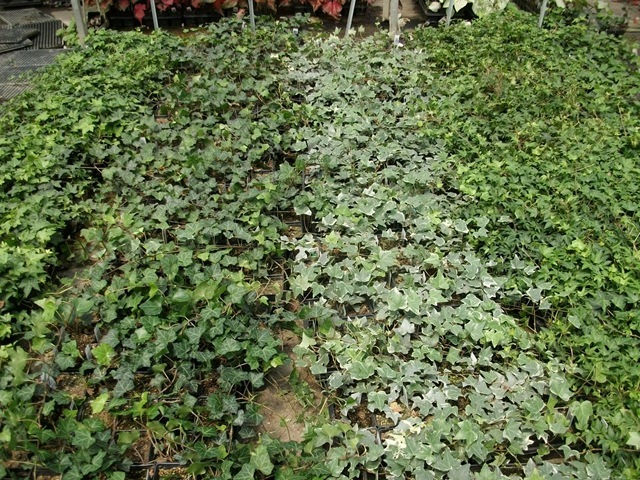 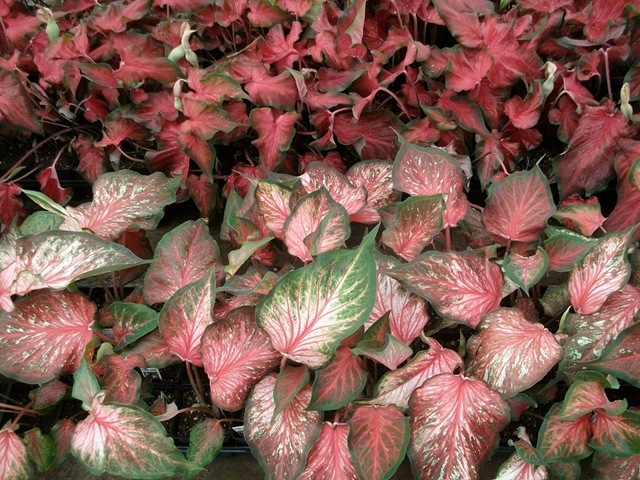 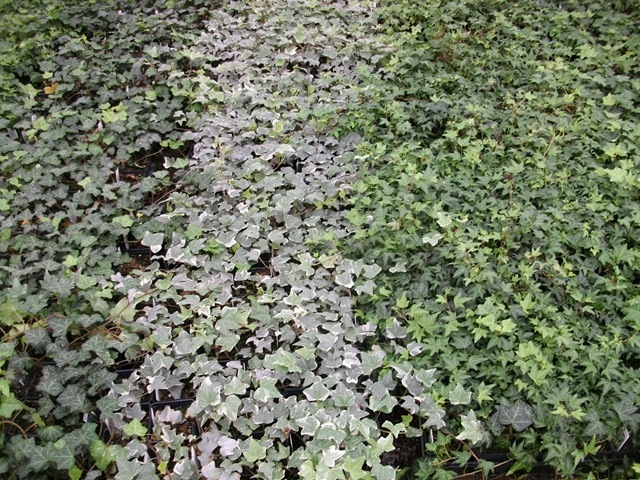 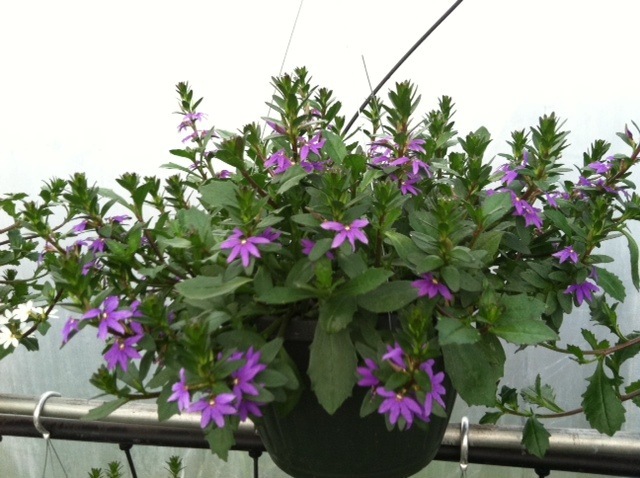 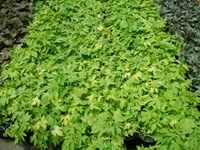 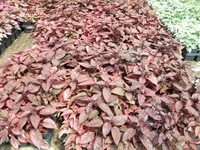 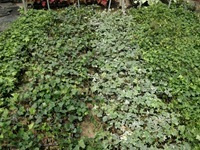 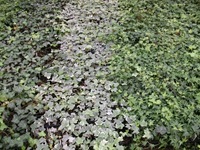 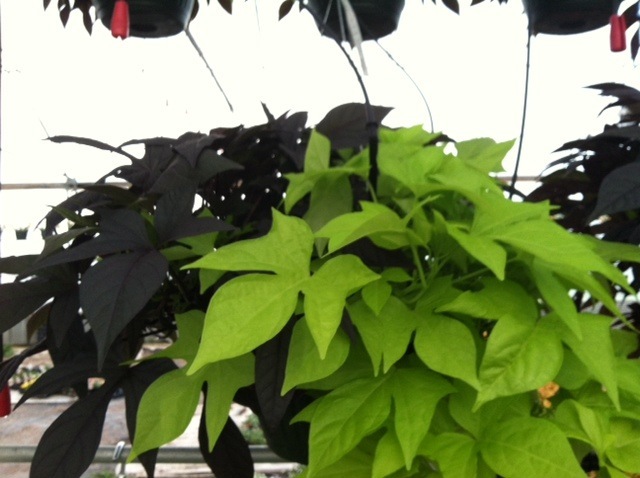 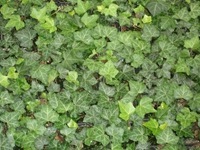 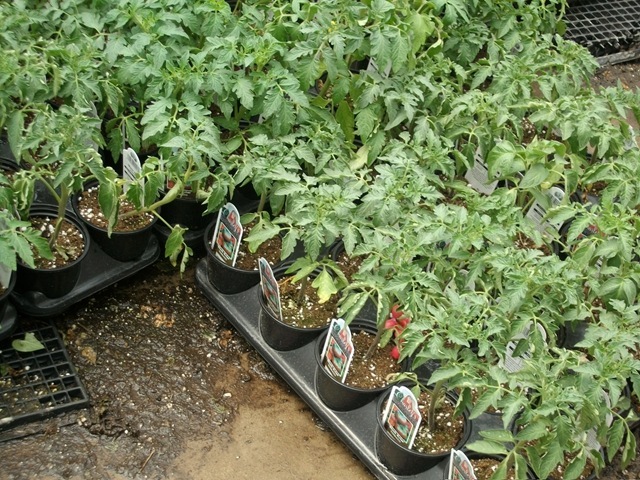 Here are pictures of some of the plants we have left. 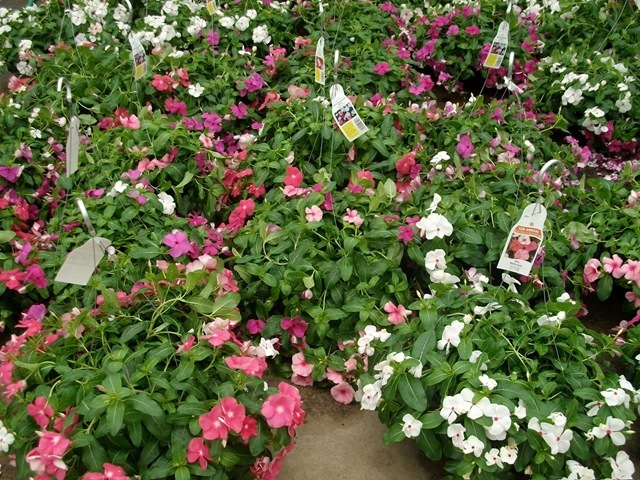 Even though it’s getting late most of it still looks good. 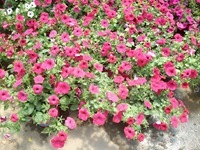 I am looking forward to the long weekend. We will be closed Saturday-Monday for Memorial Day. 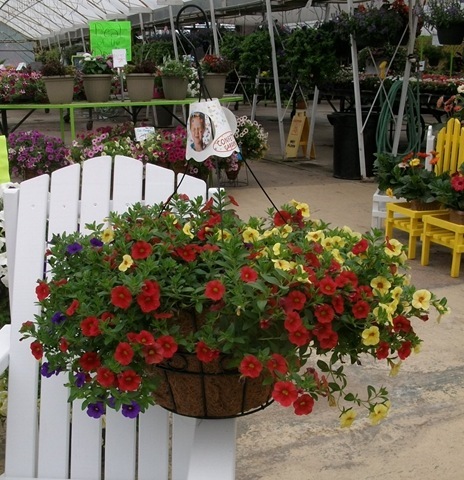 We all could use a little rest around here. 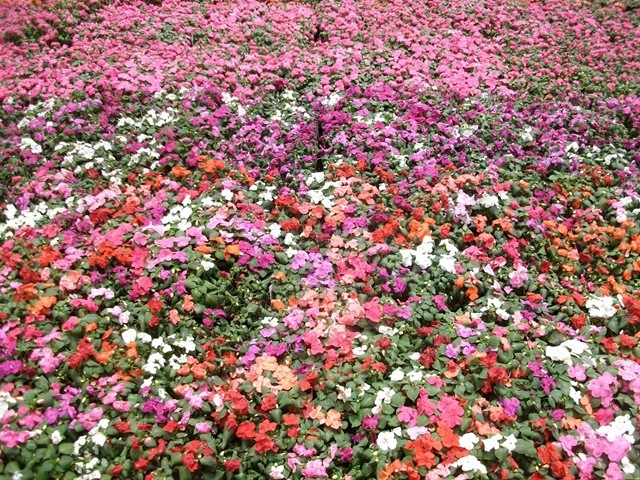 I have plans to do as much of absolutely nothing as possible…and mow. Unless I can get my wife to do it. 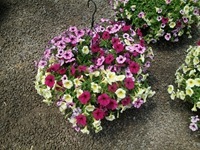 I can play the broken leg card but that’s getting old with her. 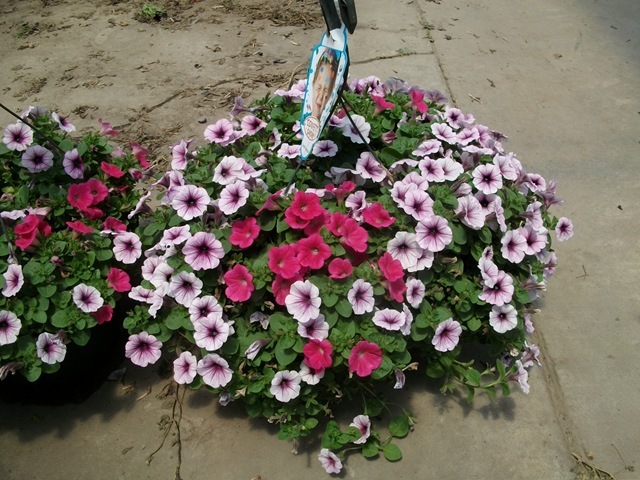 It’s like she expects me to do house work and stuff. 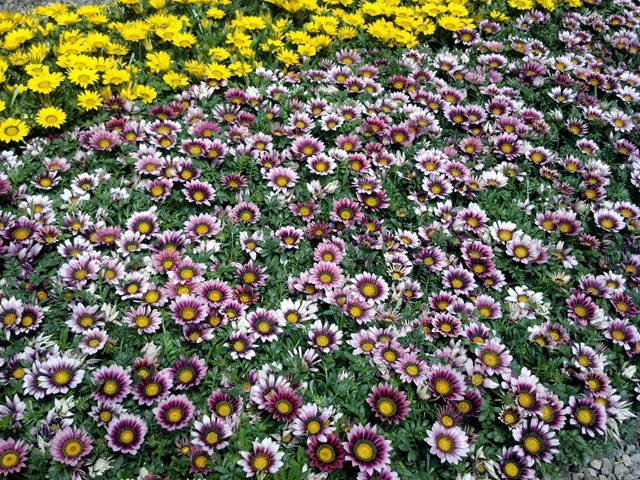 Weird, huh? 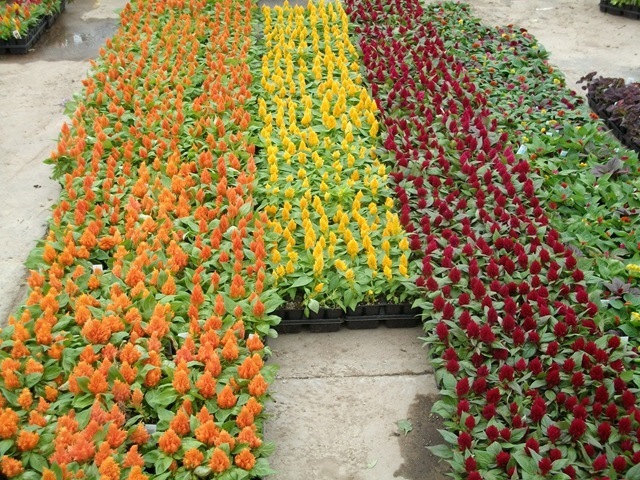 Any way, we are still plugging along with the plants and flowers. 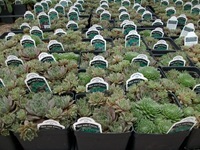 We are doing a lot of counting today to get our inventory numbers more accurate. 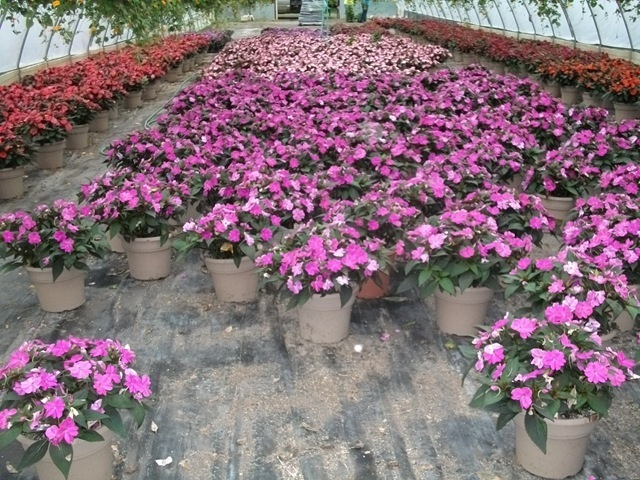 My apologies if you did not get something you ordered this week. 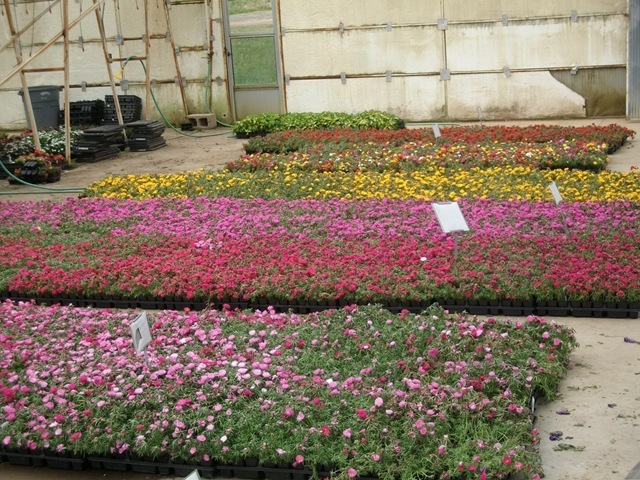 Due to the exceptionally late spring, we were in a holding pattern with our products. 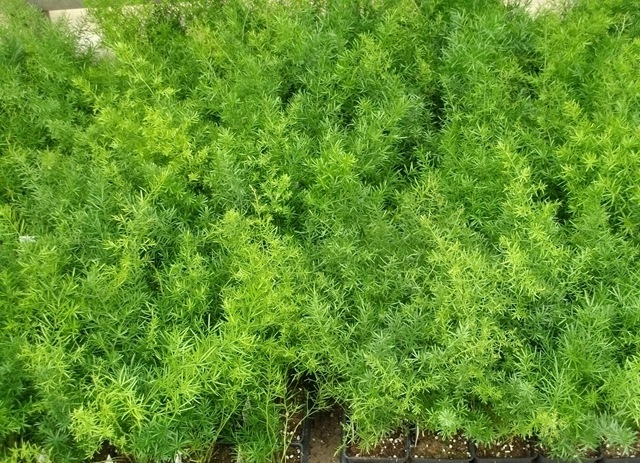 As the season progressed we were pulling the best from multiple plantings, product was skipped over, cut back and thrown away. 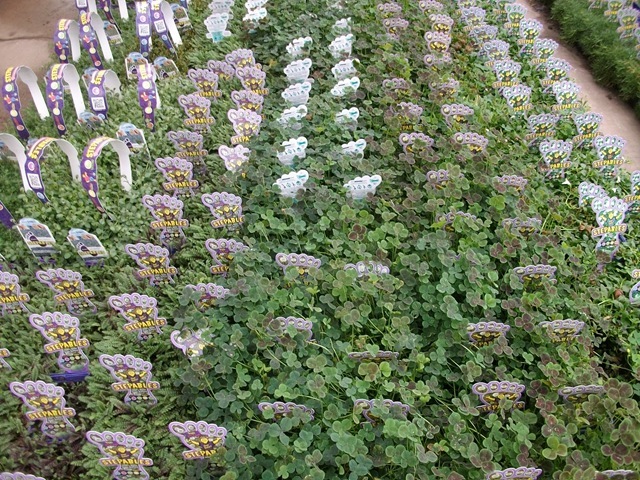 All that shuffling makes it very difficult to keep an accurate inventory so when we get to the end of our season, we were off a few (or more) in our inventory. 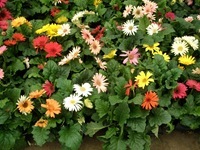 I am sorry for any problems that may have caused you. 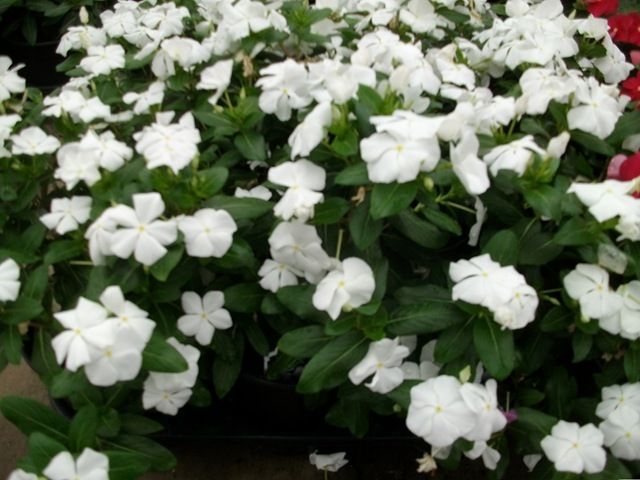 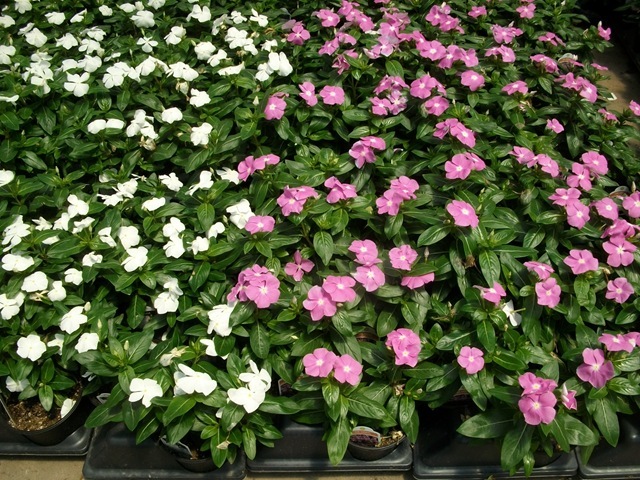 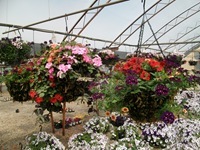 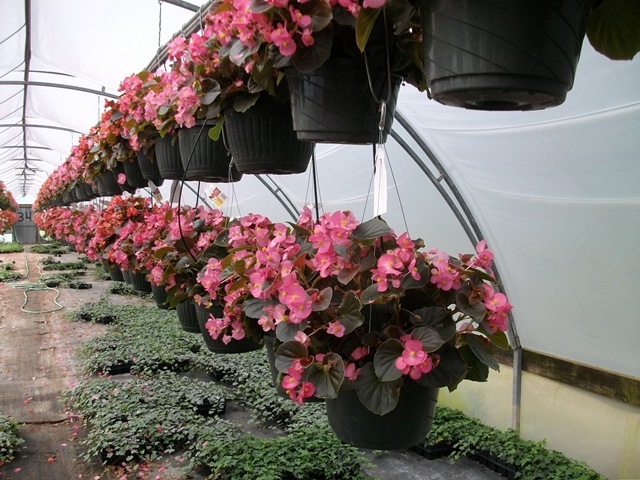 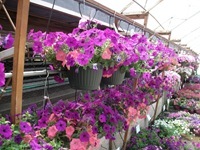 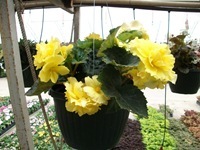 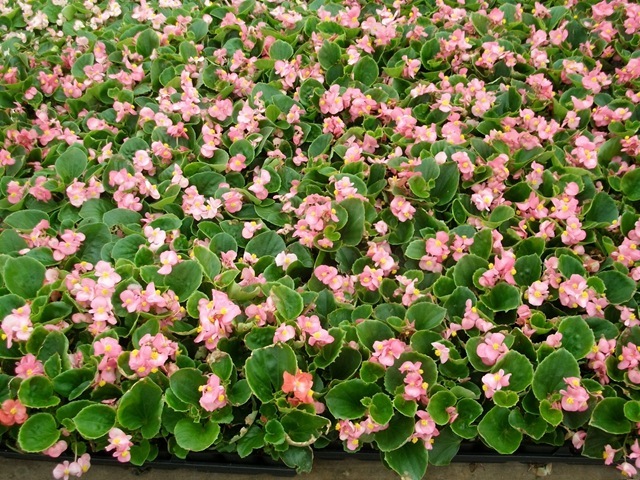 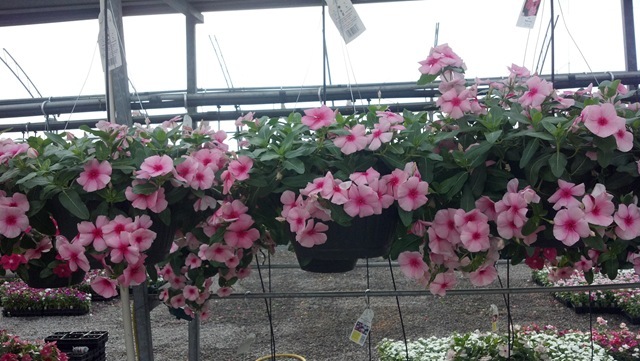 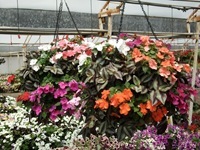 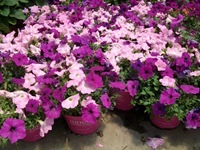 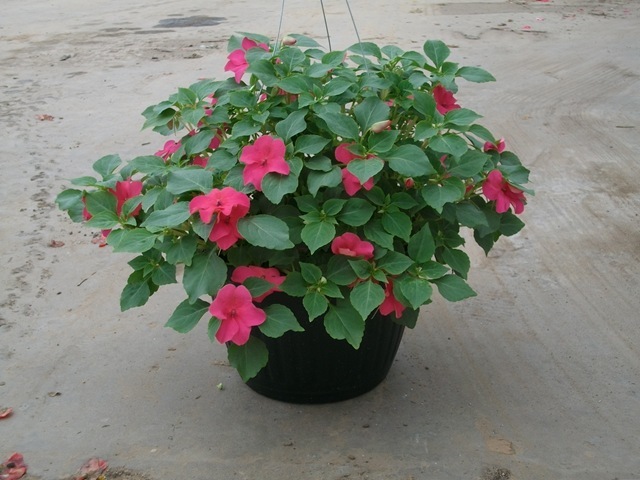 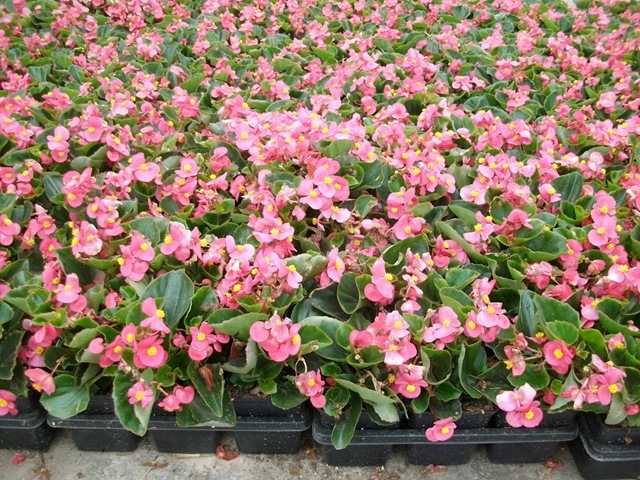 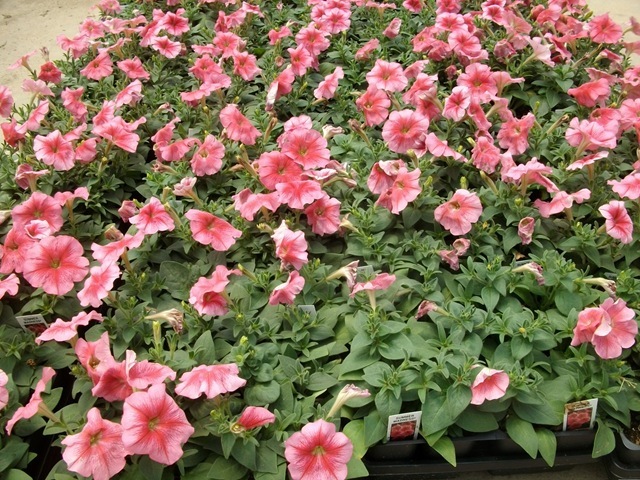 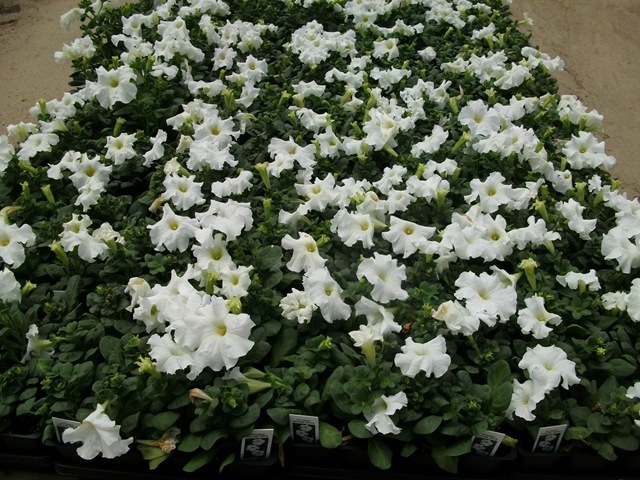 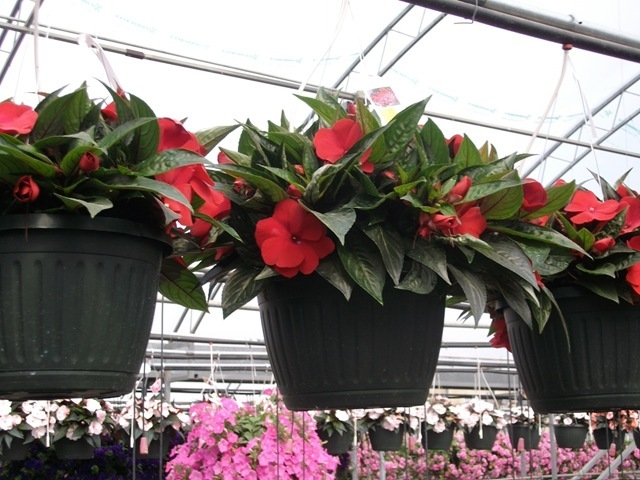 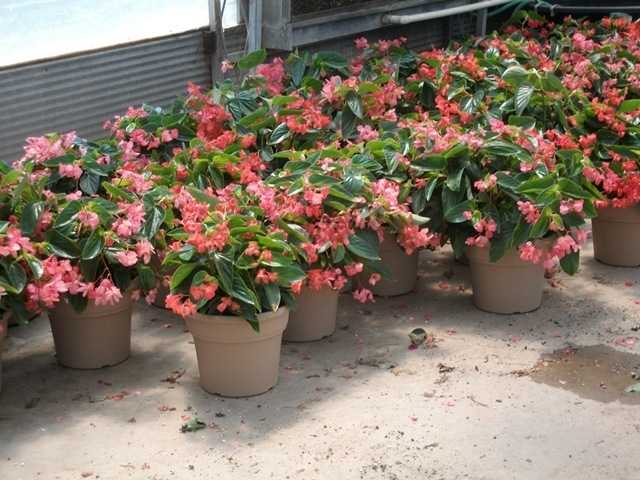 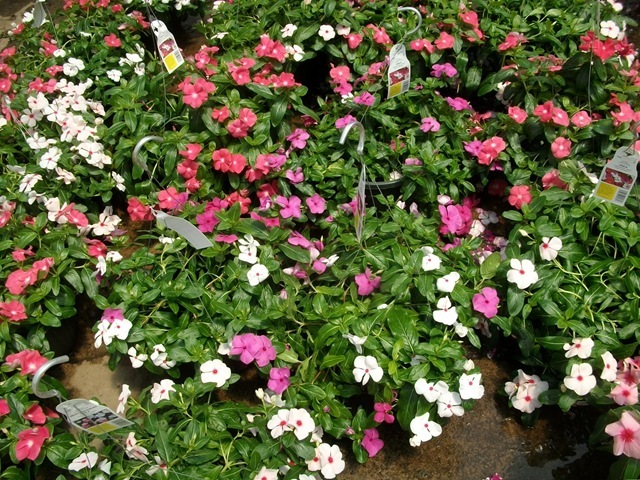 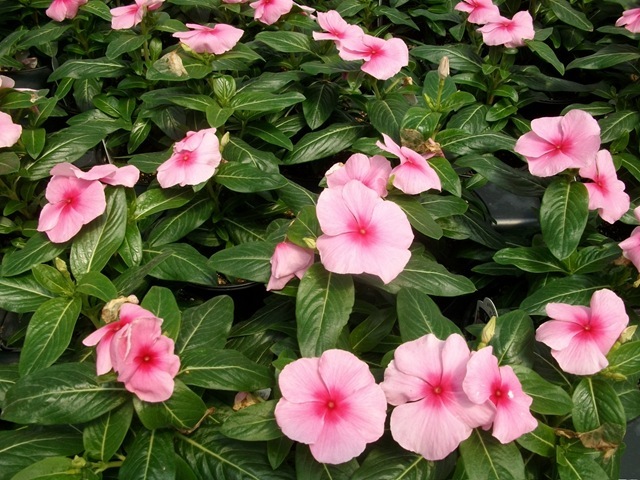 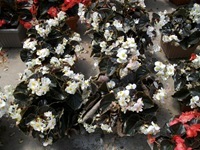 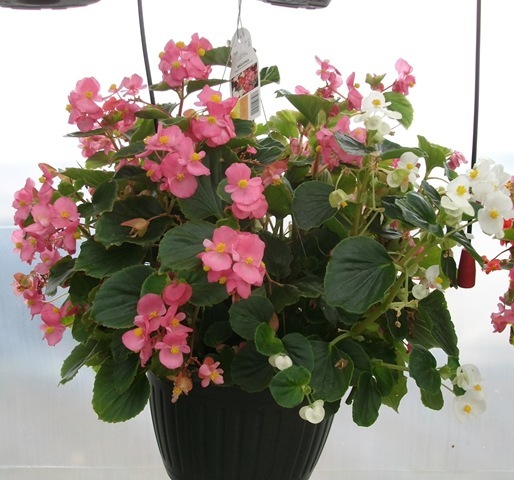 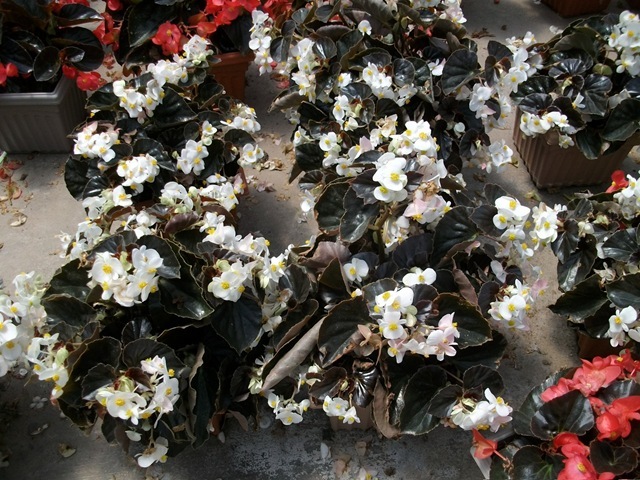 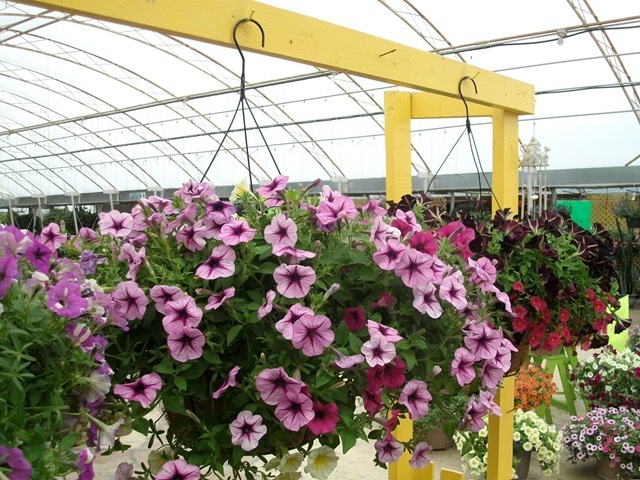 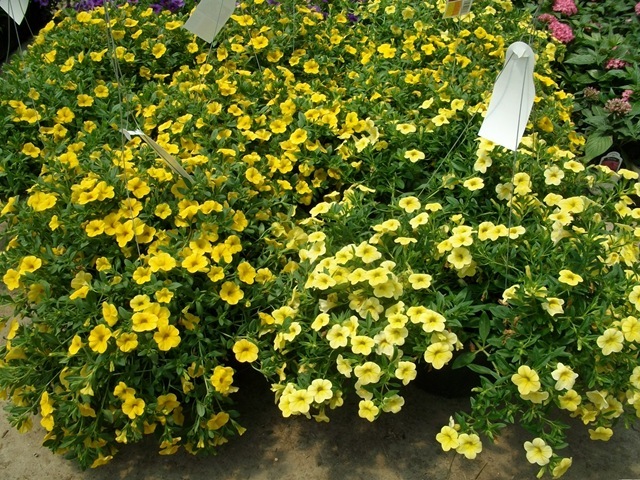 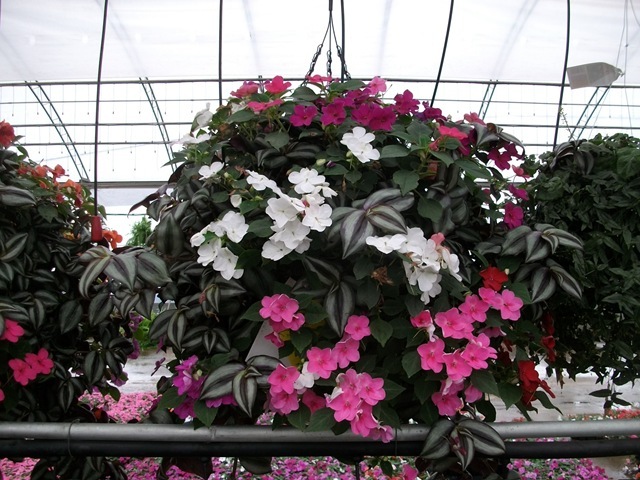 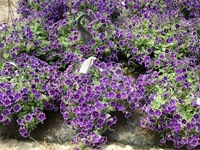 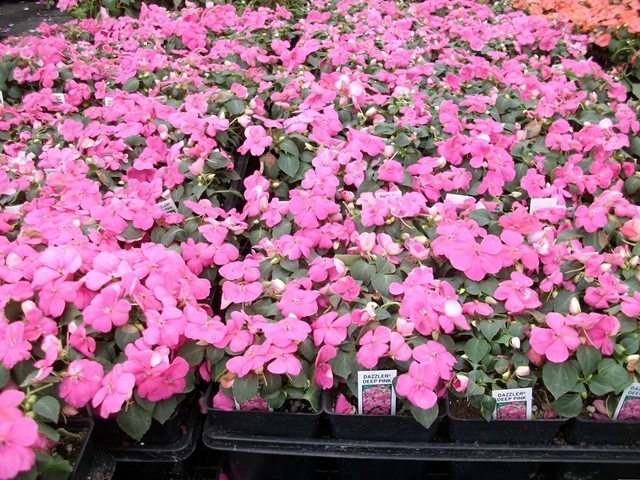 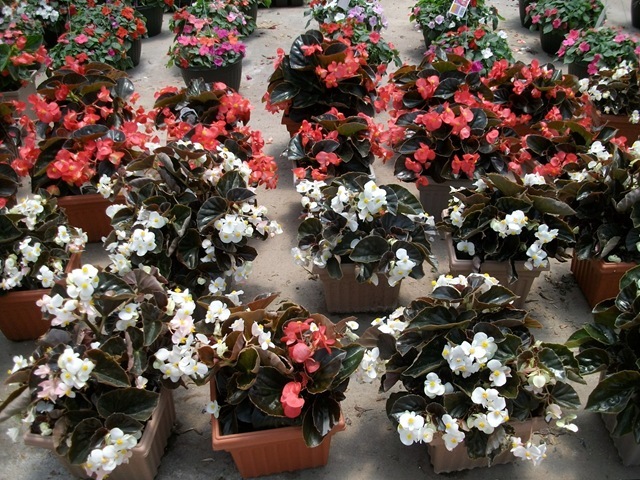 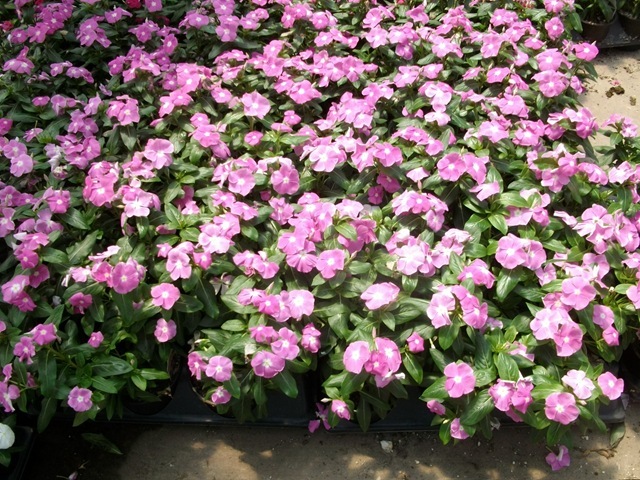 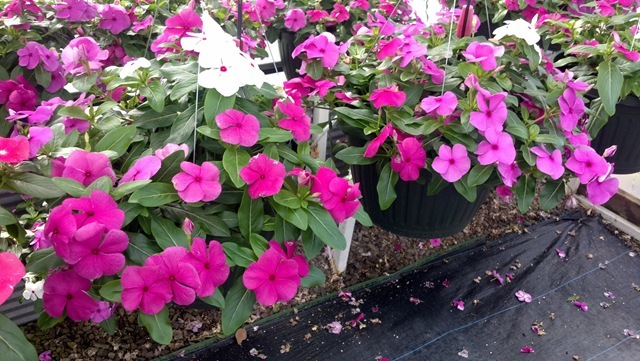 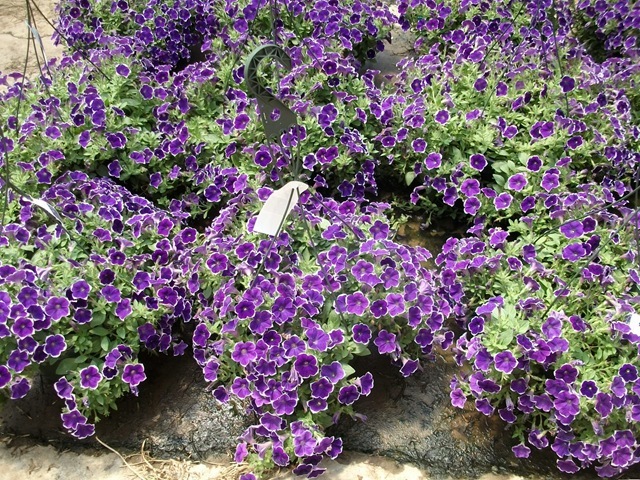 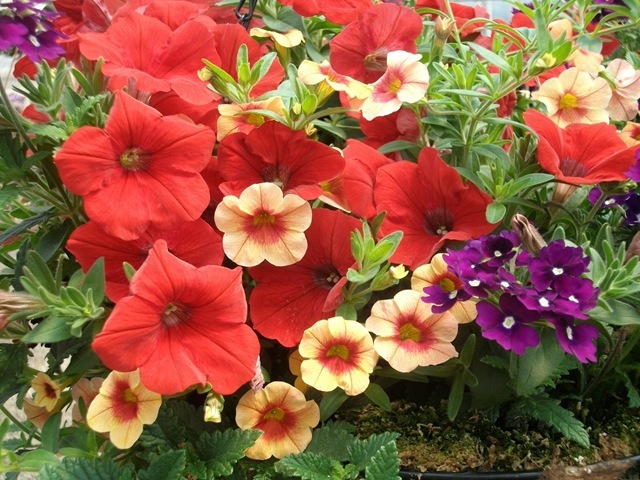 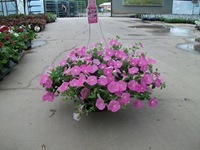 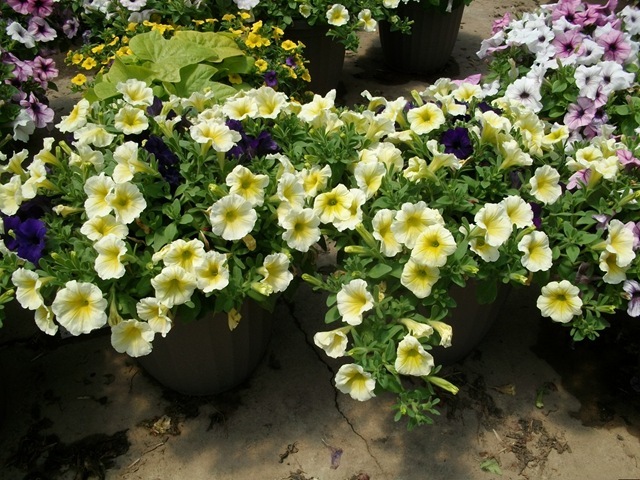 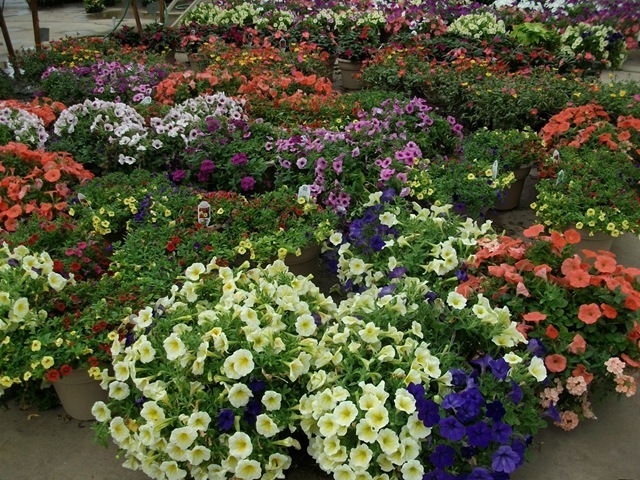 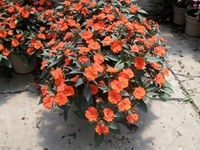 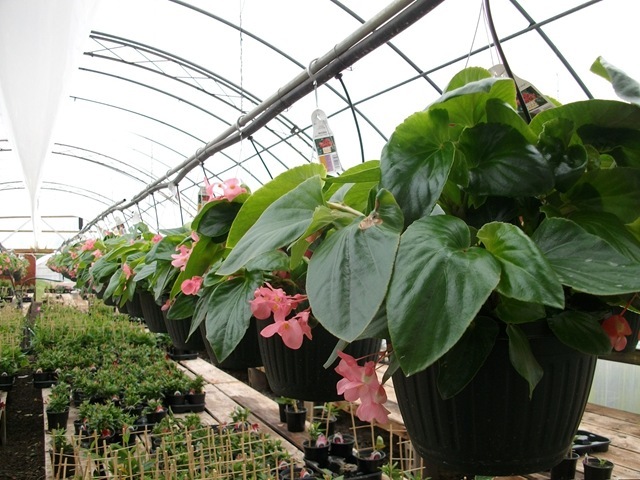 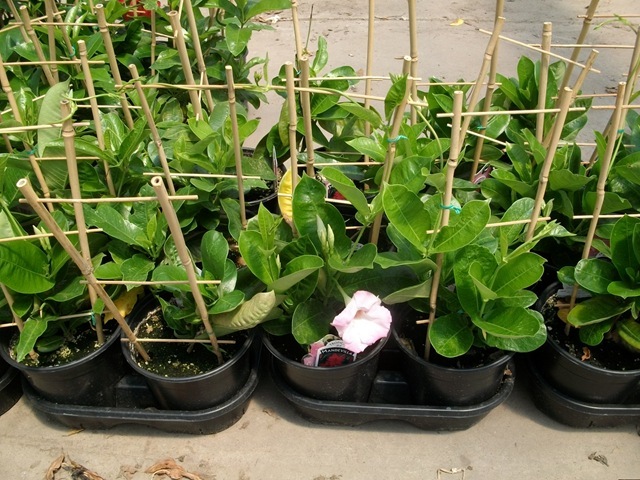 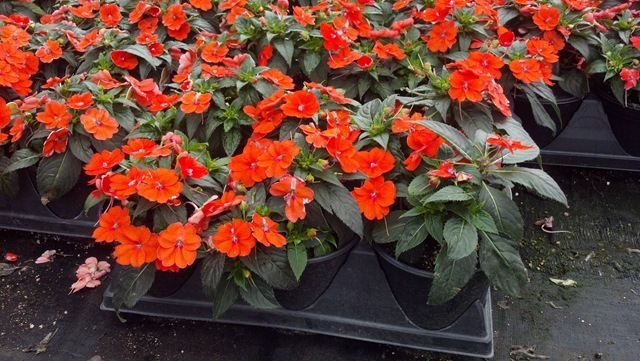 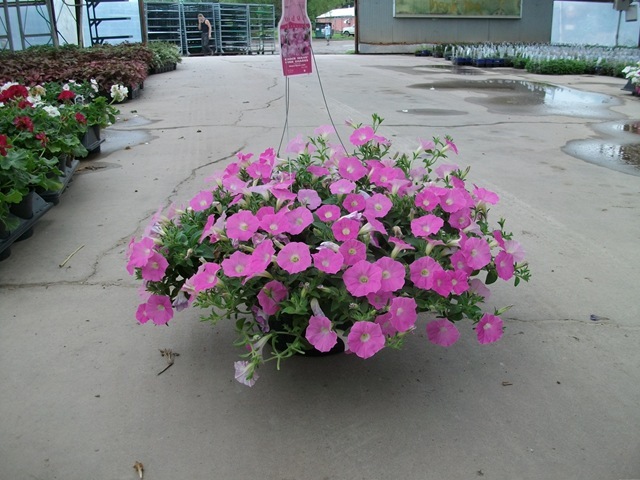 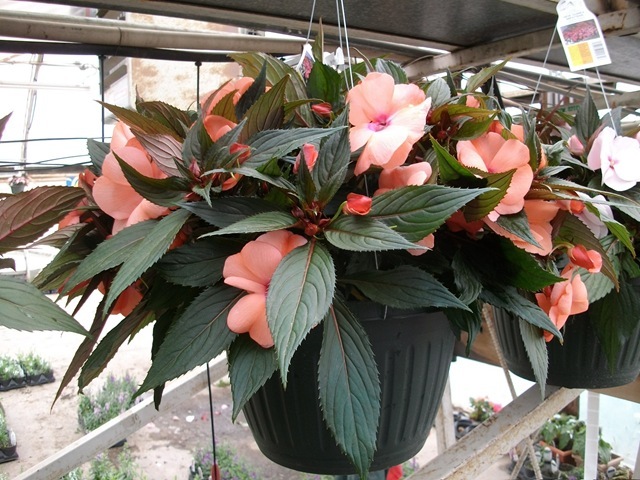 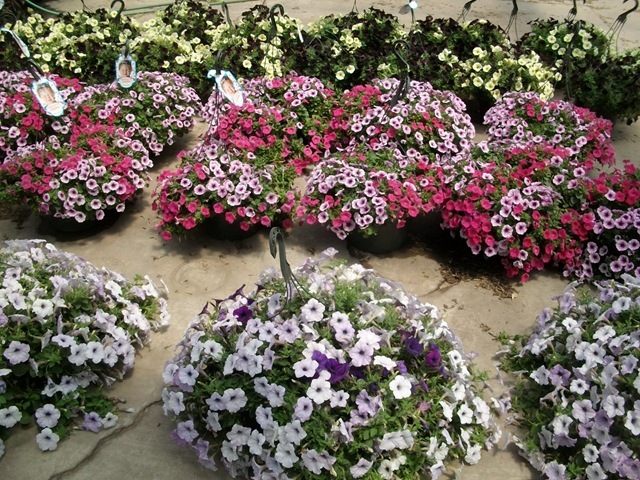 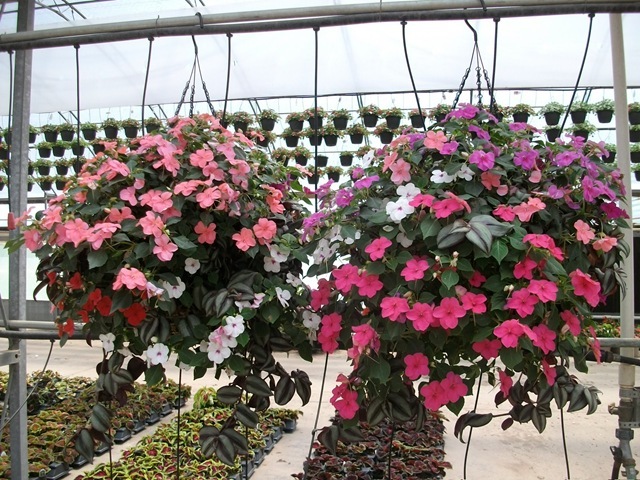 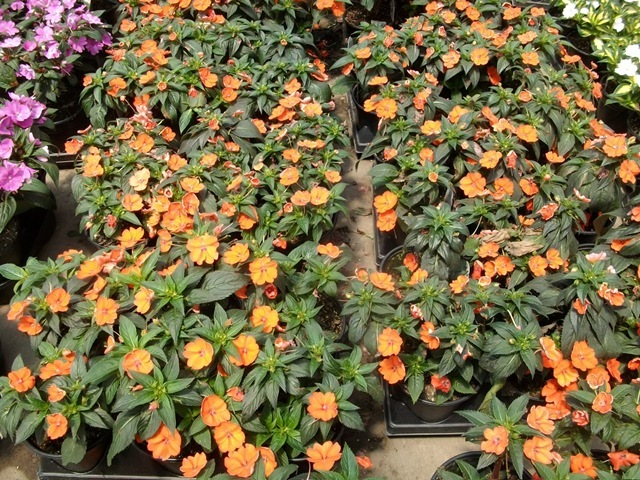 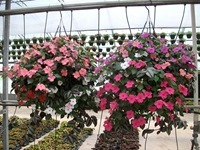 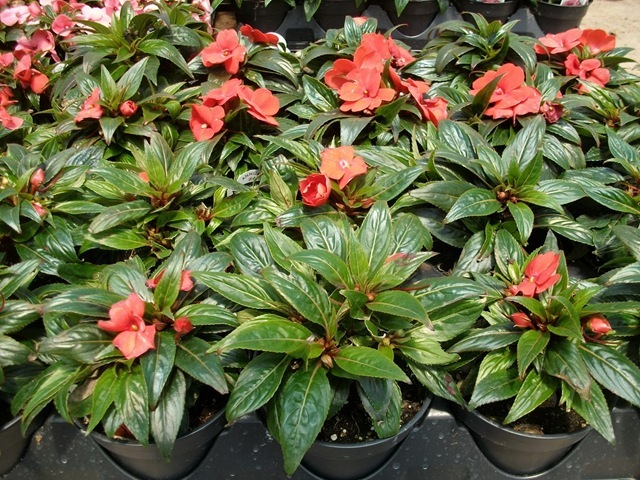 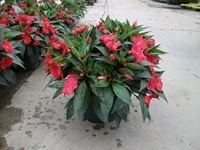 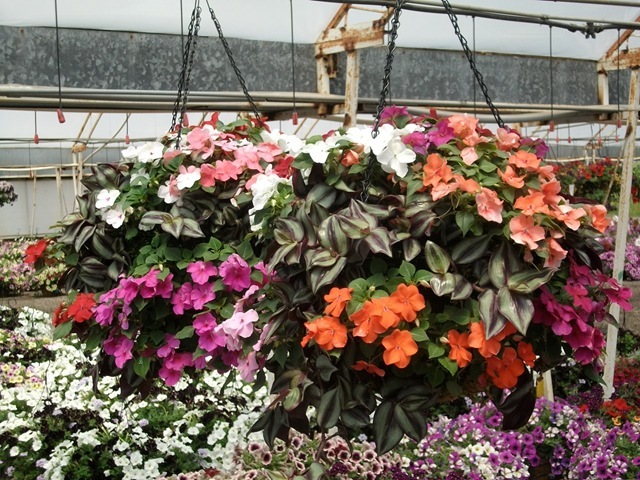 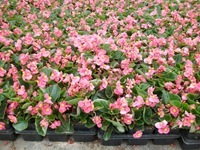 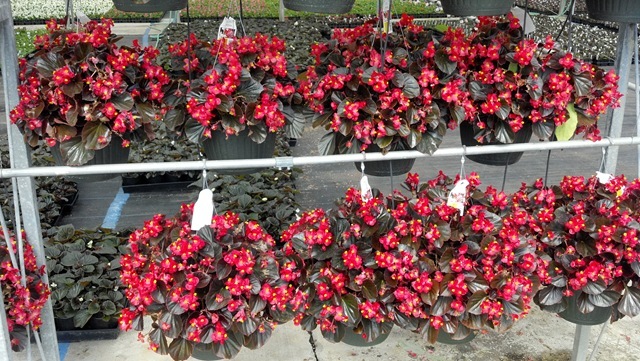 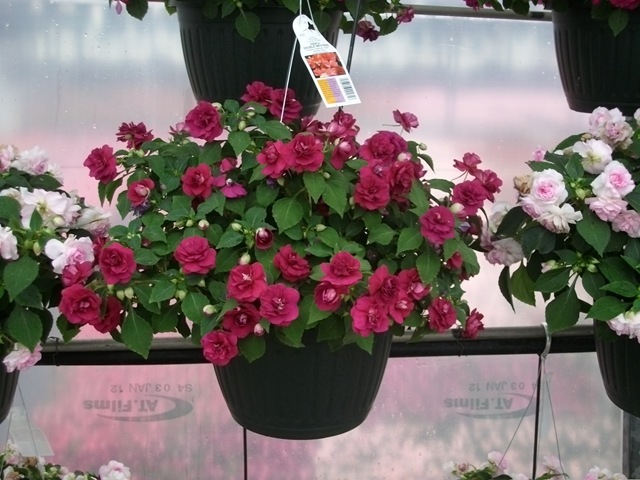 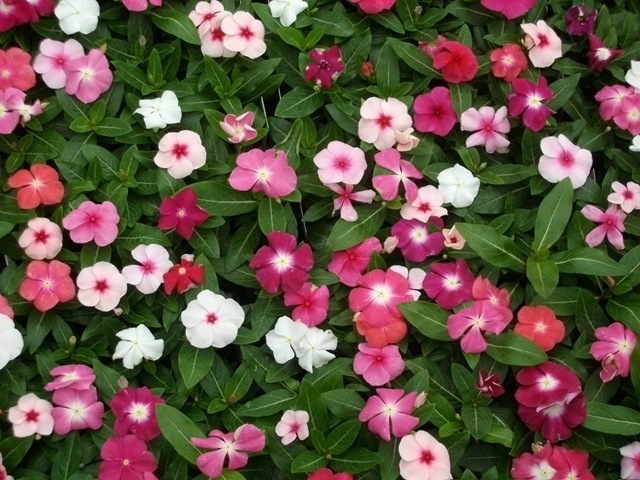 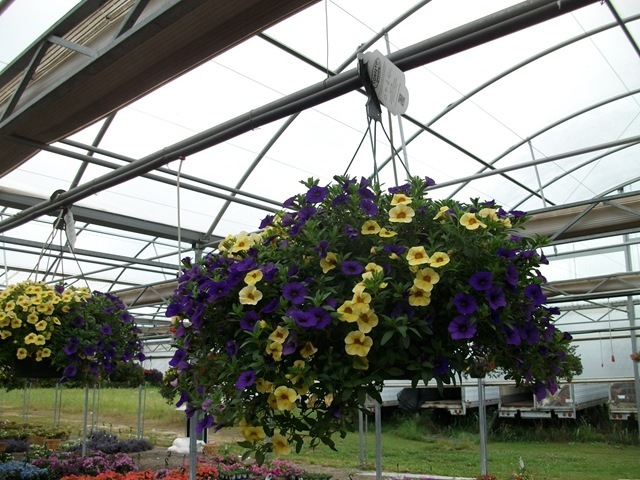 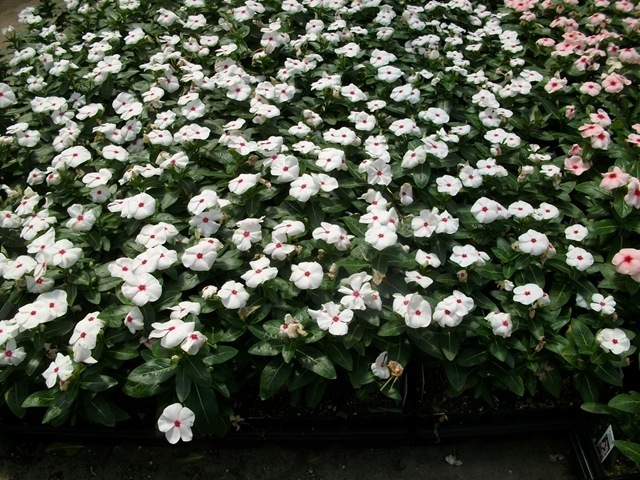 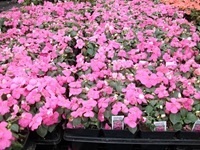 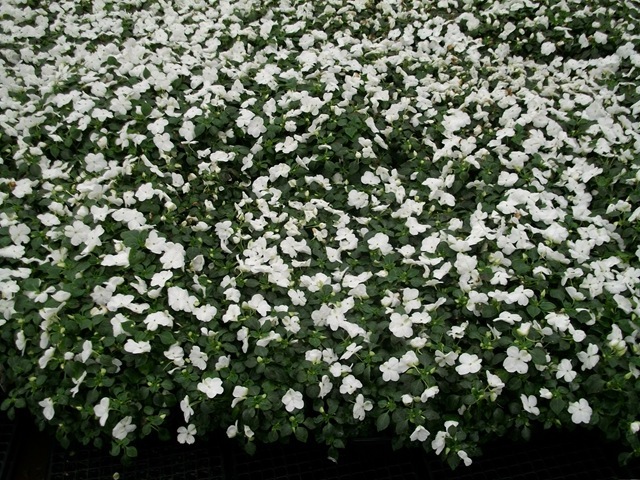 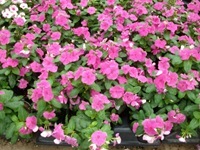 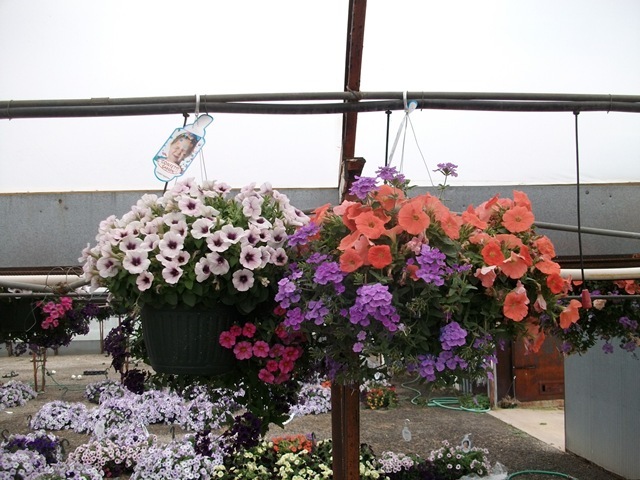 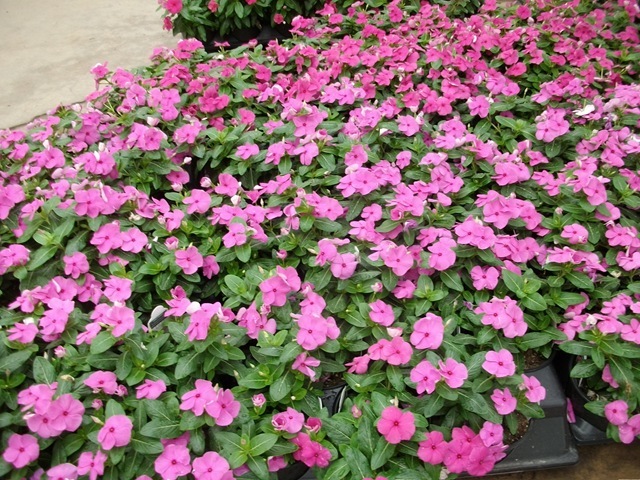 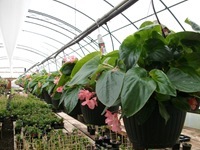 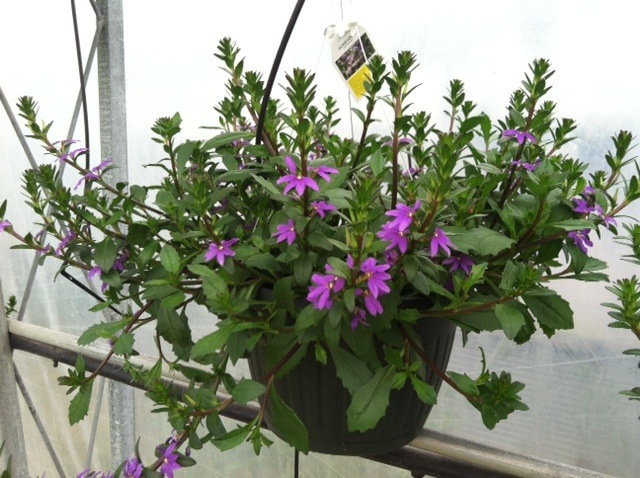 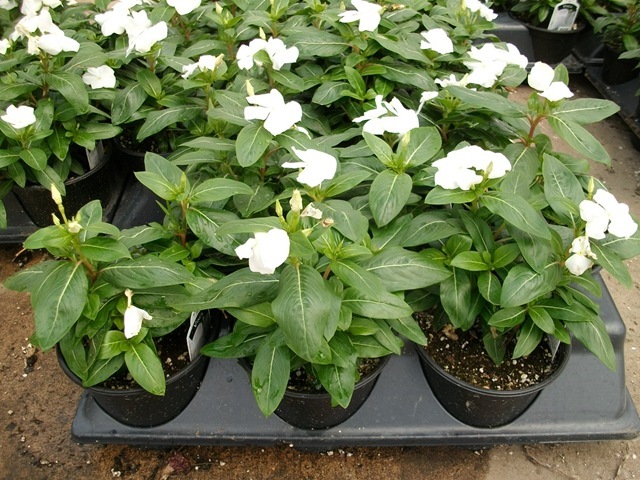 I added in our last basket inventories this week with new inventory for Wave Petunias, Impatiens and Begonia baskets that I forgot about last week. 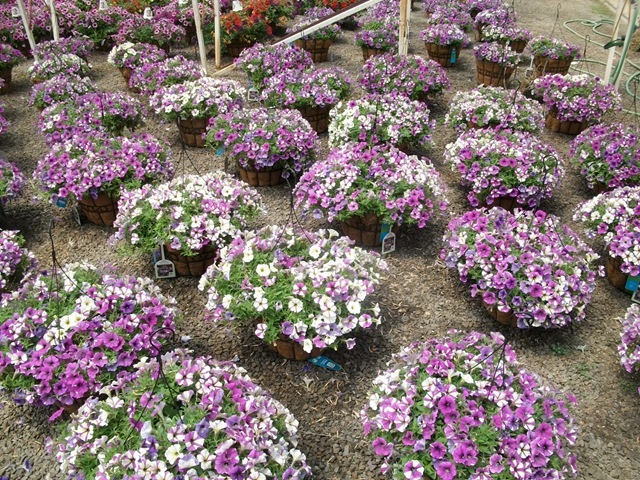 They all are just now ready and look great. 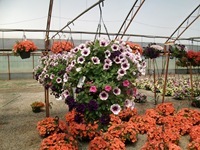 As for every thing else, we are going though it all today and grading out the bad and tossing it so that we can keep our quality up. We will continue to do this as we finish out the spring. 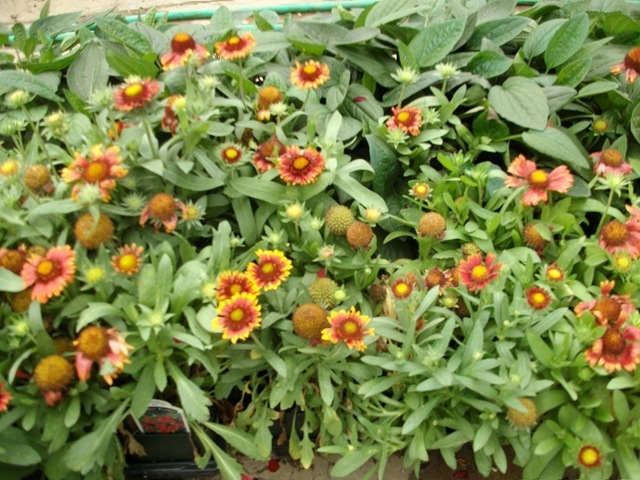 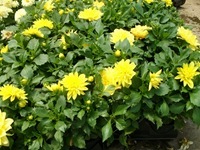 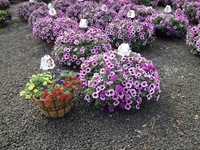 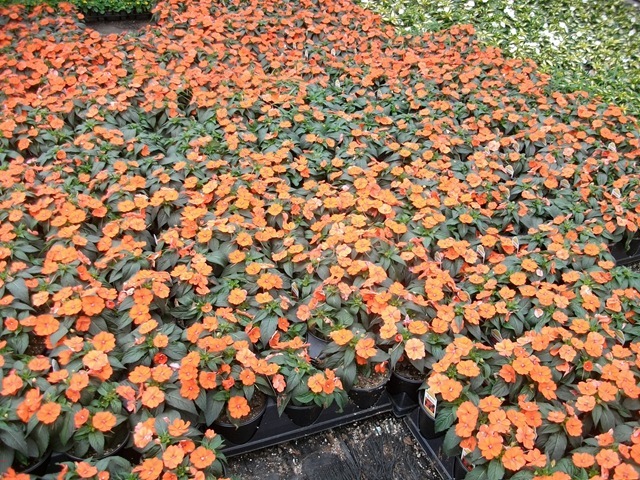 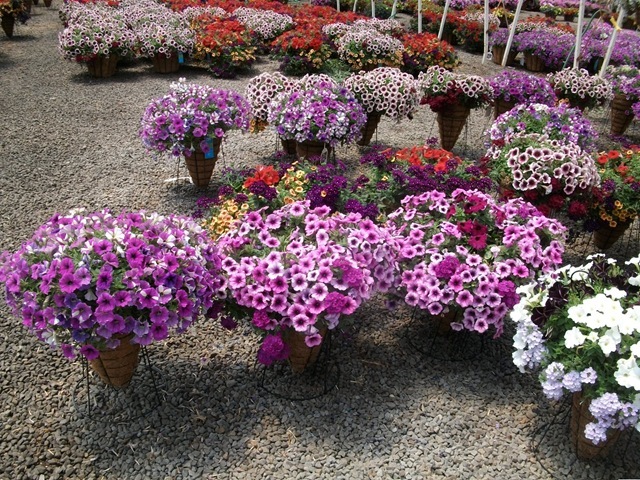 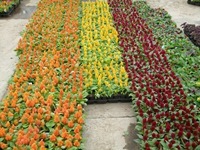 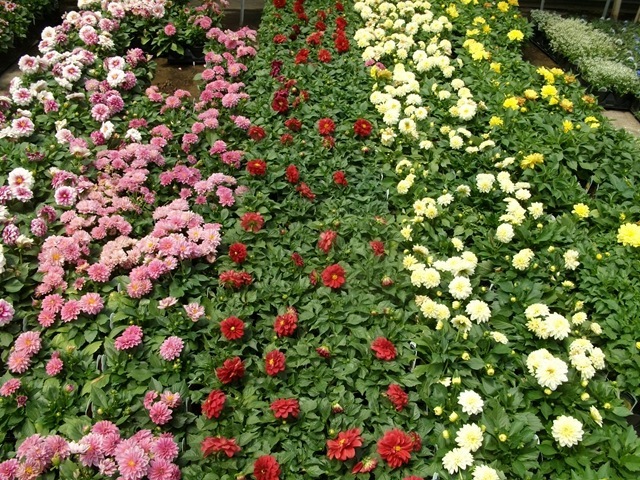 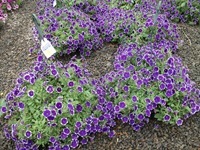 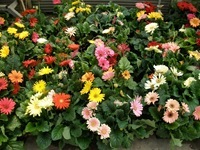 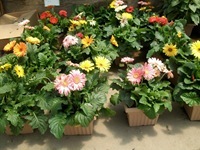 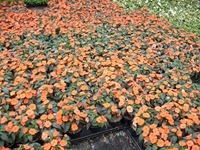 We are also ready for fall so don’t for get to book any mums or pansies you will need for fall. 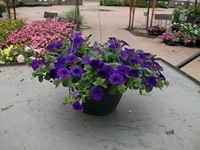 You can contact your sales rep for a item list and prices. 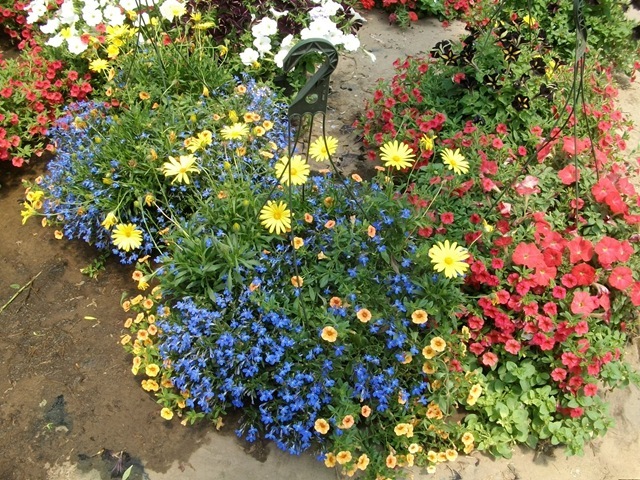 From the way we were so busy here and from what a lot of you have told us, we all made up some lost ground this week. Typically for us the week after Mother’s Day is when we get to catch our breath. 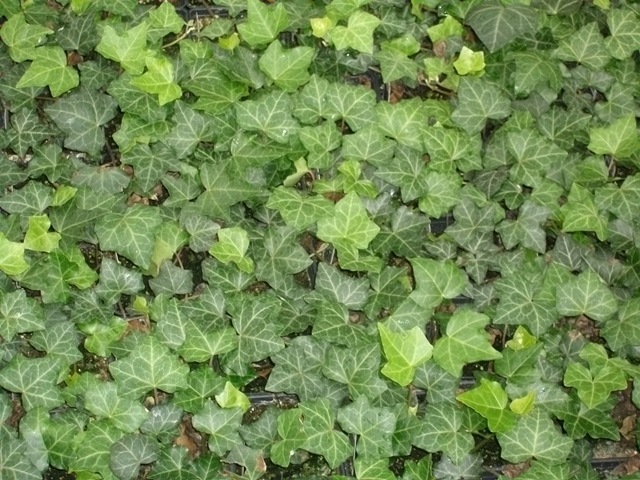 Not so much this week. 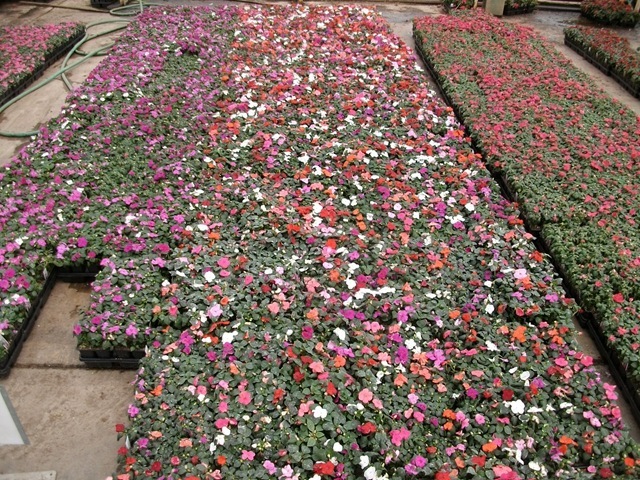 We weren’t here that late but we had to work overtime to get all the orders out. 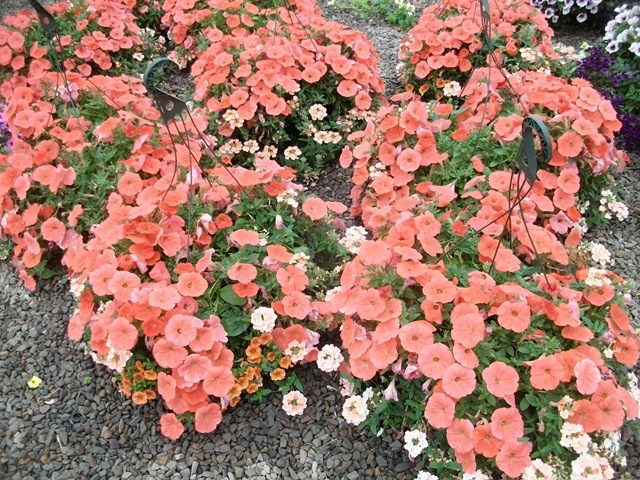 I hope you all had the same kind of week and have a busier weekend. 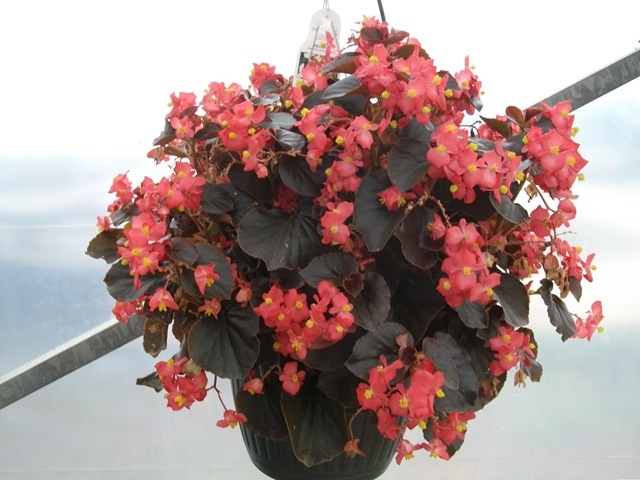 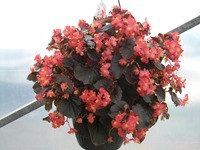 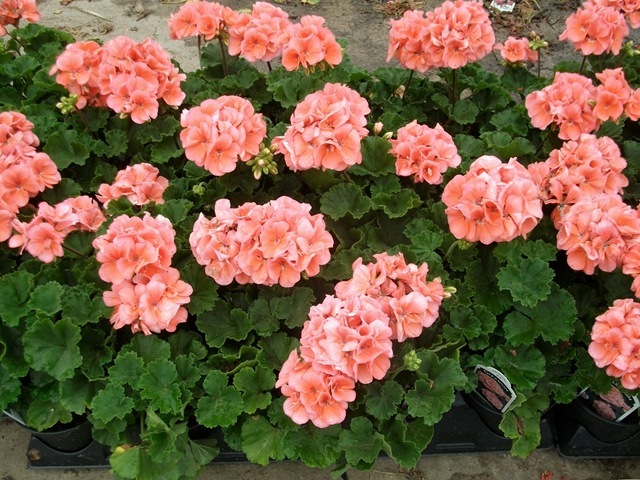 Regarding our inventory, as far as I know we have everything keyed in except for a crop each of 1204 and 1801 begonias and some okra and watermelon that are all growing really slowly for some reason. 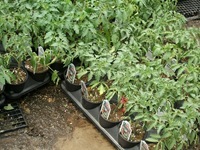 With everything else, what you see in inventory is what we have left. 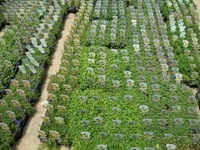 Now I also need to tell you that we have cut some product back that will fill back out and be keyed back in over the next 2-3 weeks. 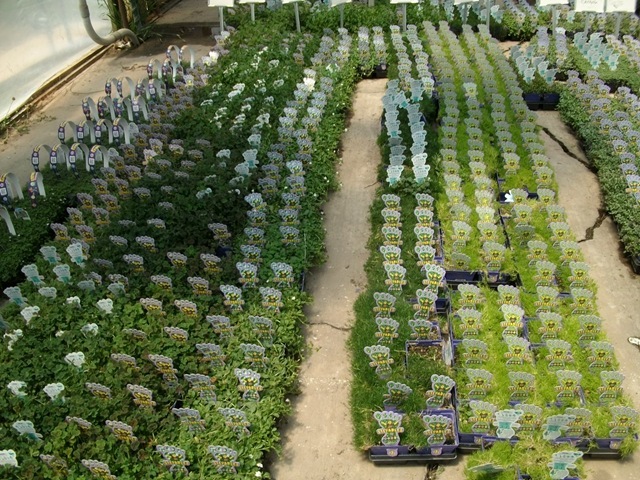 It’s not a lot of product but it is some of the more popular items. 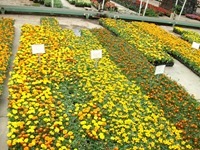 I can’t believe I am already saying this but mums come in a couple of weeks so we will be getting started on fall production soon. 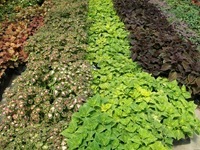 If you want to or need to, now is the time to book you fall orders – mums, pansies, kale and all that stuff. 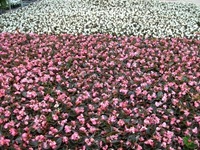 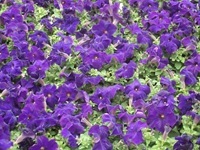 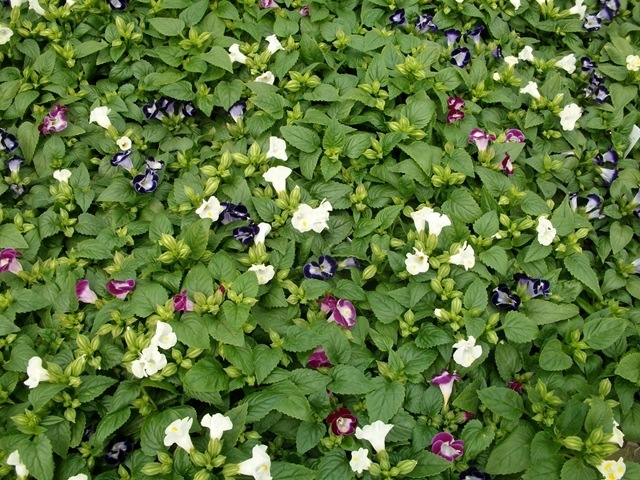 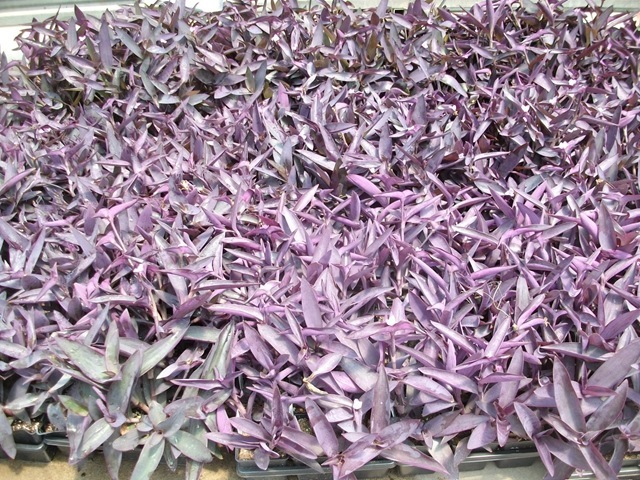 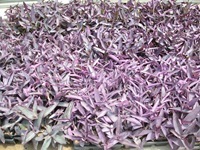 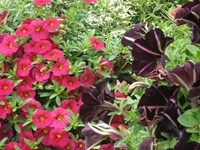 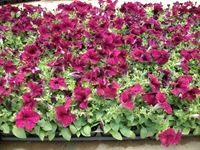 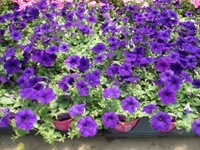 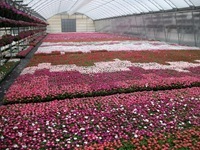 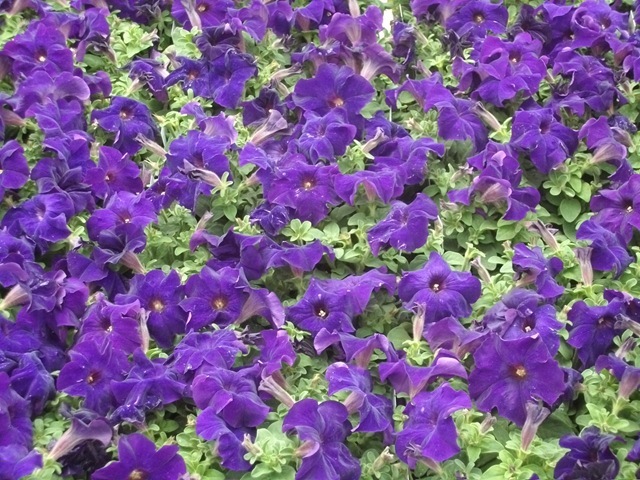 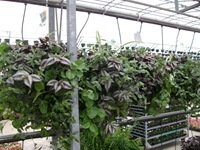 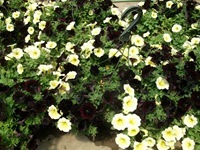 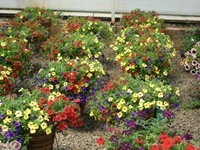 We can do custom growing to meet special requests for pansy colors if you need something we don’t grow. 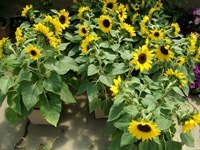 Let us know soon so if you know what you need. In addition to all the colorful products below, we still have tomatoes, cantaloupe, cucumbers, okra, squash and watermelon for all those folks who have not planted their gardens yet. 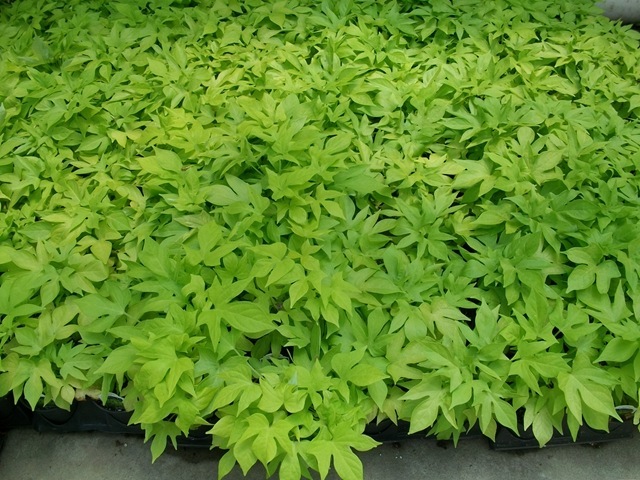 We tried a new product for us at the request of a customer who I thought was going to buy the trials as they got ready so that they could trial them at his stores. Now he is out of the country for 2 weeks and the 14” Moss Baskets he asked for are ready and no one else there seems to know what I am talking about. 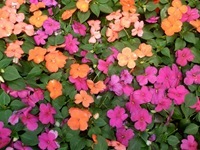 So I wanted to see if you were interested in them. 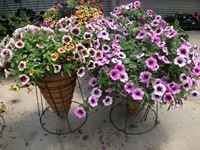 We are selling them for $35 each. 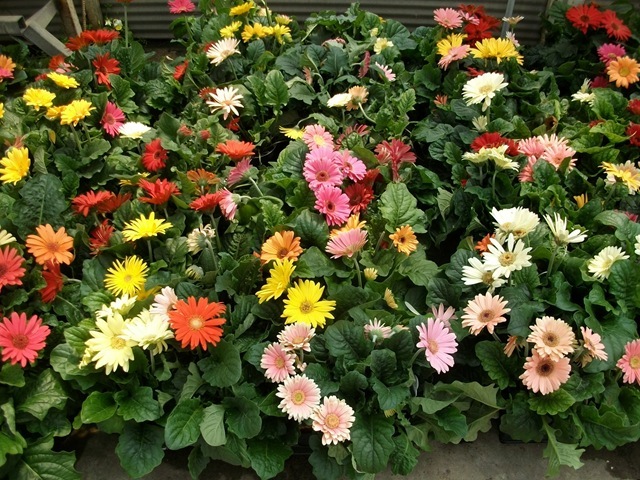 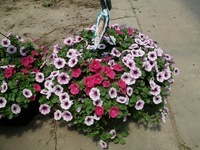 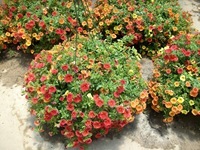 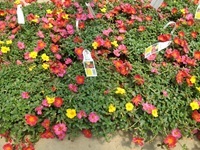 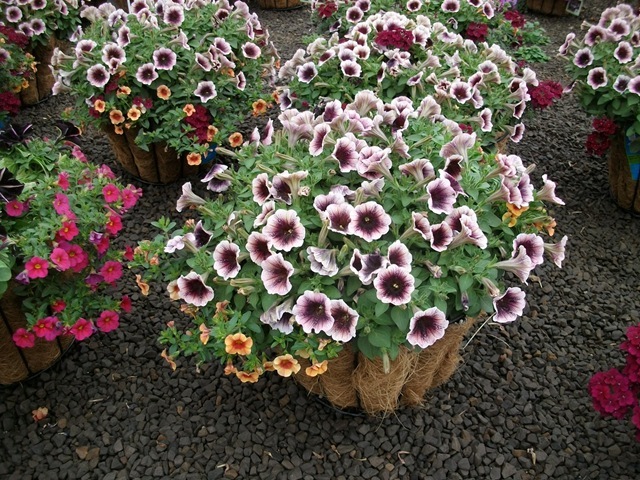 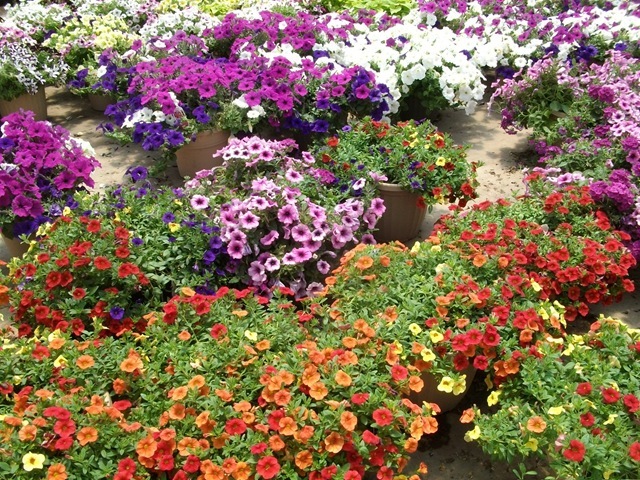 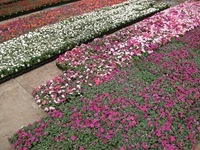 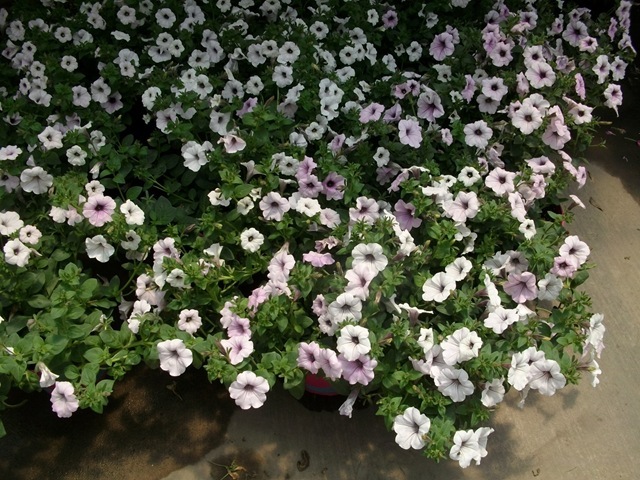 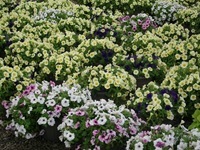 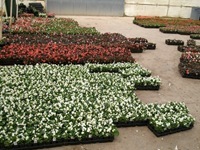 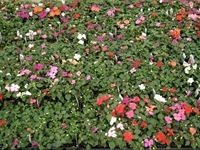 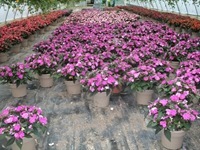 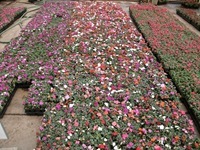 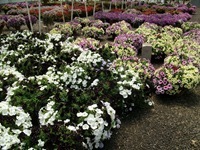 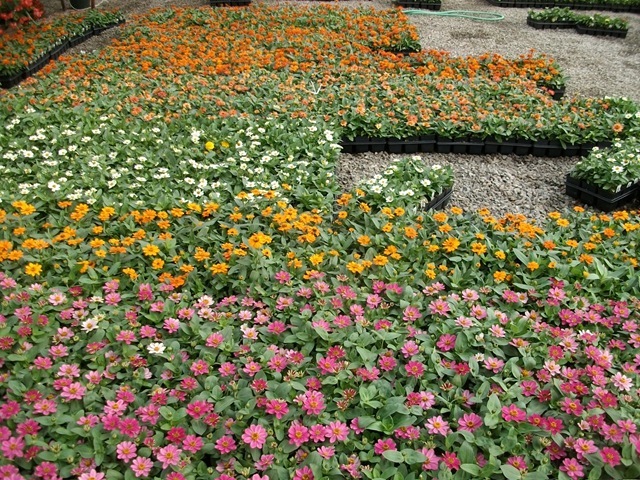 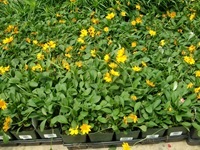 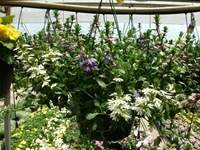 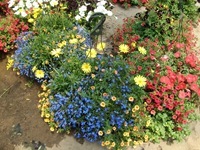 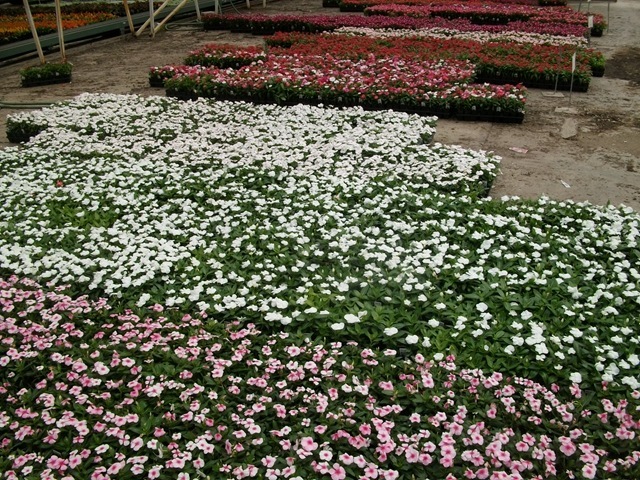 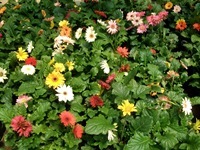 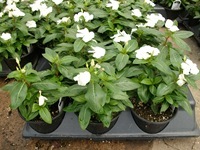 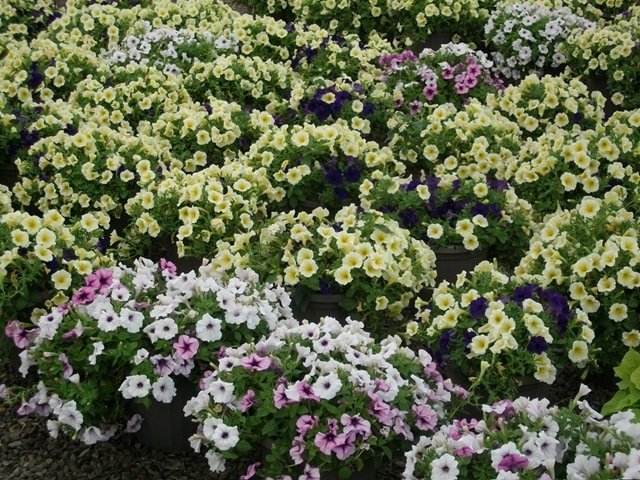 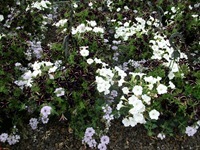 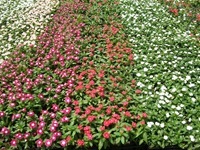 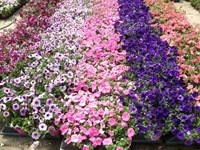 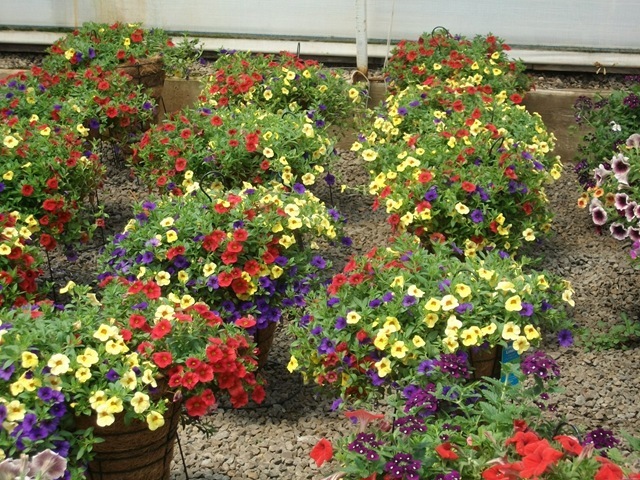 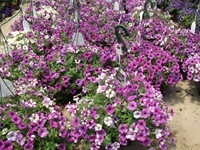 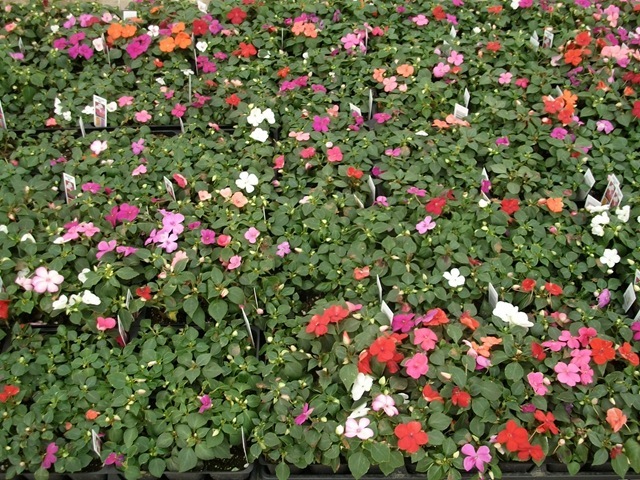 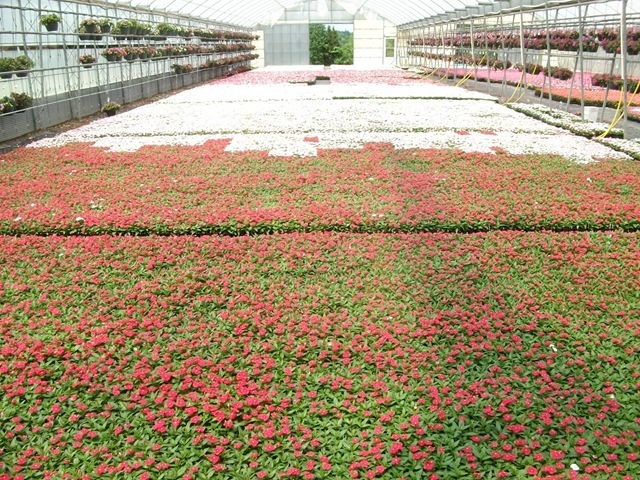 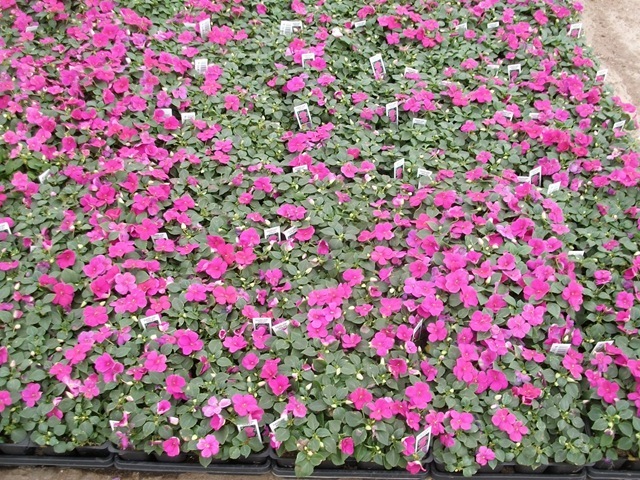 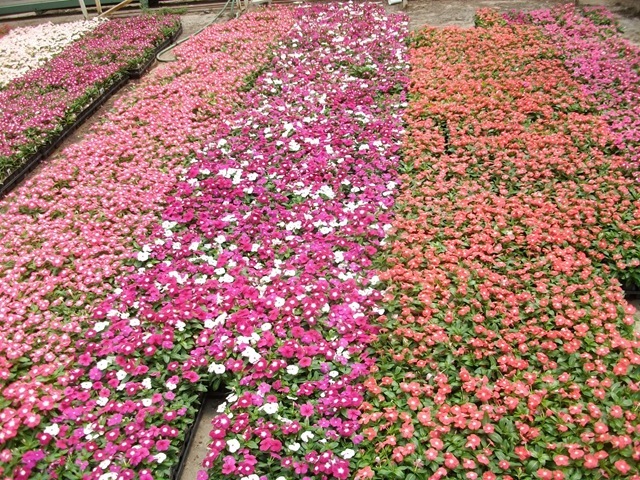 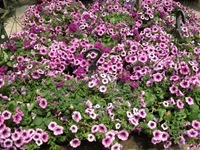 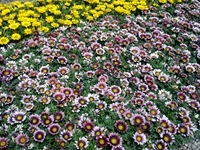 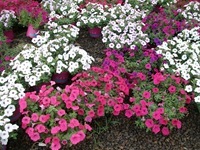 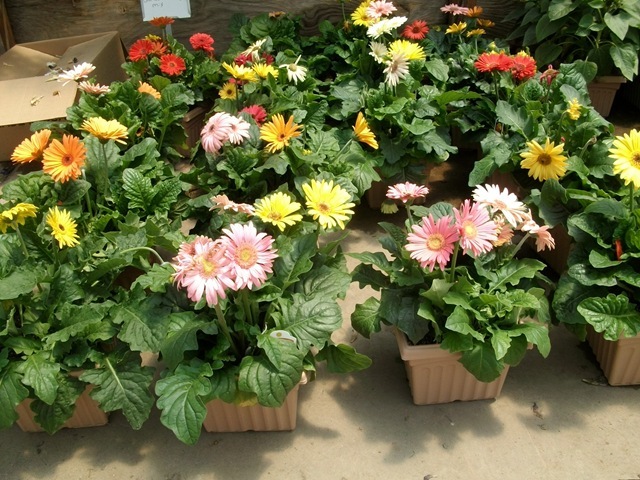 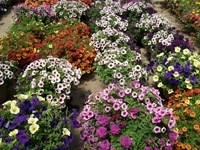 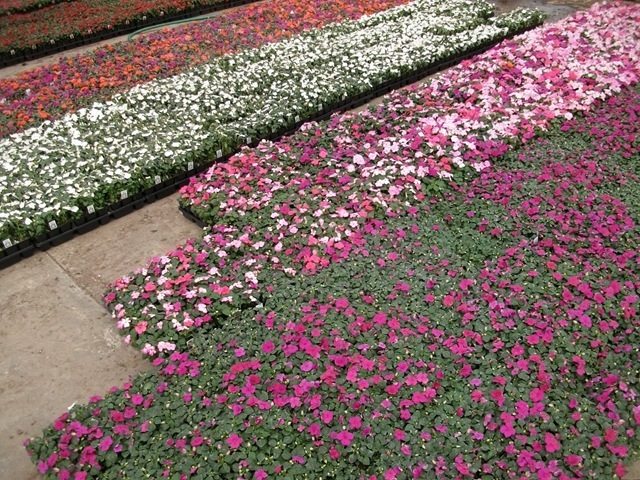 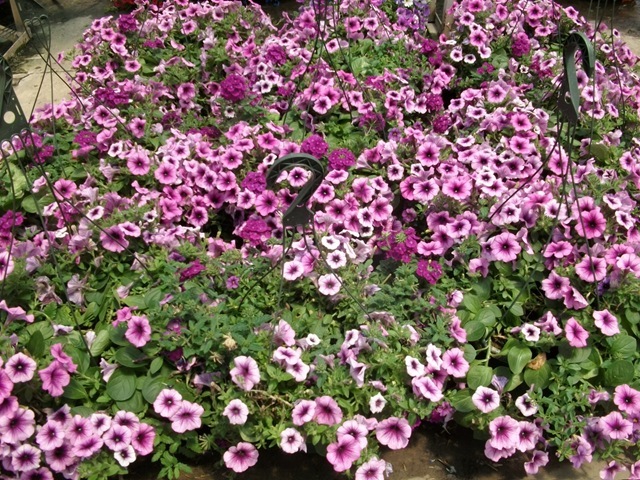 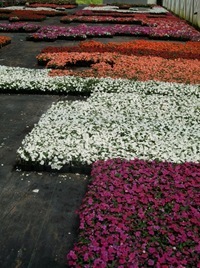 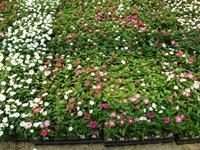 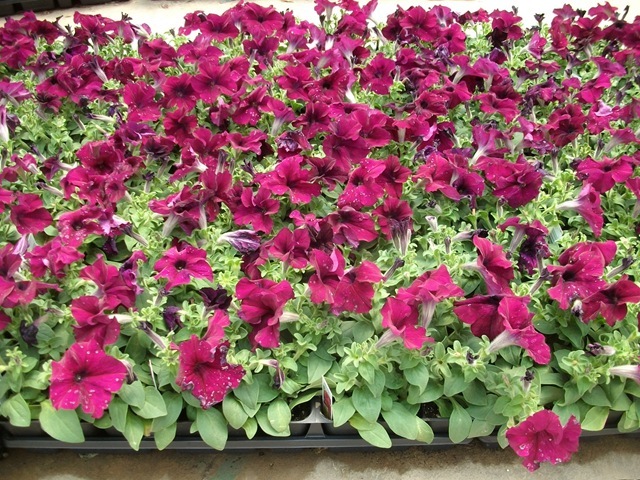 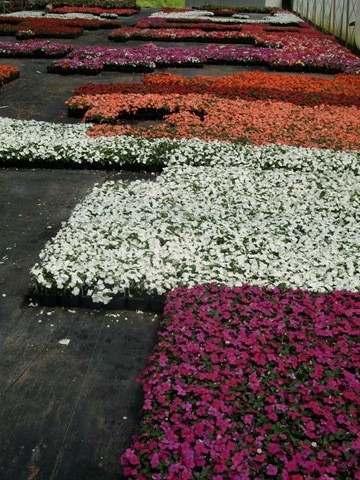 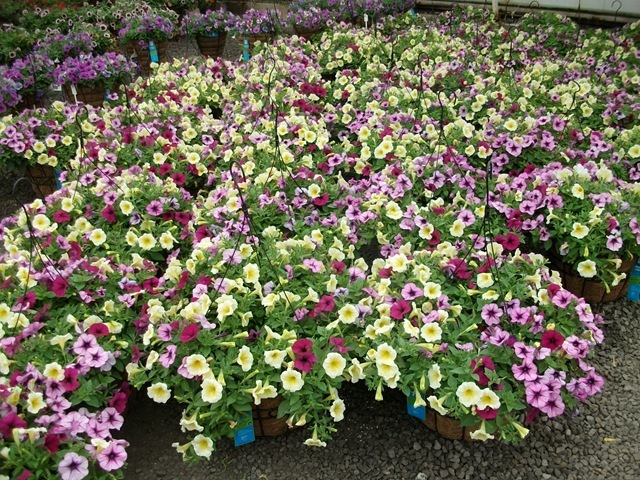 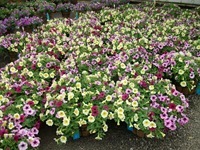 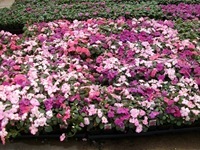 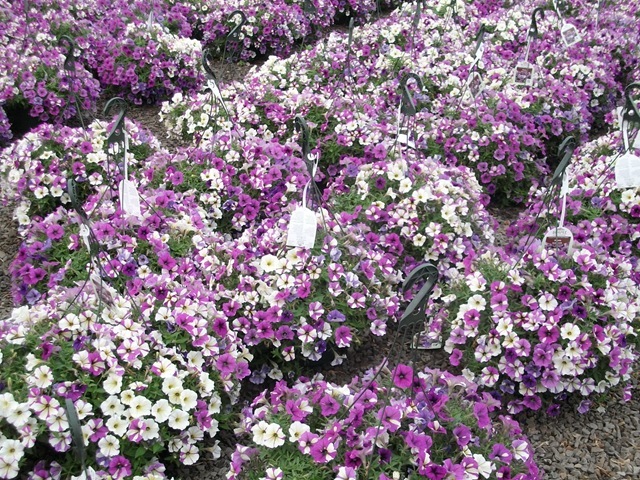 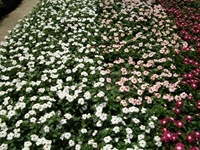 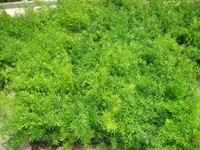 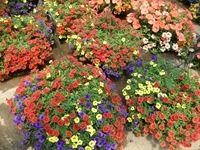 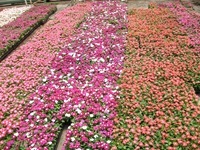 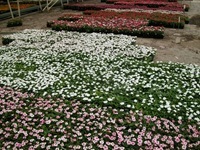 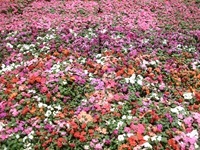 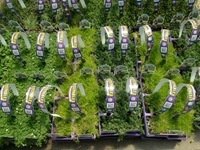 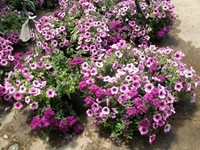 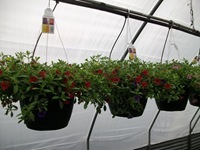 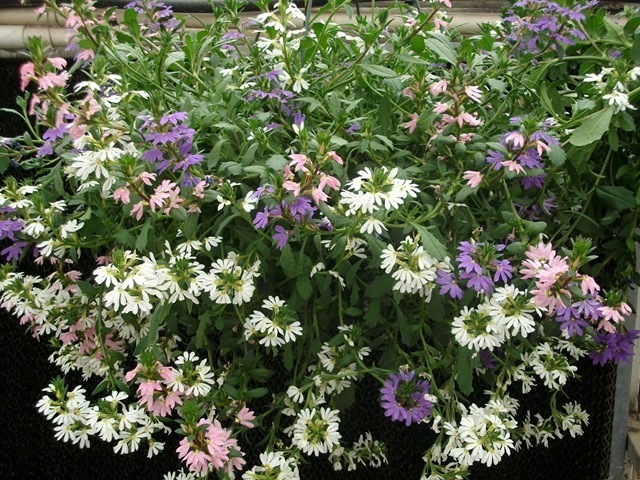 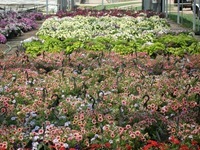 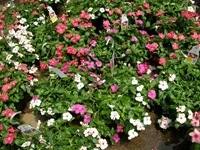 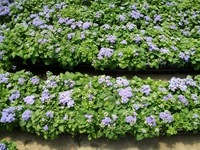 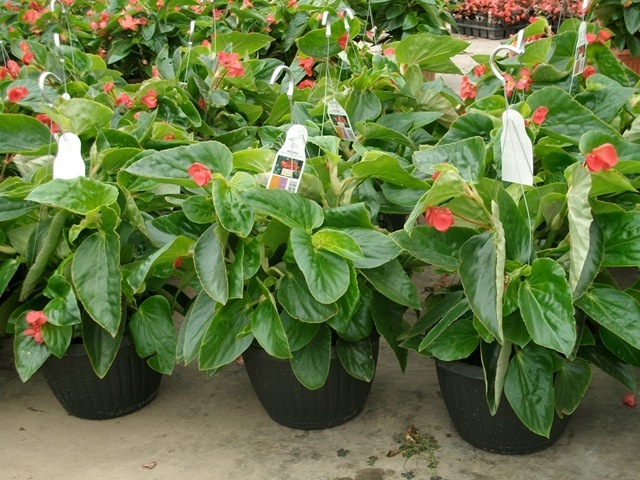 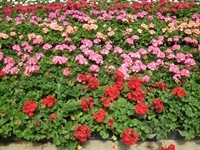 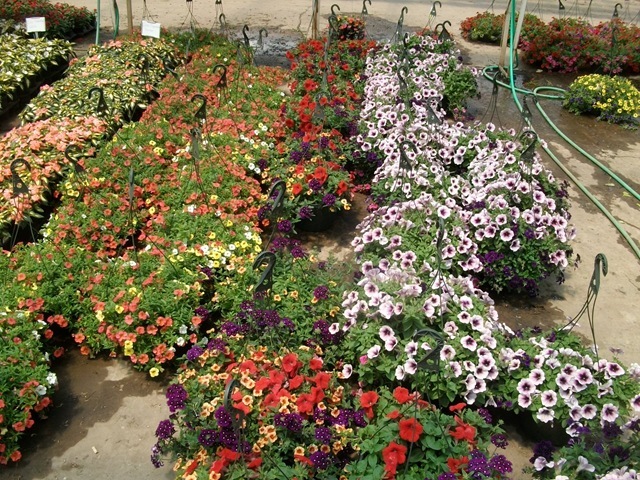 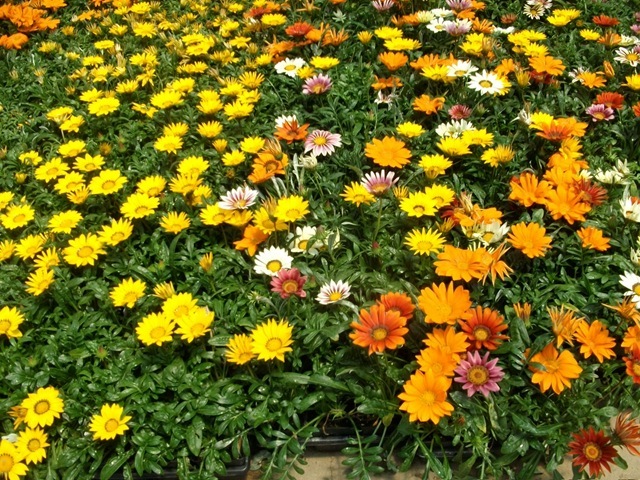 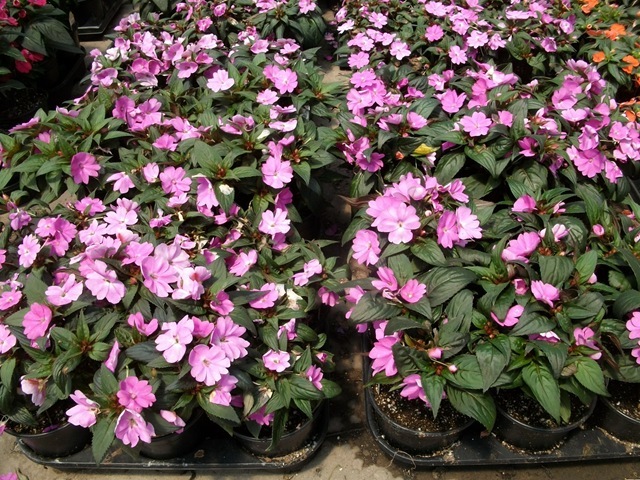 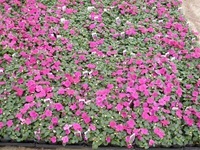 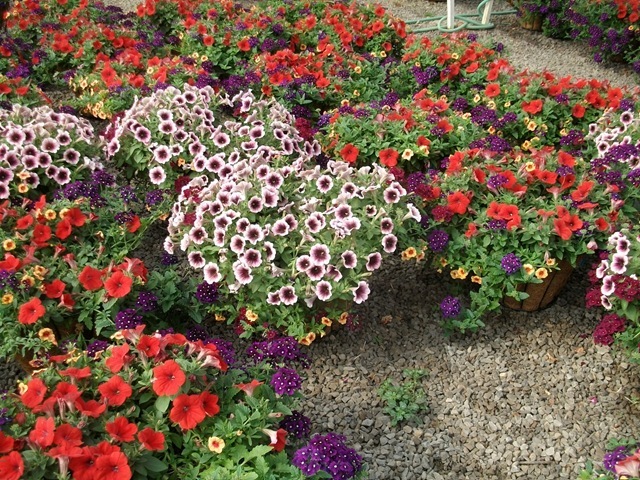 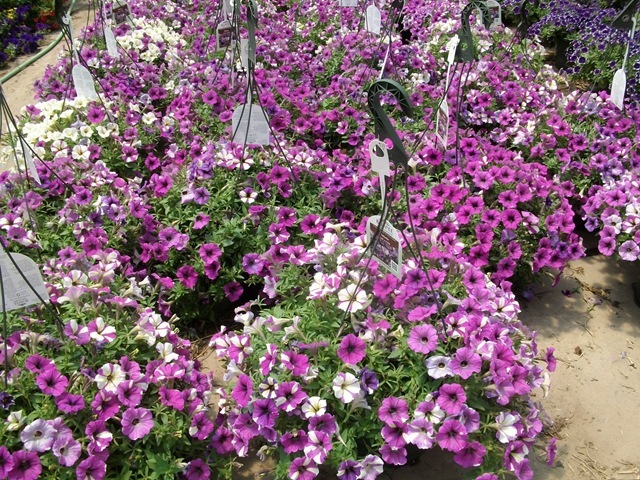 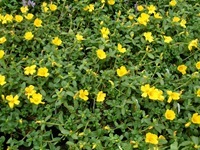 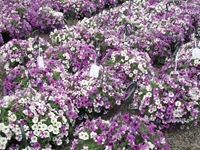 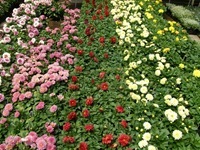 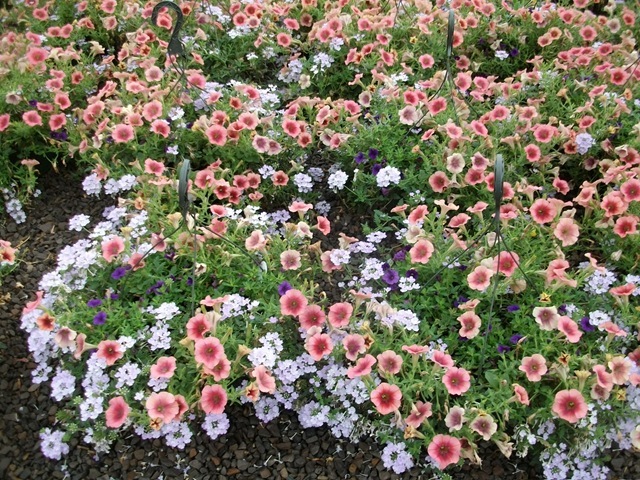 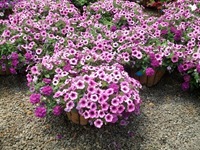 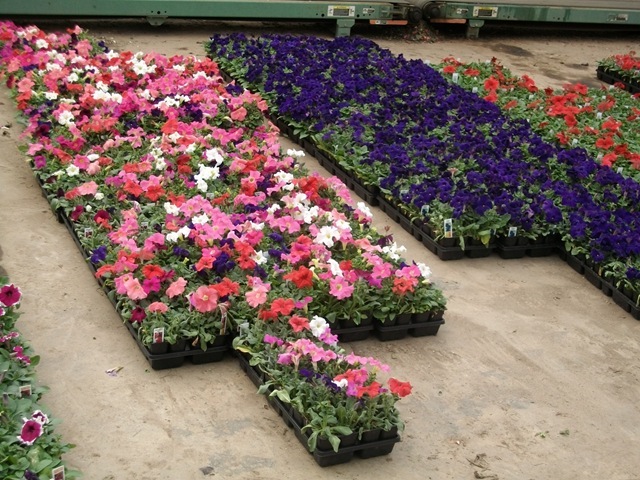 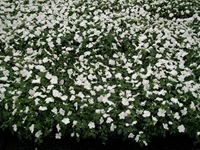 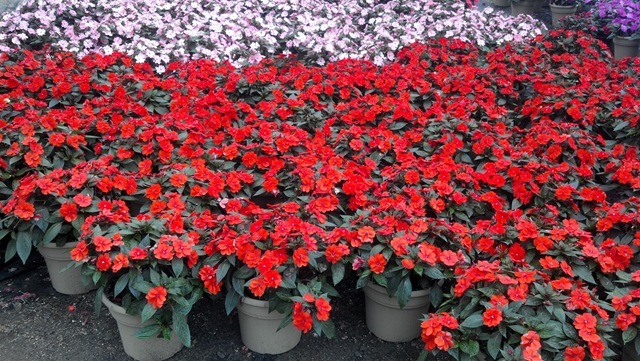 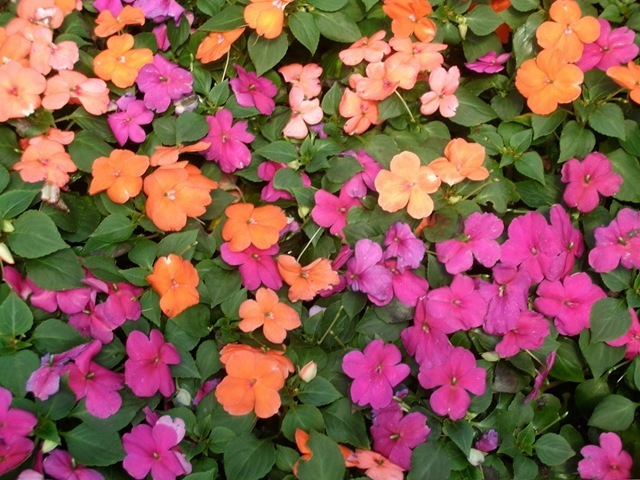 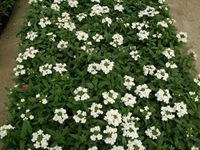 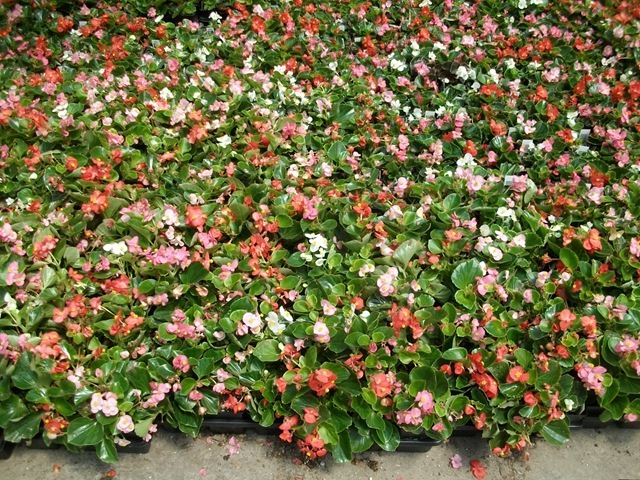 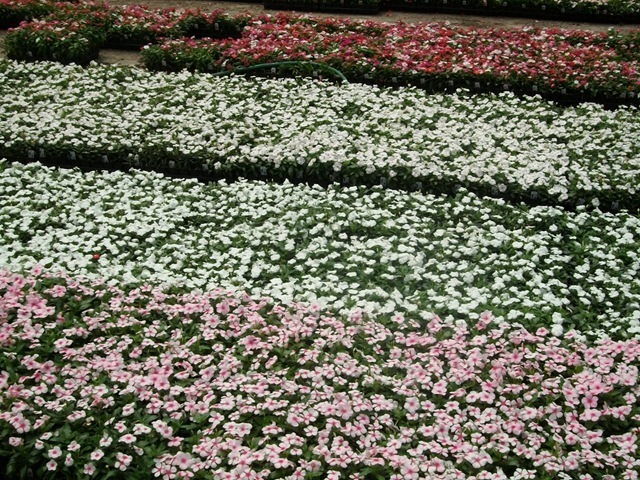 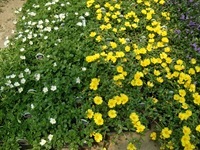 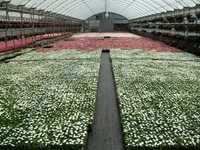 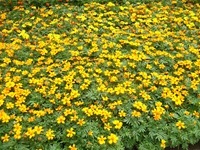 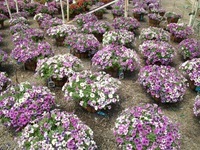 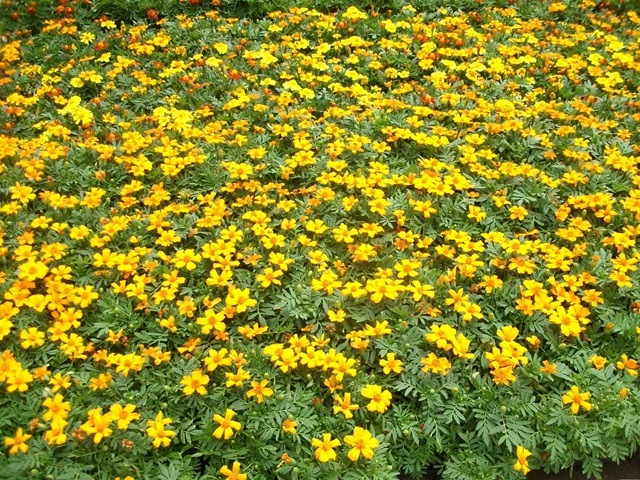 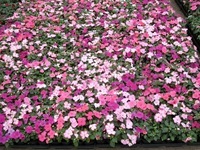 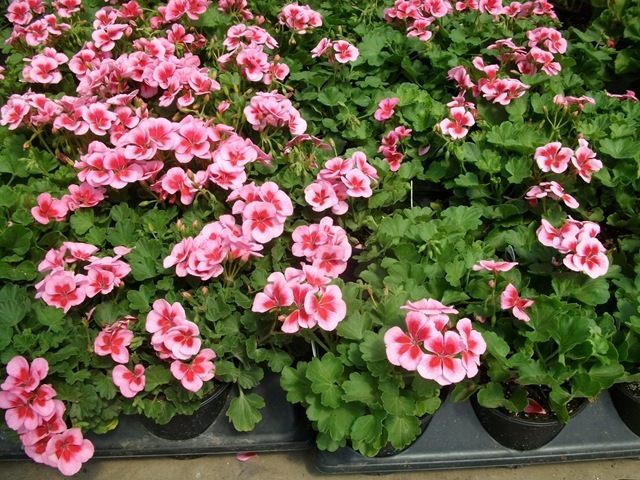 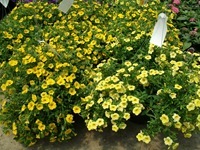 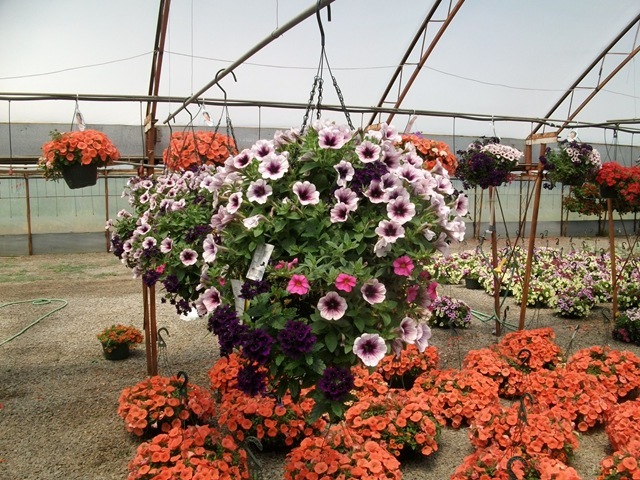 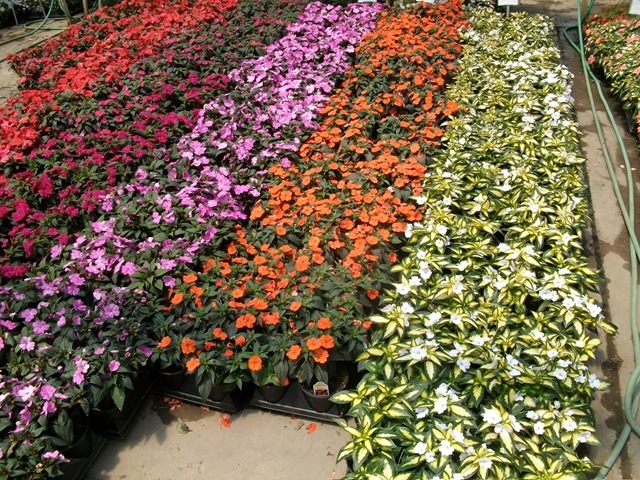 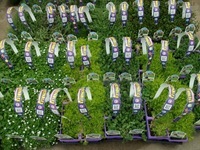 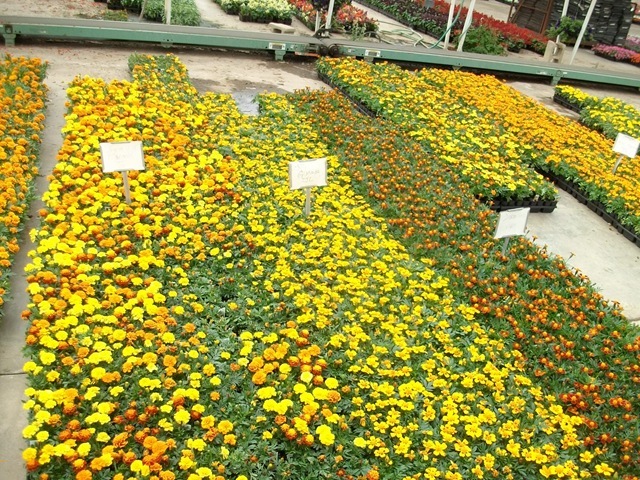 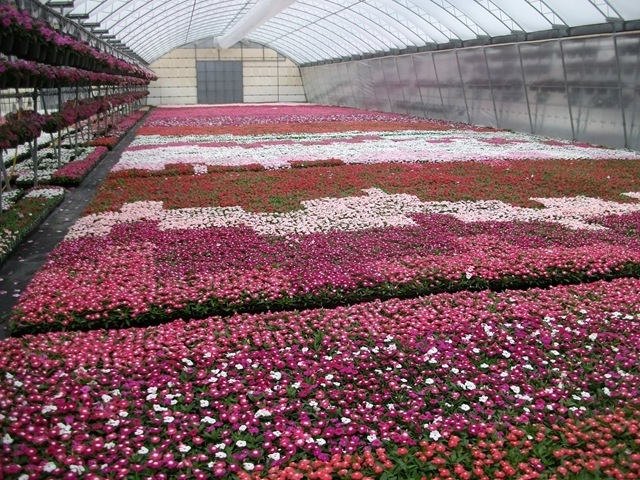 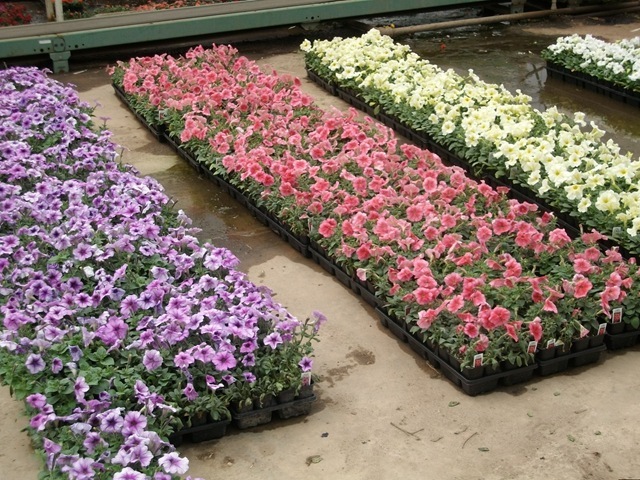 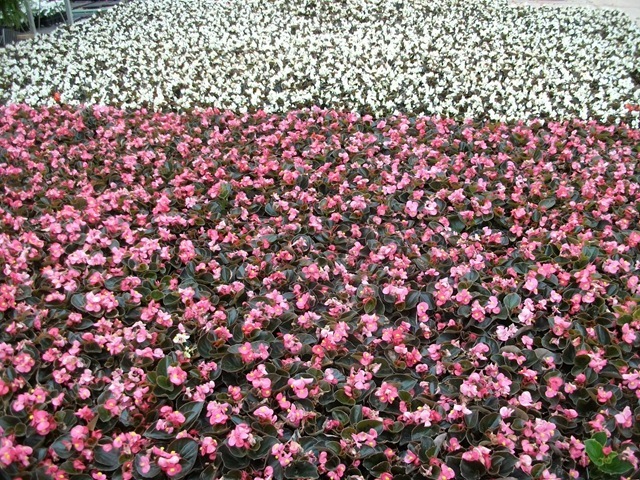 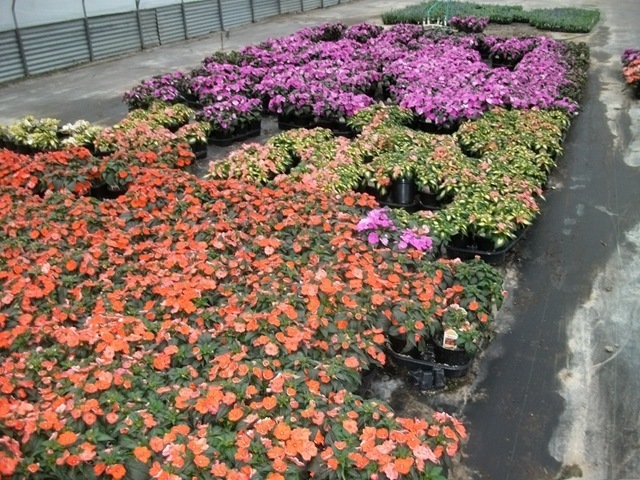 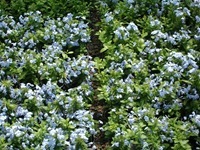 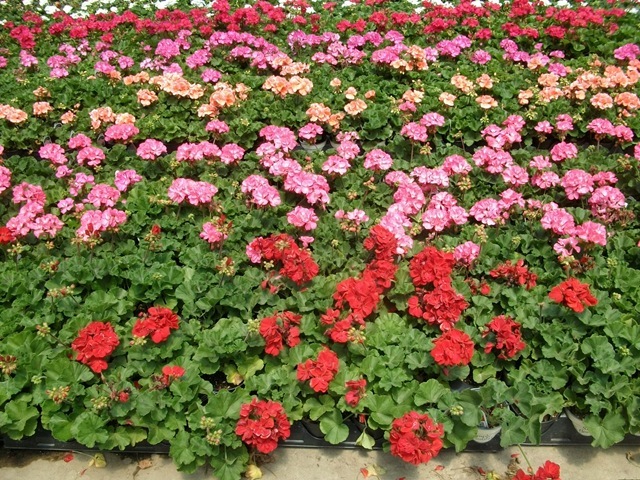 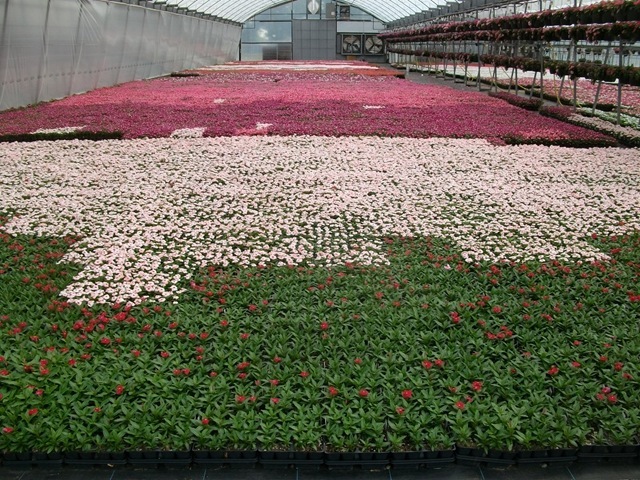 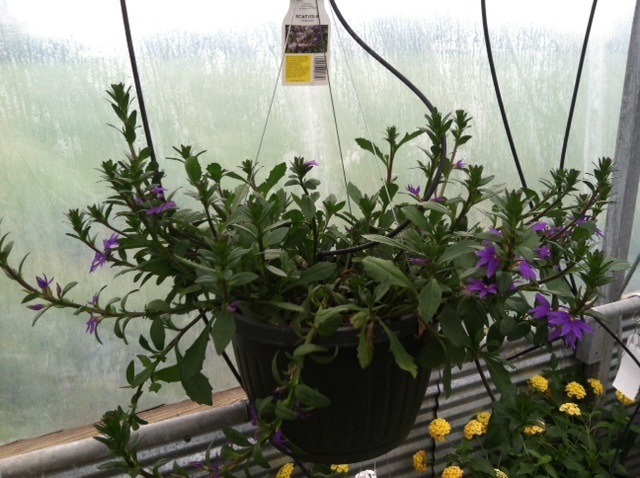 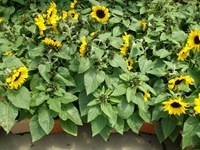 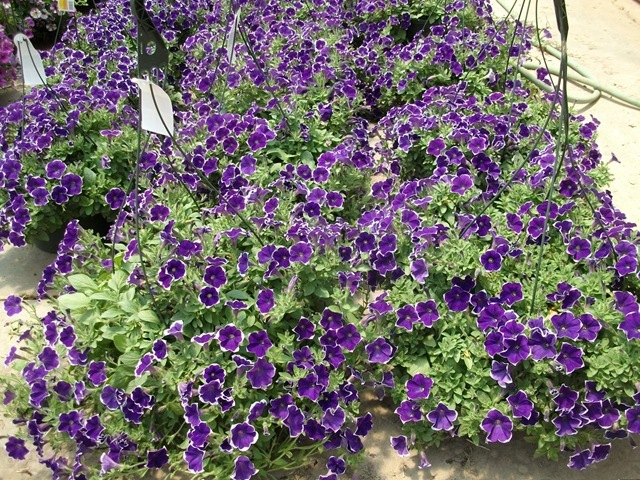 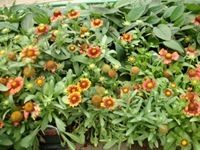 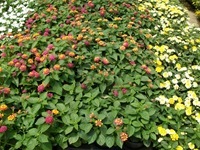 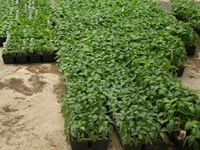 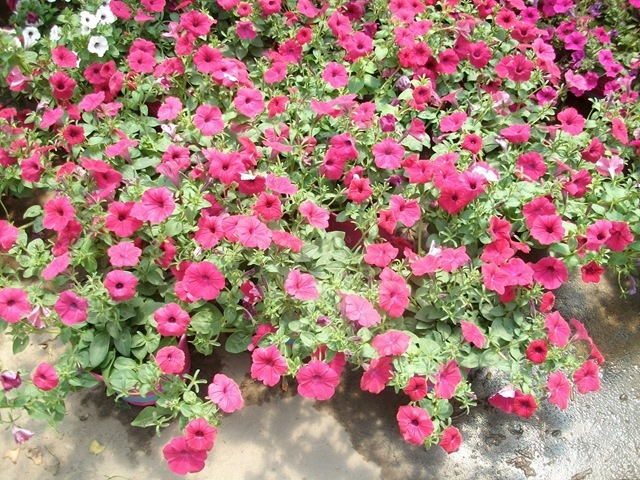 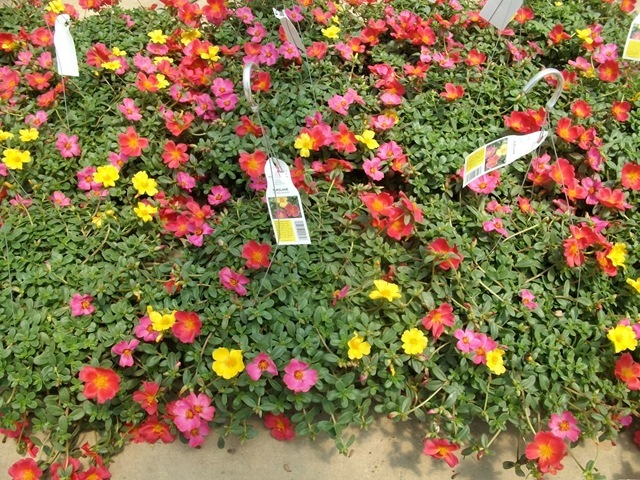 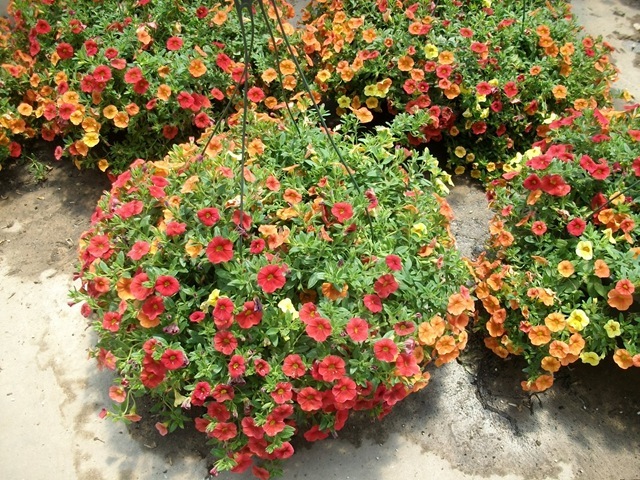 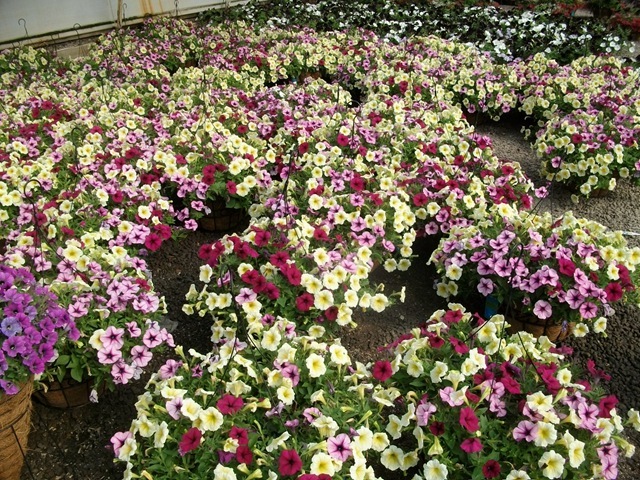 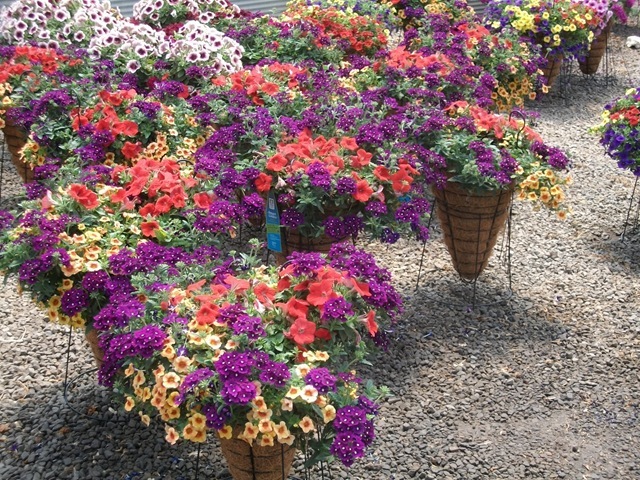 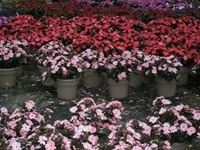 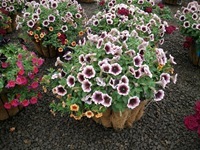 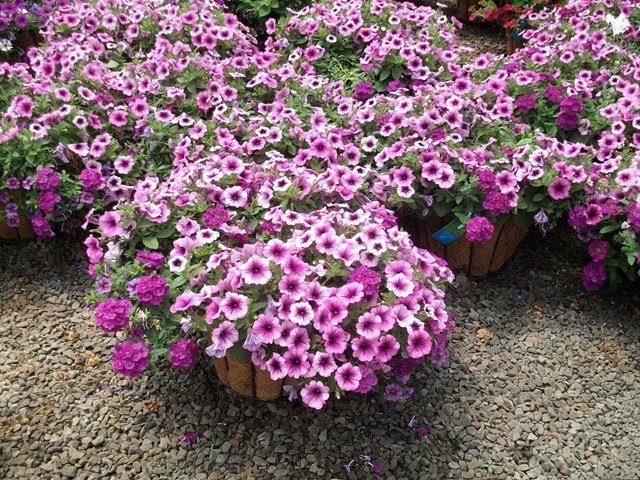 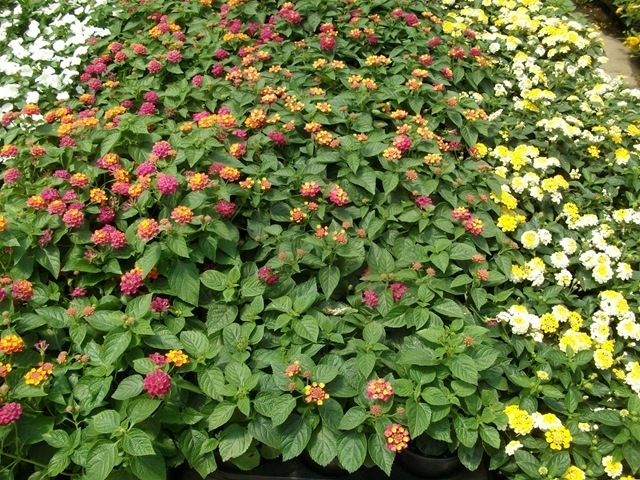 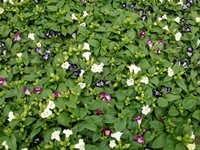 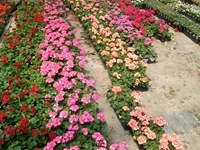 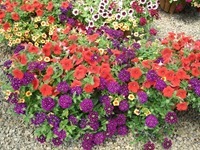 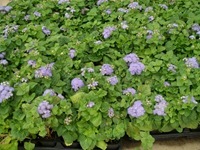 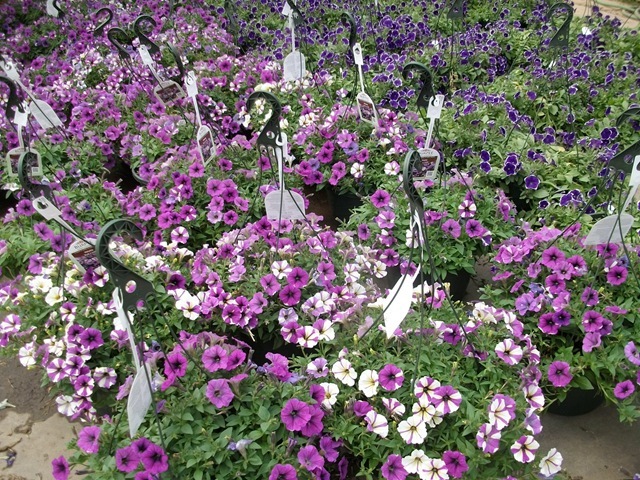 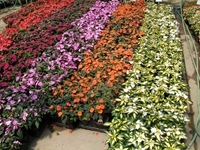 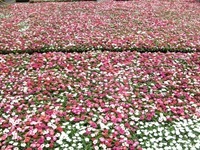 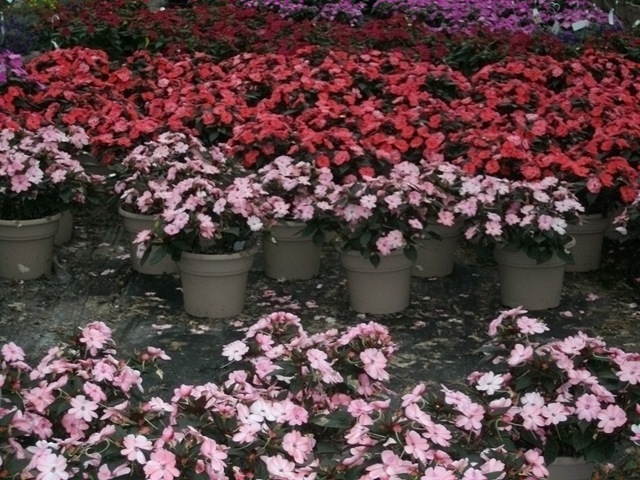 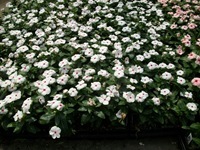 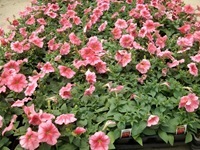 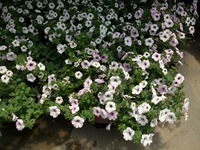 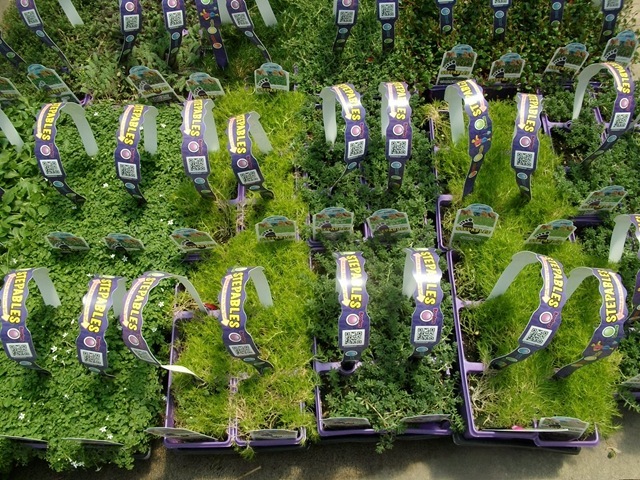 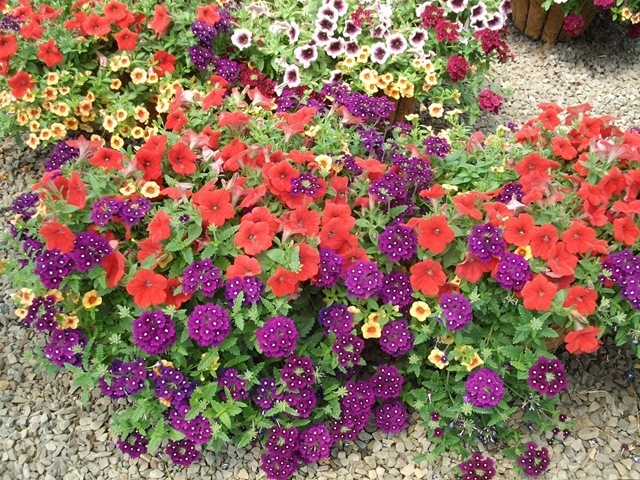 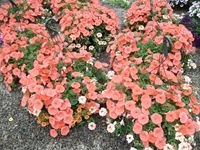 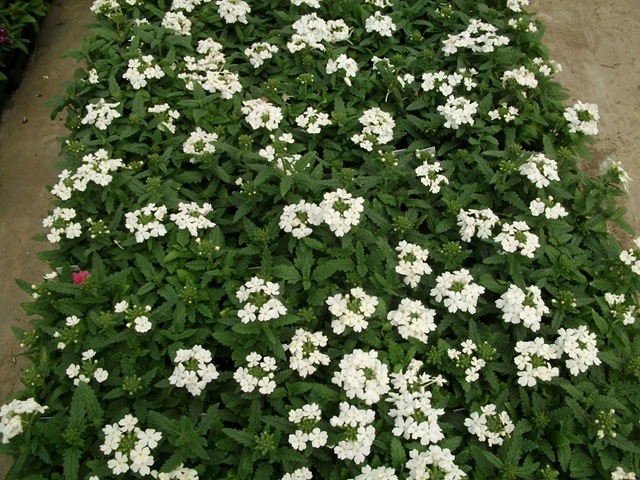 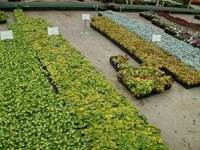 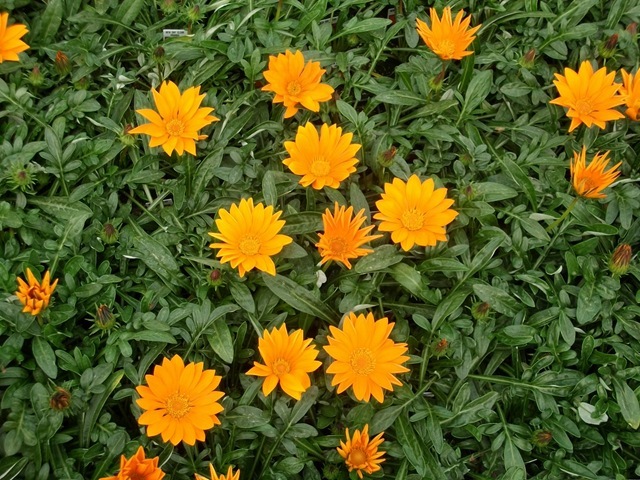 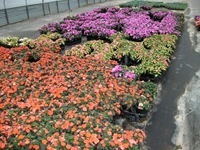 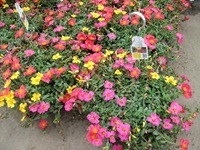 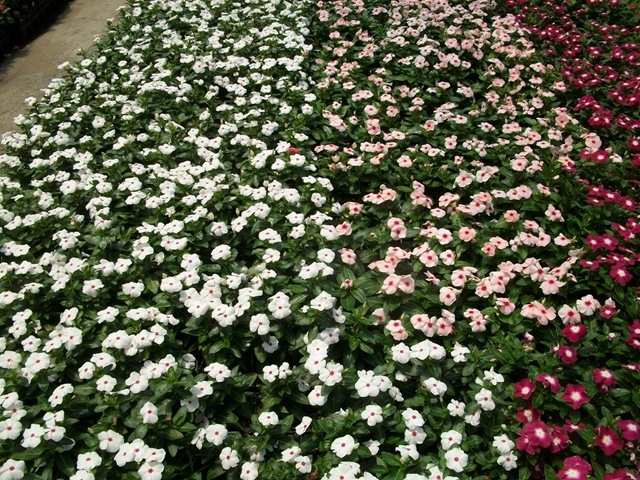 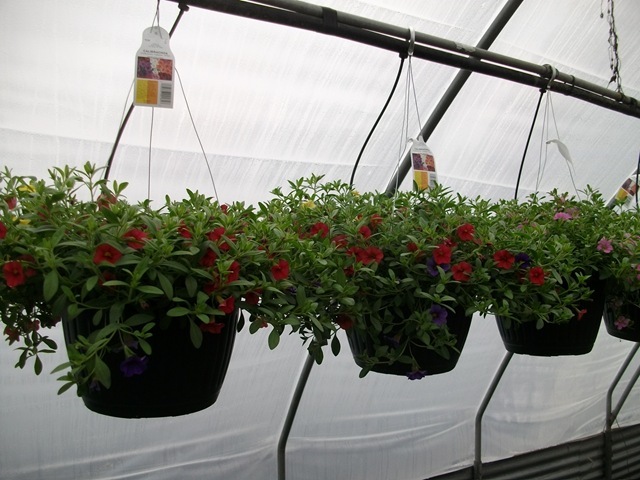 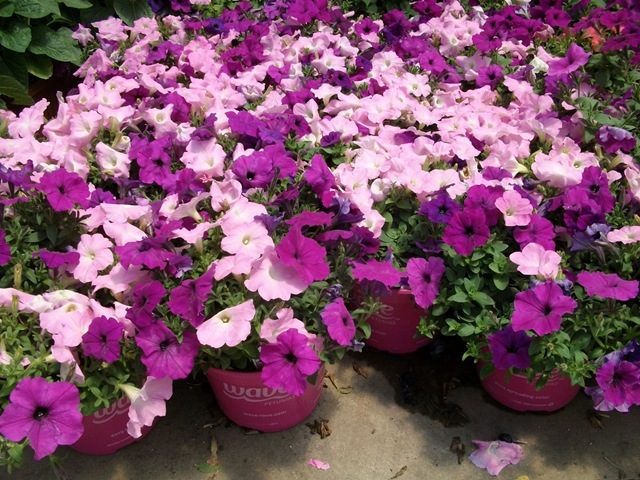 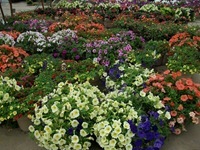 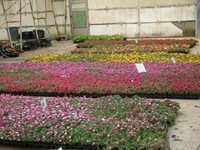 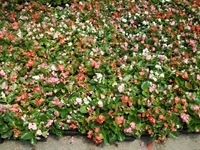 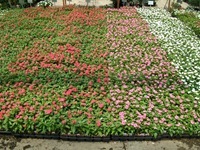 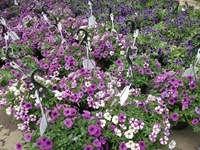 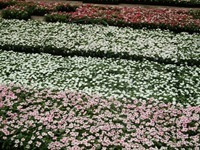 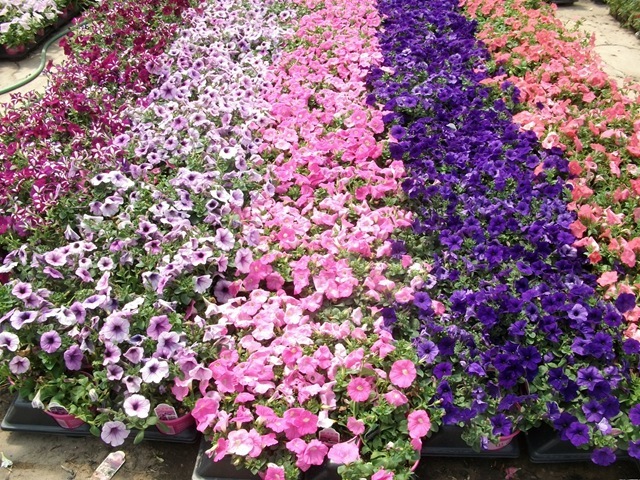 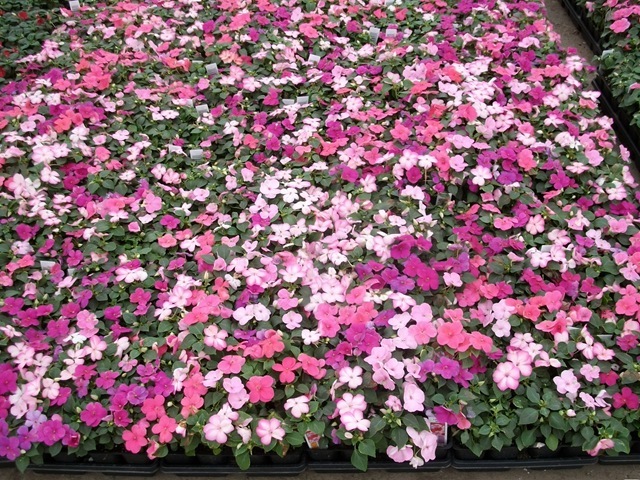 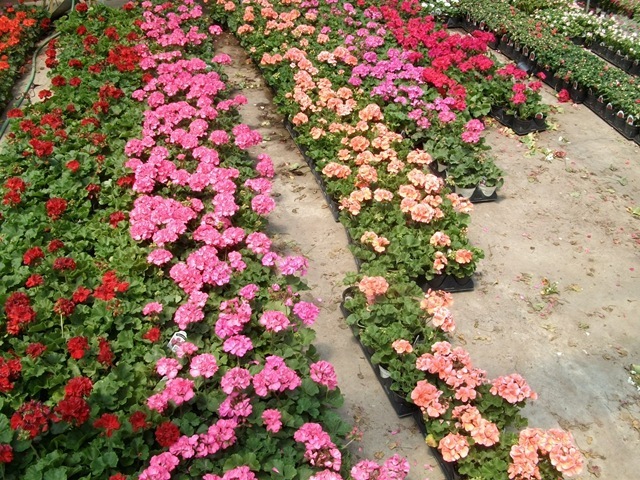 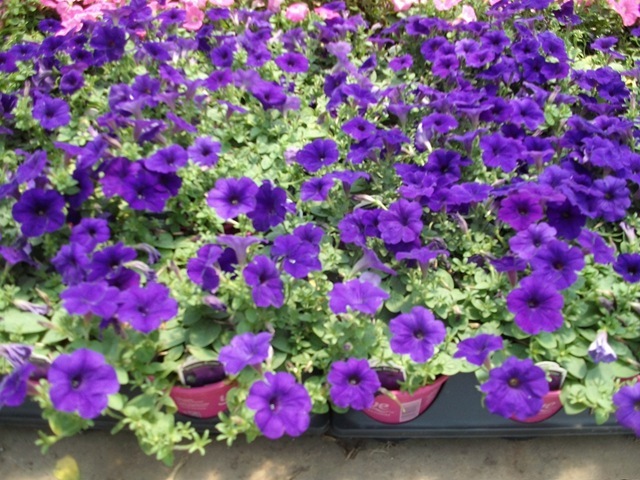 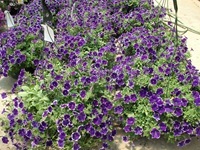 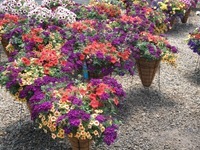 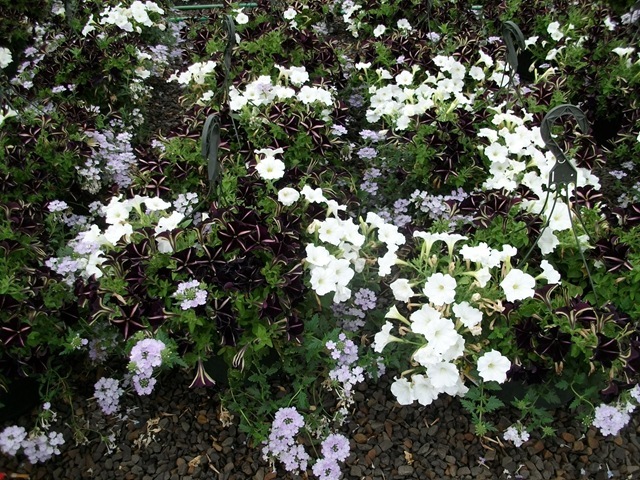 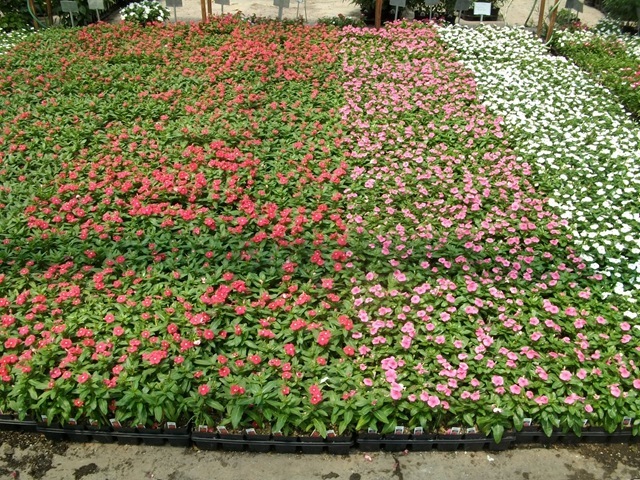 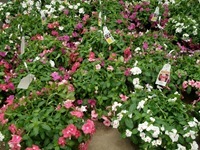 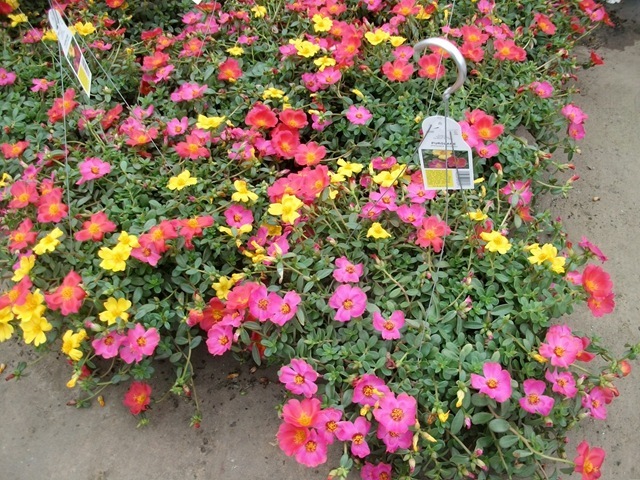 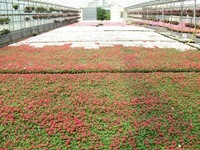 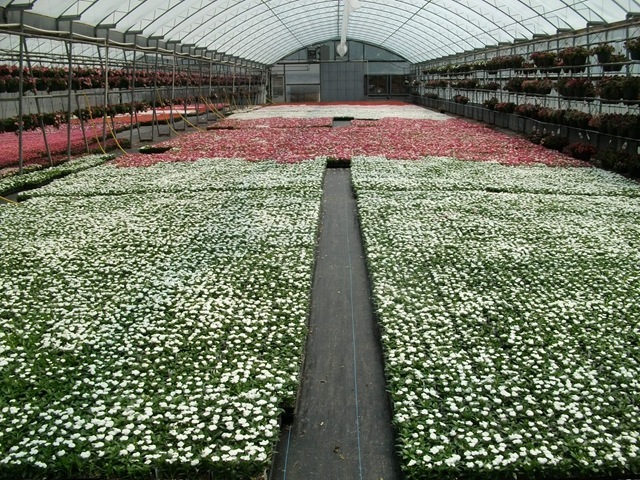 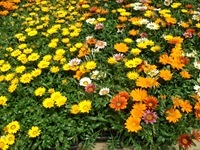 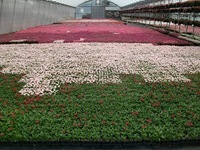 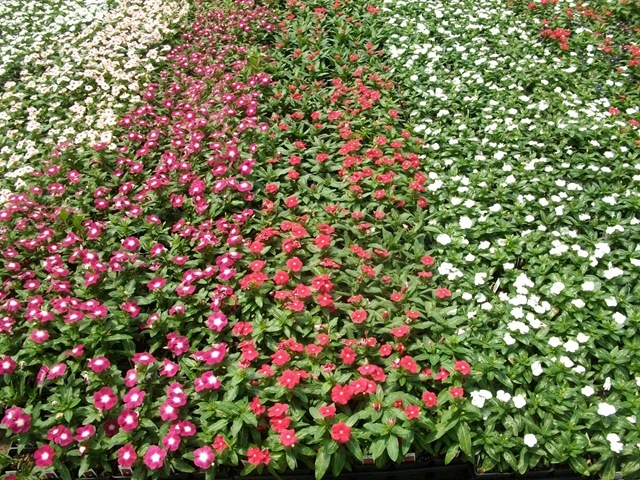 Our J6, 1801, 6” and 1 gallon basic annuals are all still looking great. 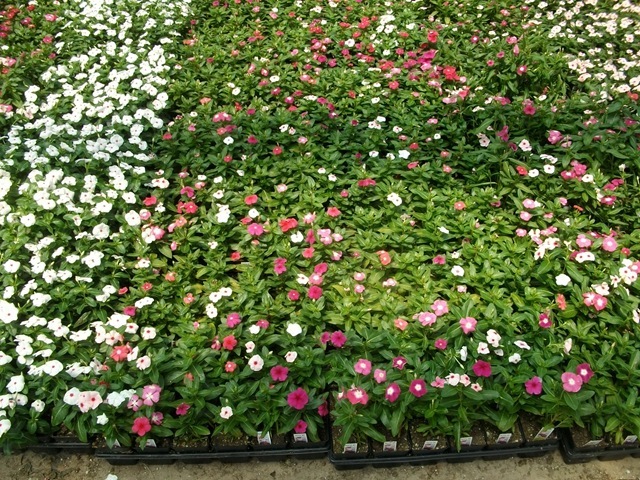 Our deluxe and premium annuals look great too. 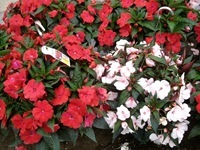 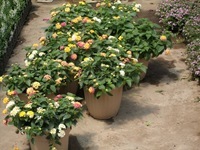 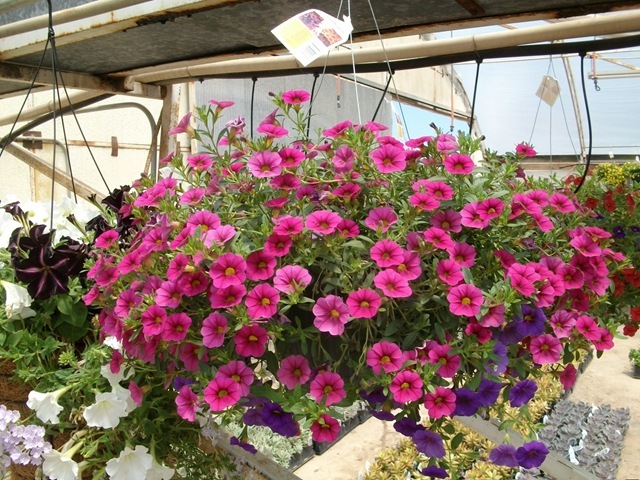 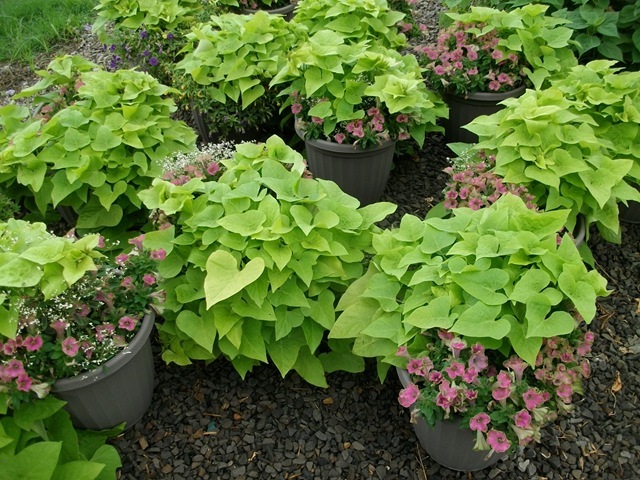 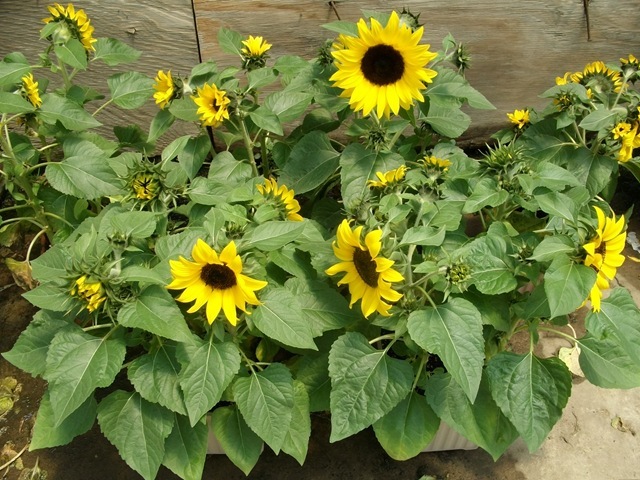 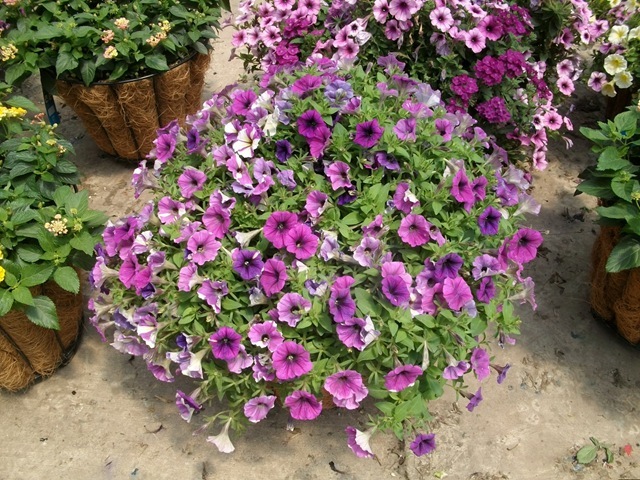 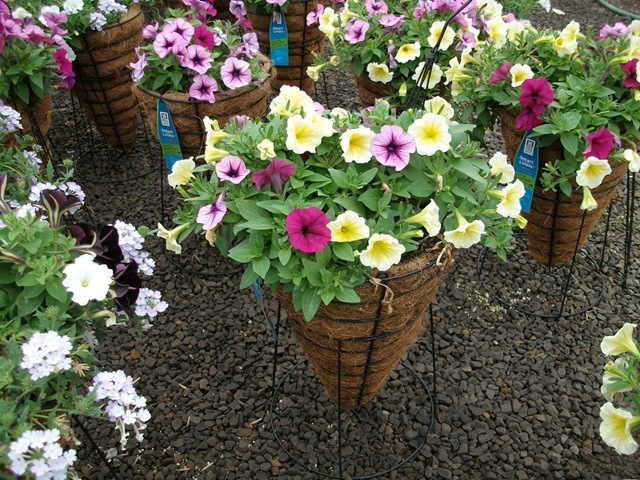 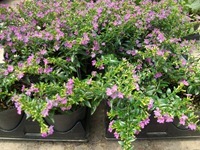 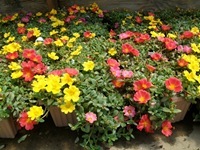 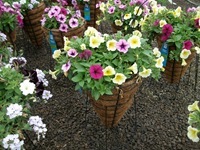 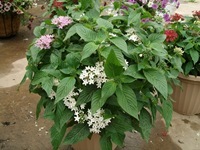 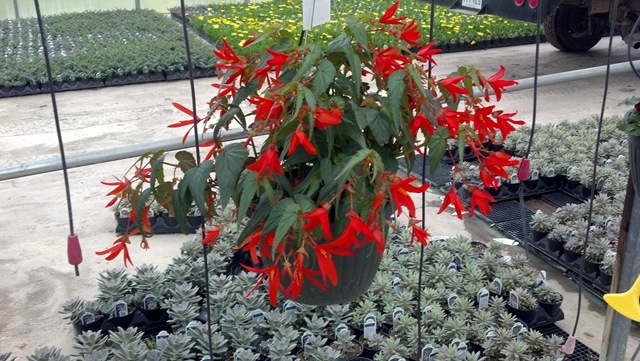 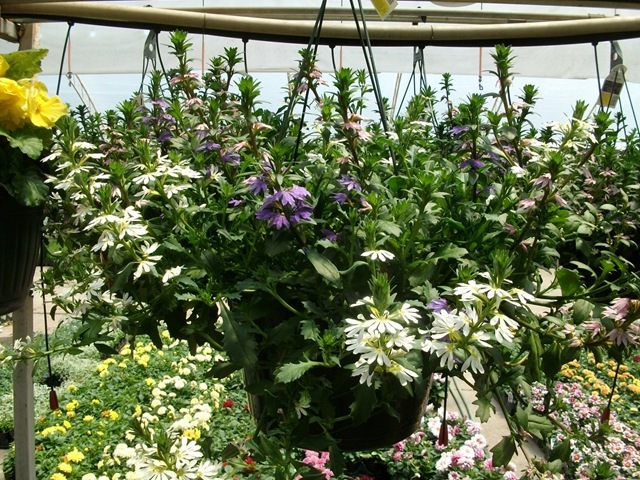 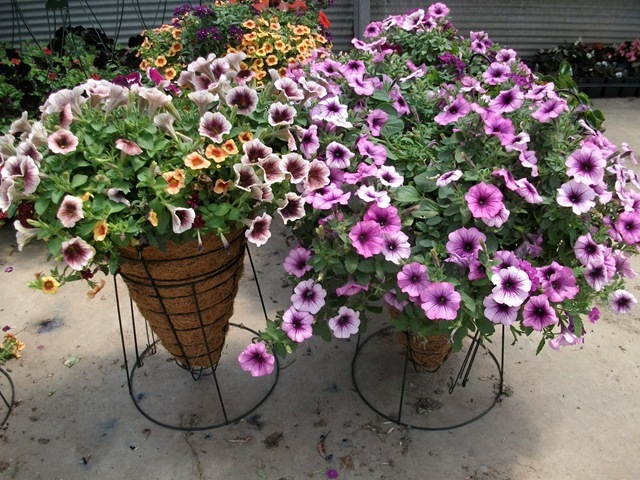 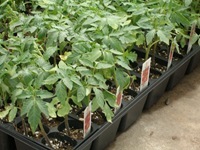 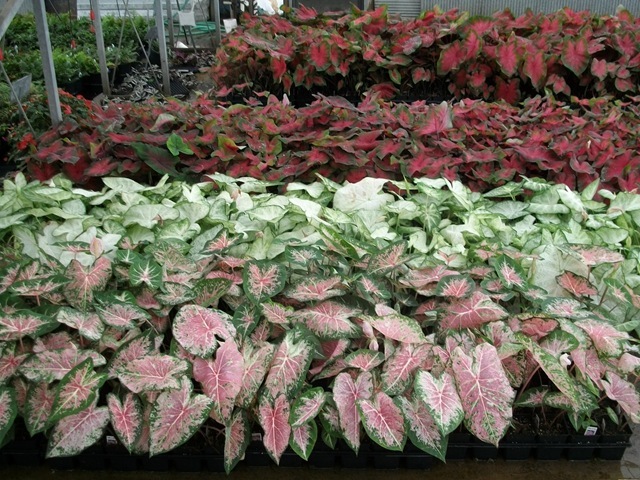 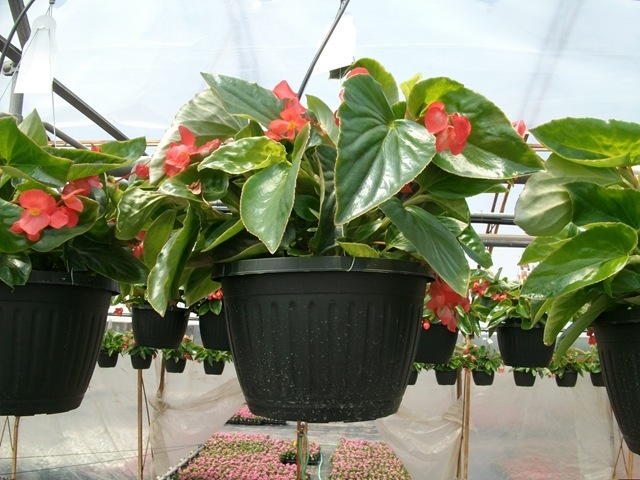 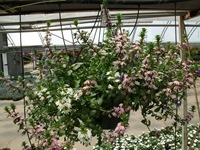 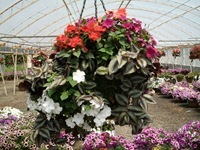 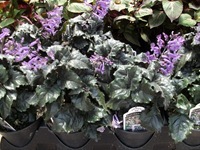 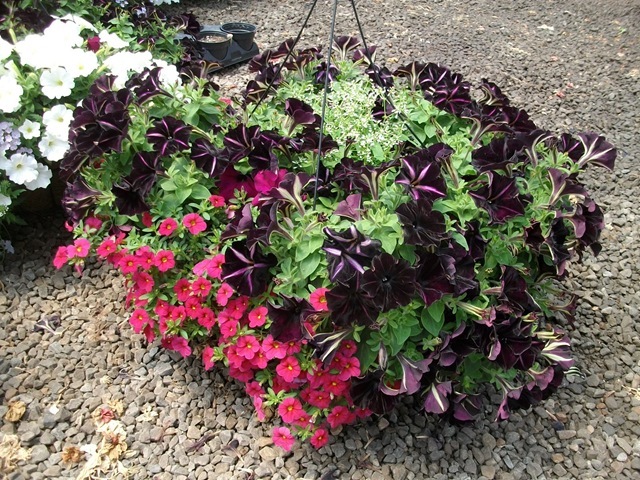 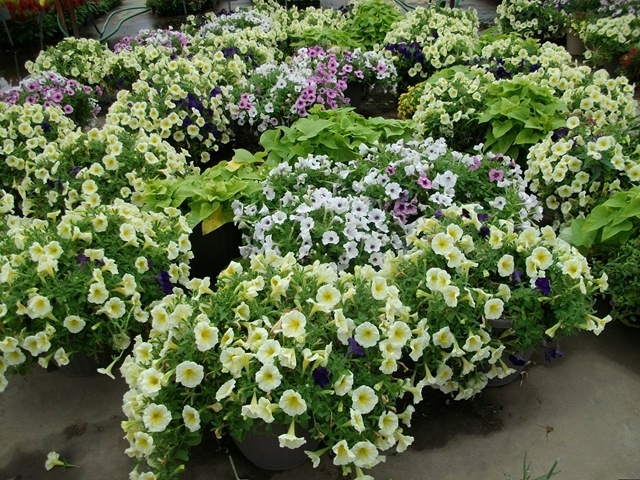 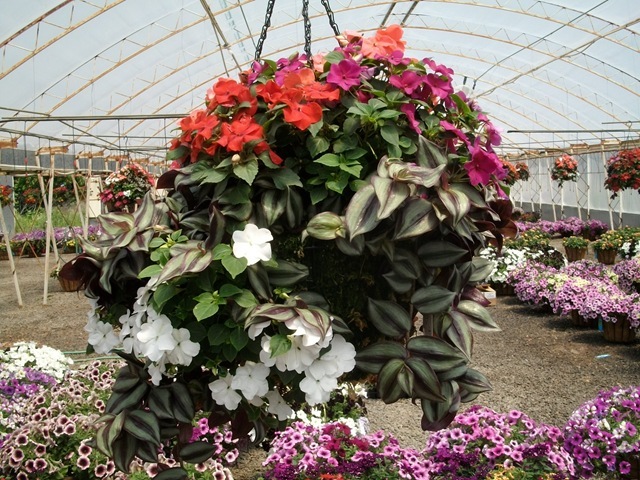 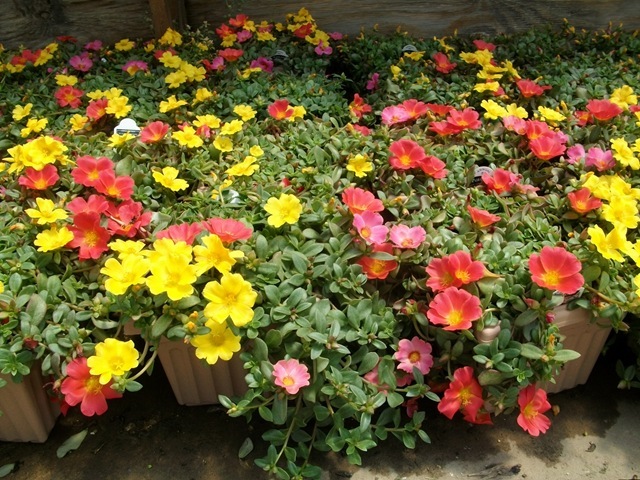 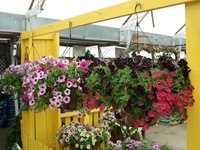 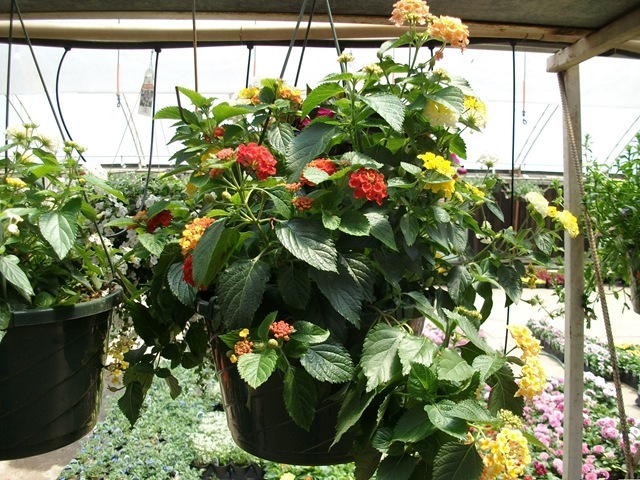 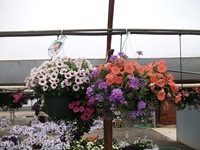 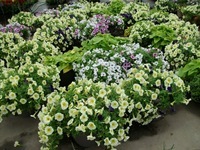 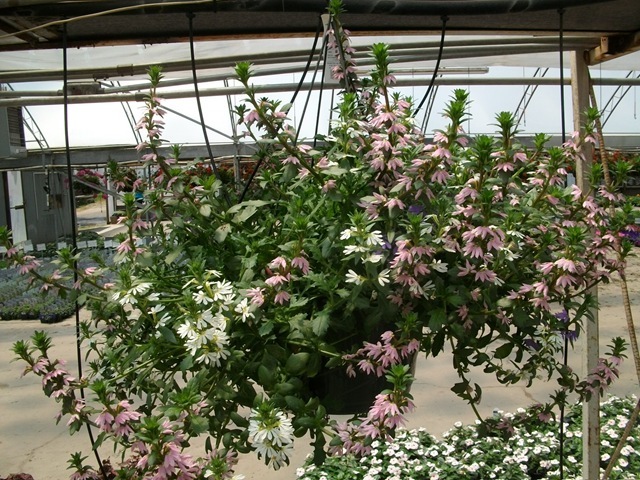 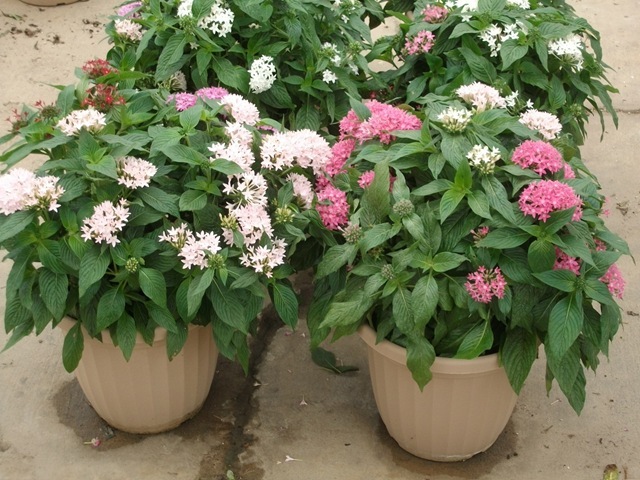 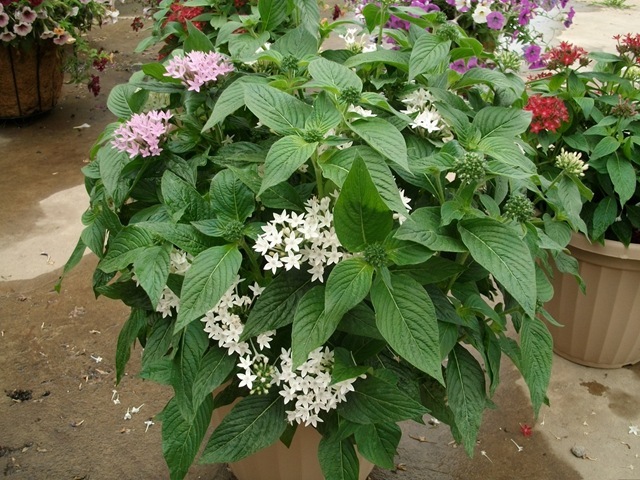 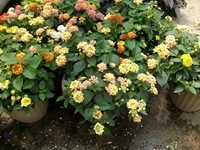 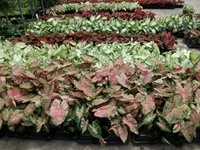 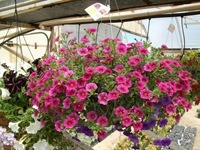 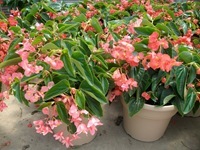 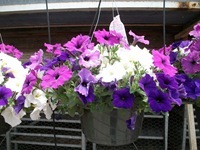 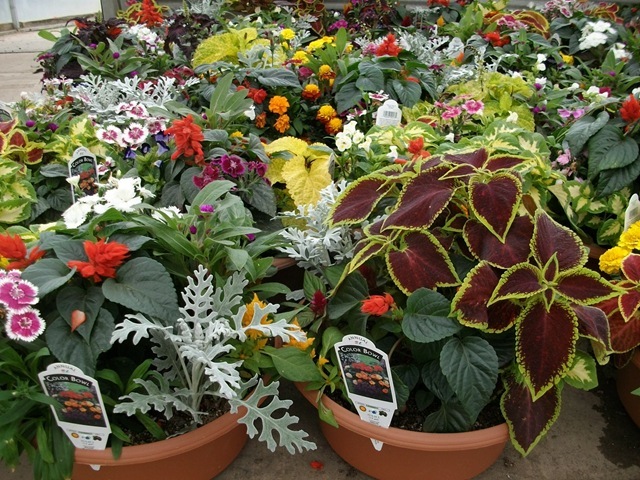 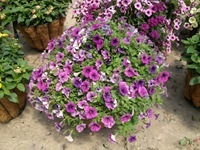 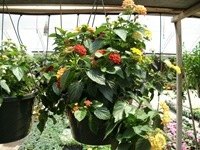 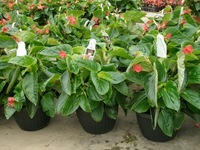 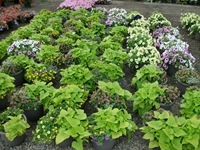 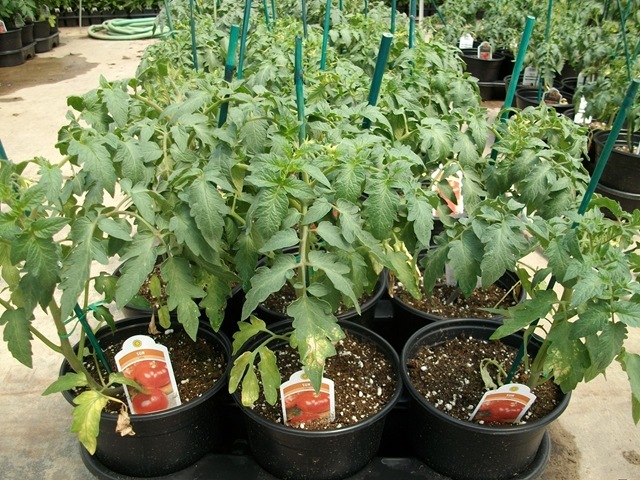 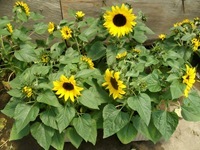 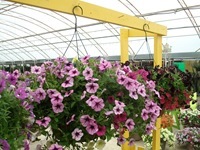 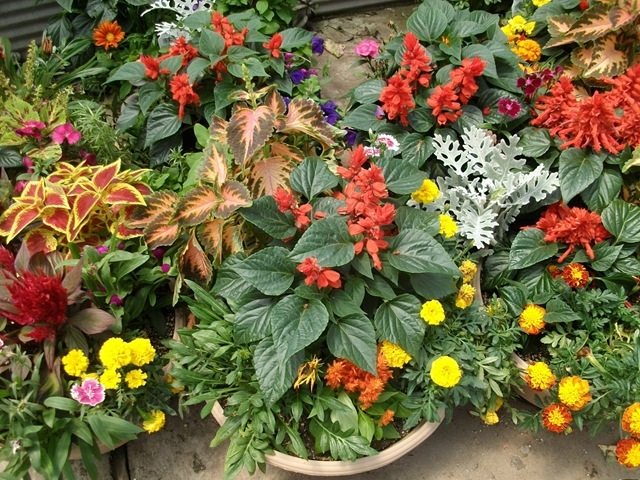 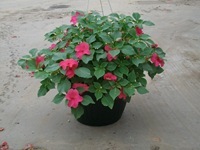 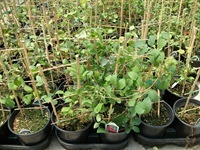 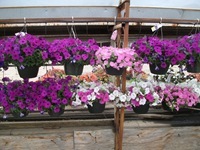 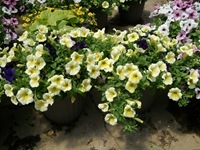 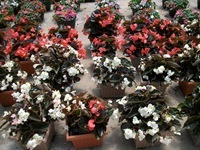 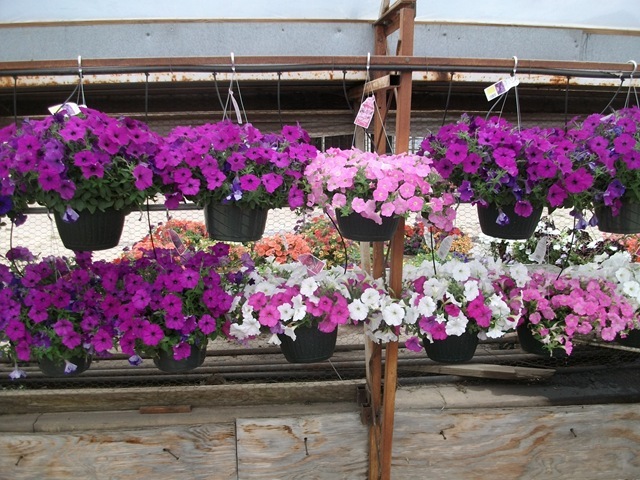 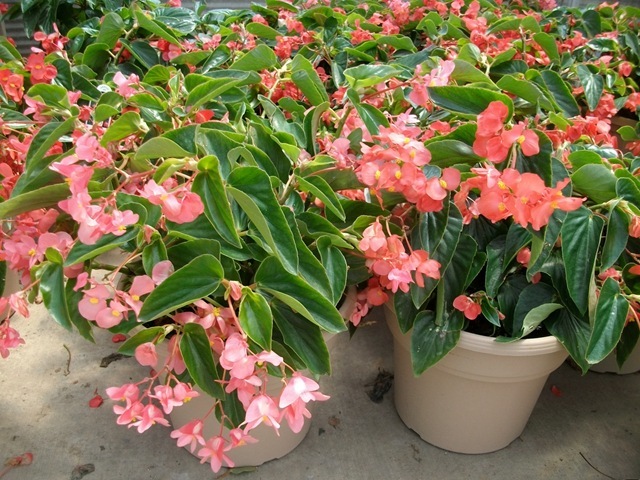 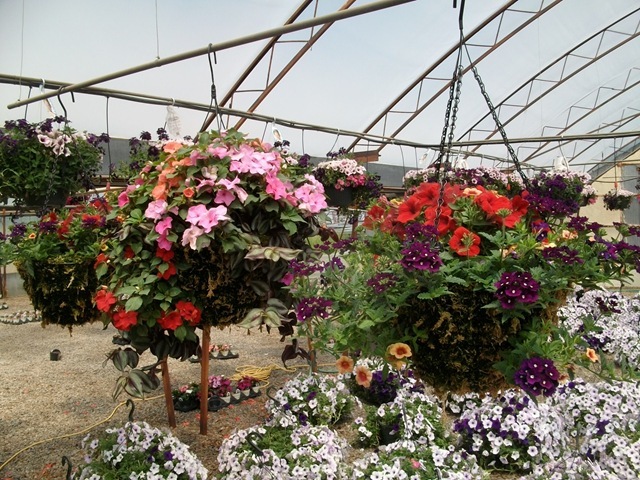 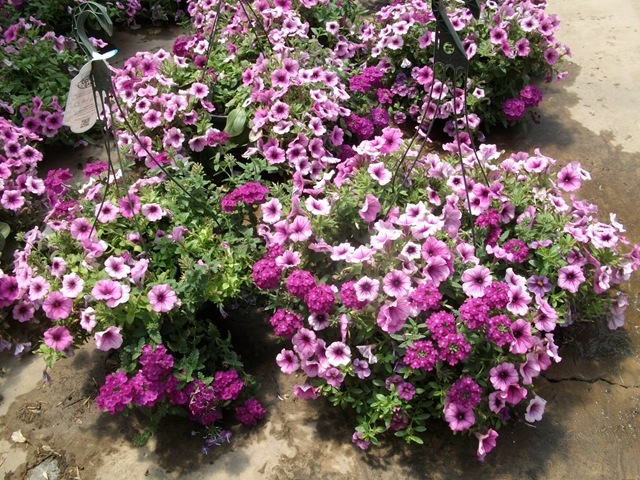 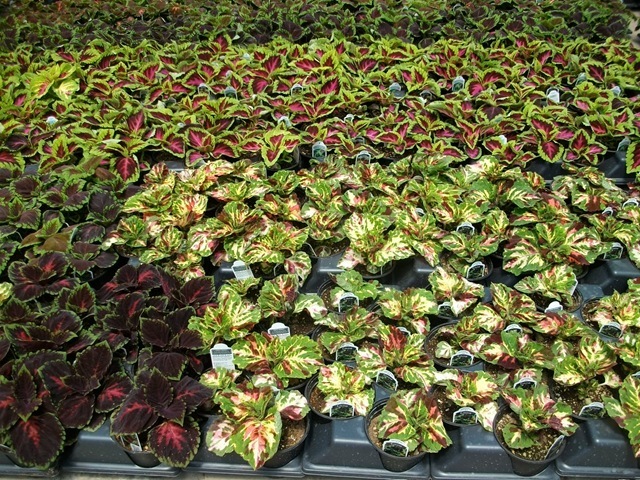 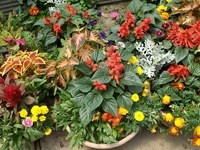 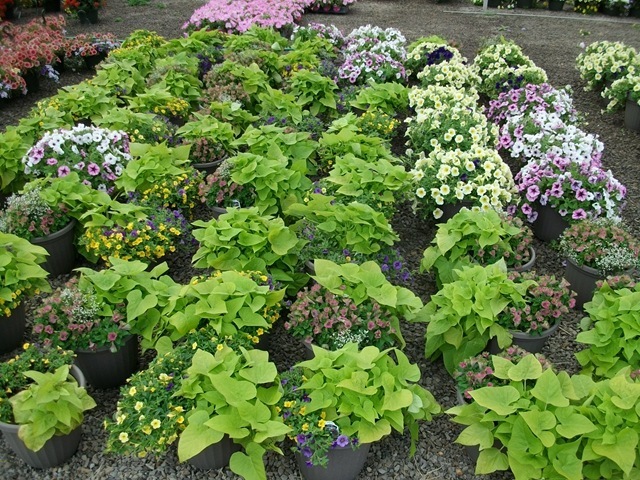 We also have a lot of great combo pots, combo baskets and planters for Memorial Day. 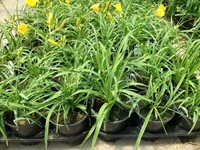 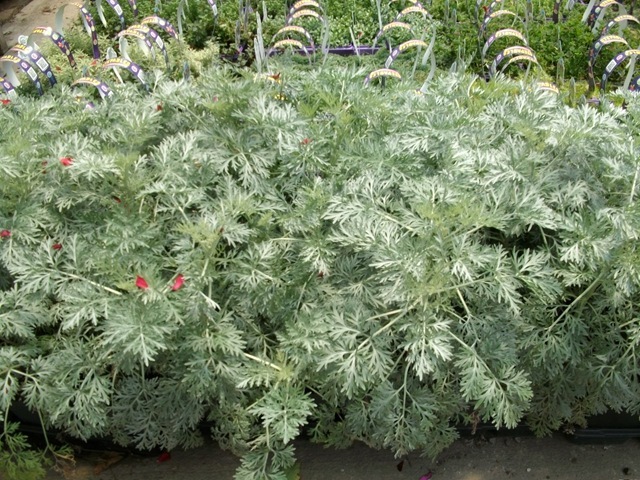 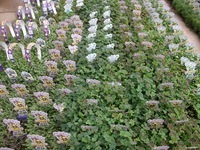 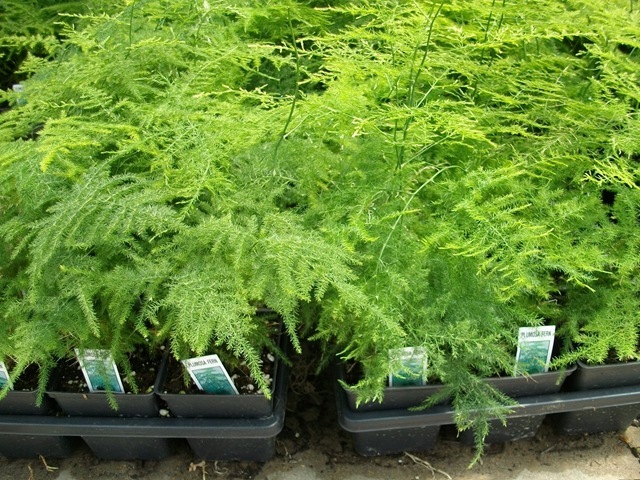 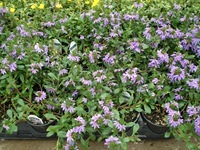 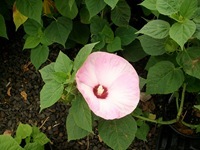 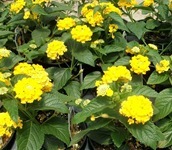 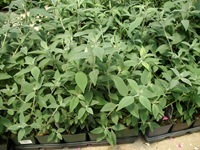 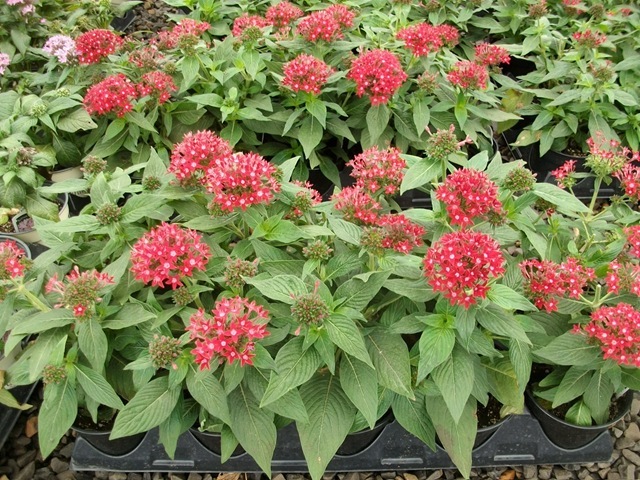 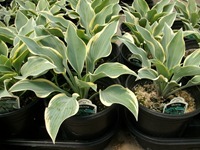 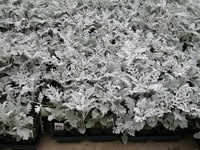 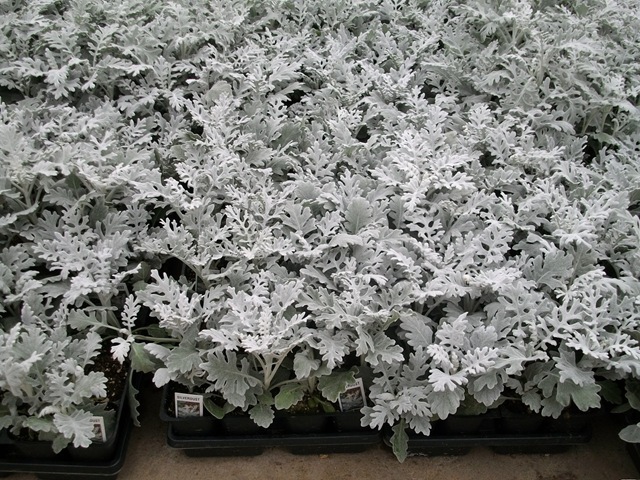 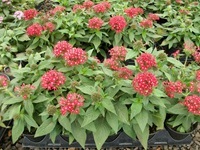 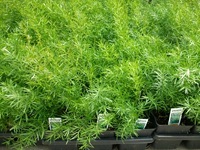 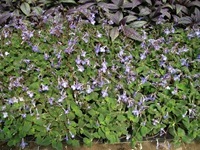 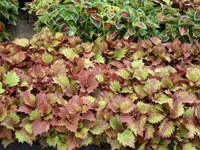 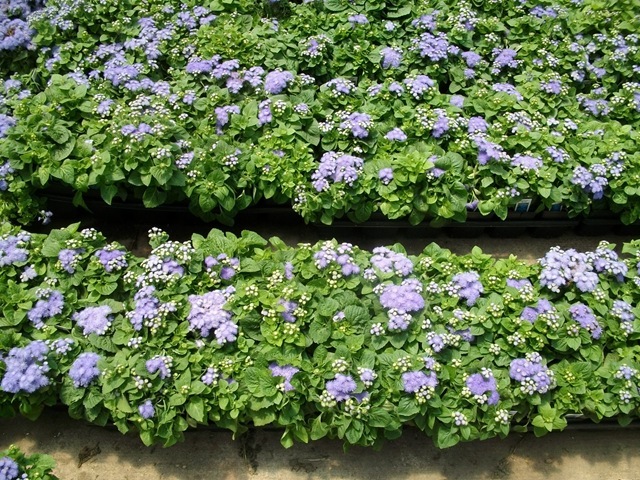 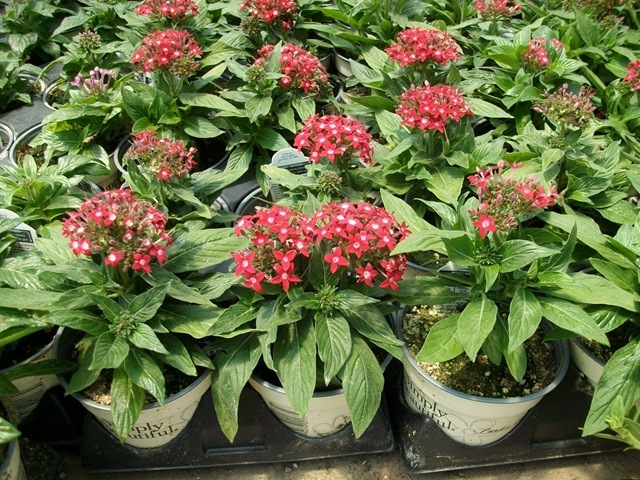 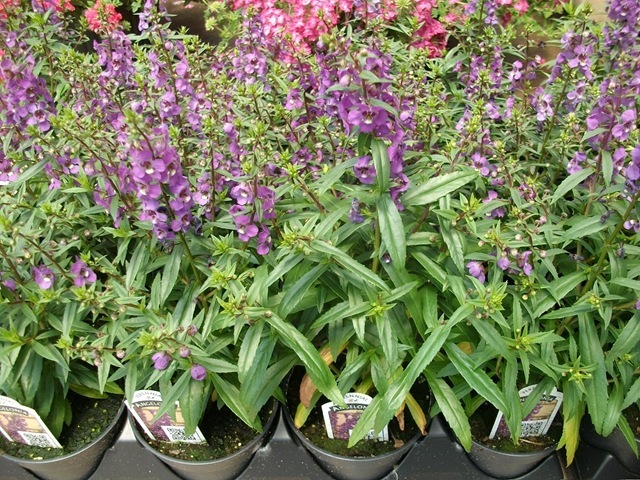 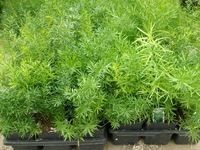 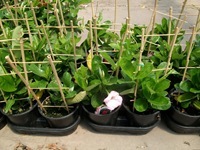 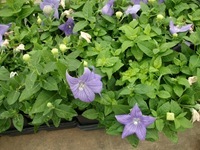 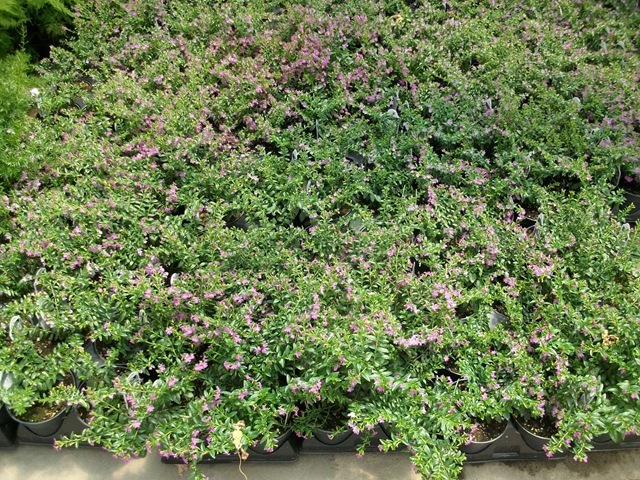 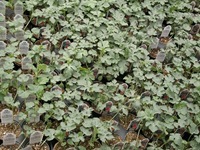 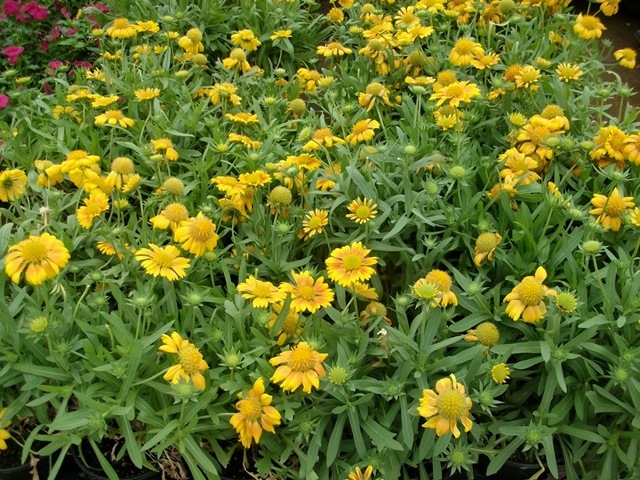 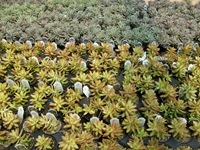 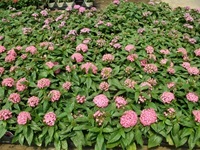 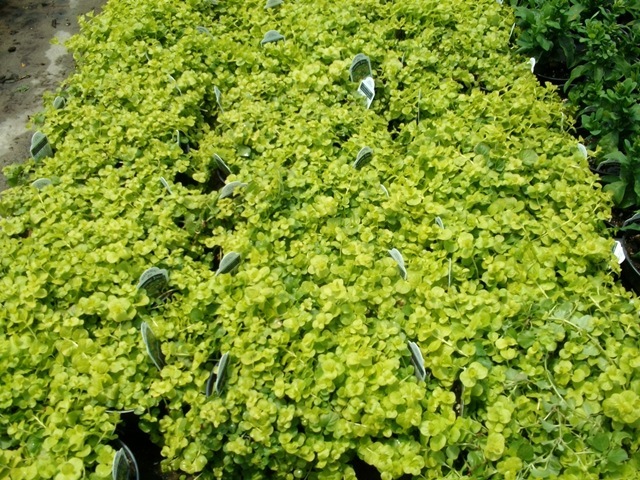 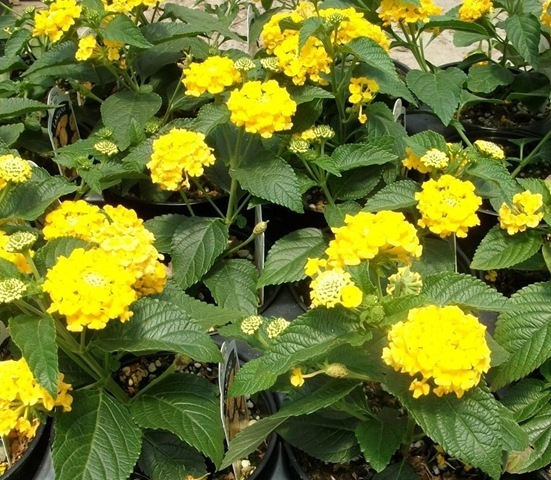 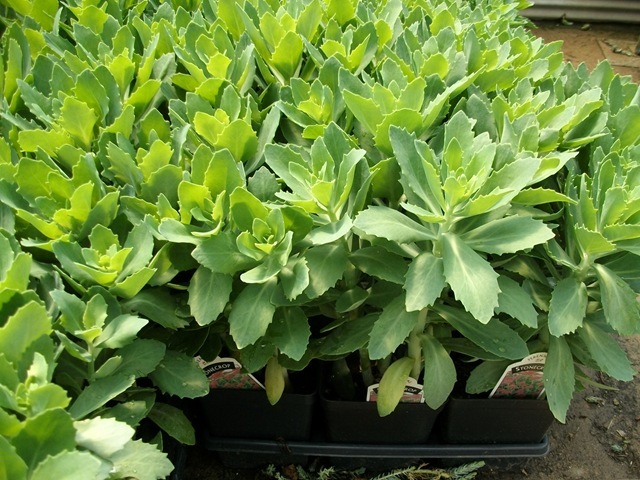 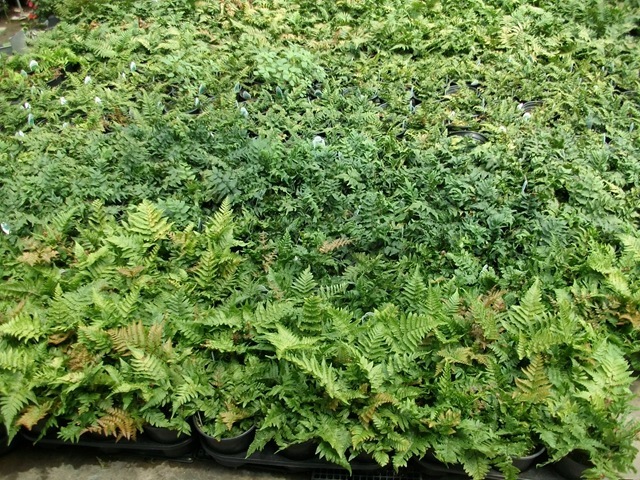 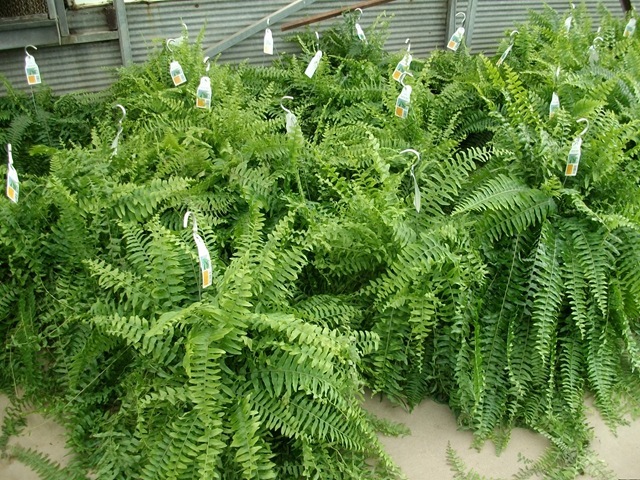 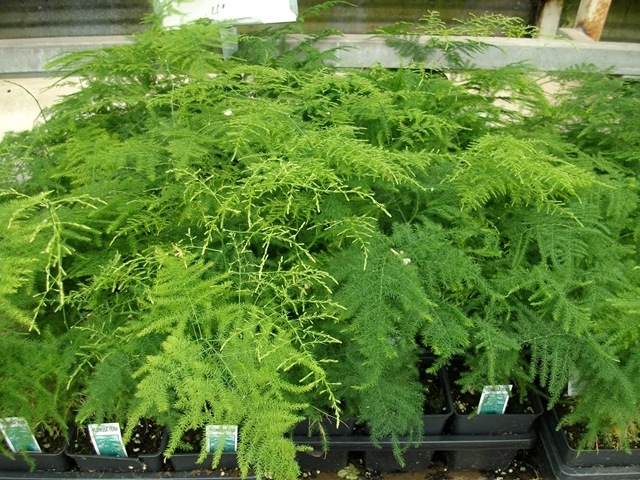 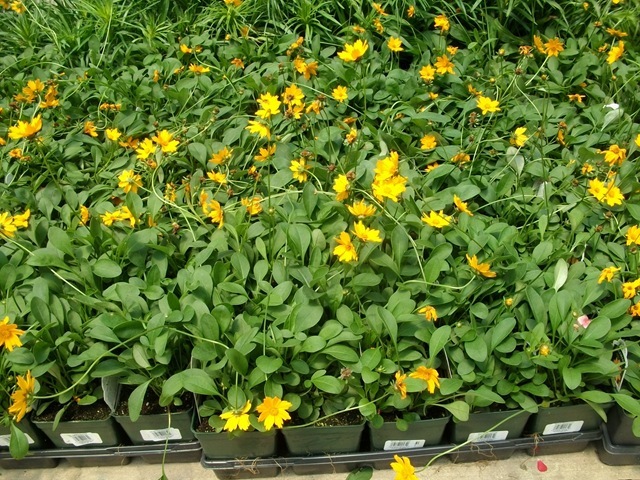 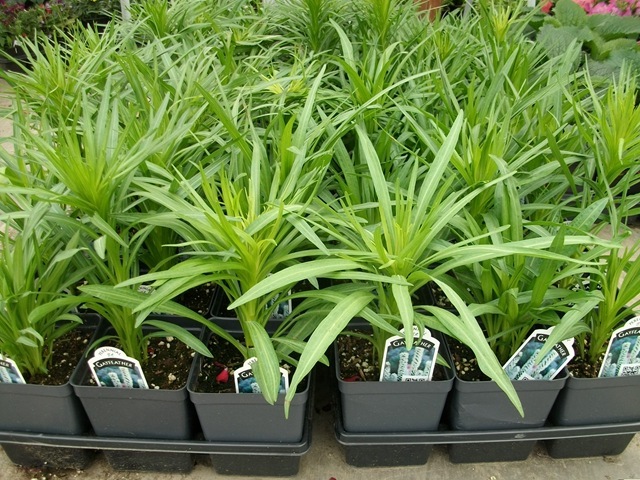 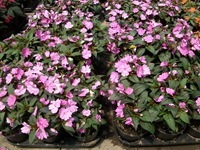 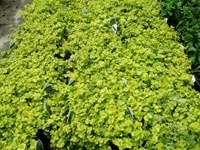 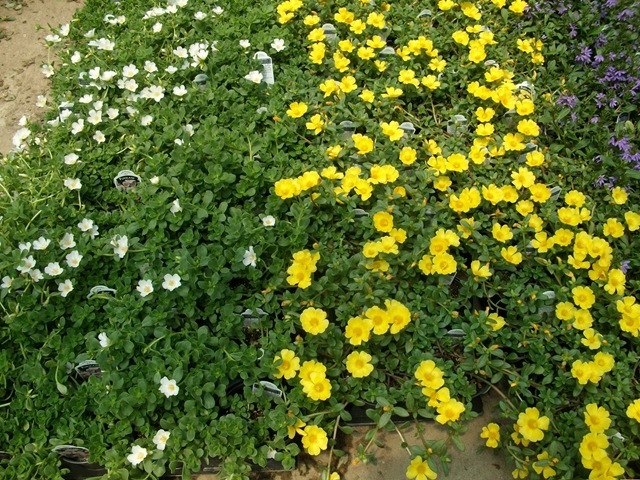 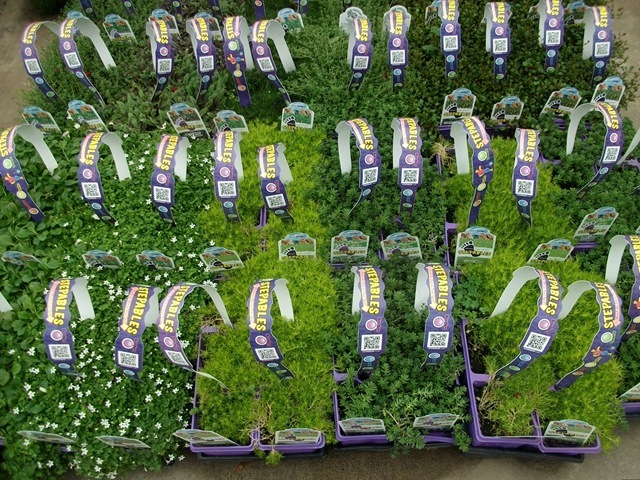 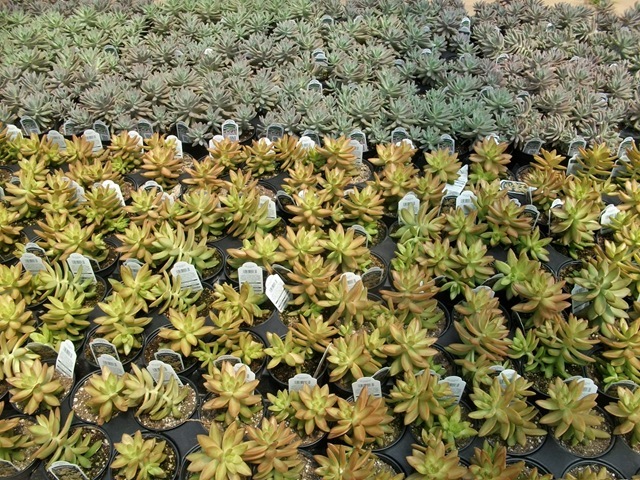 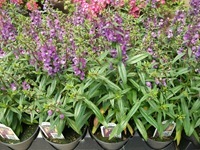 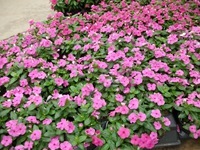 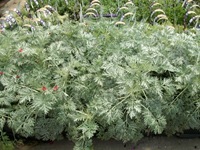 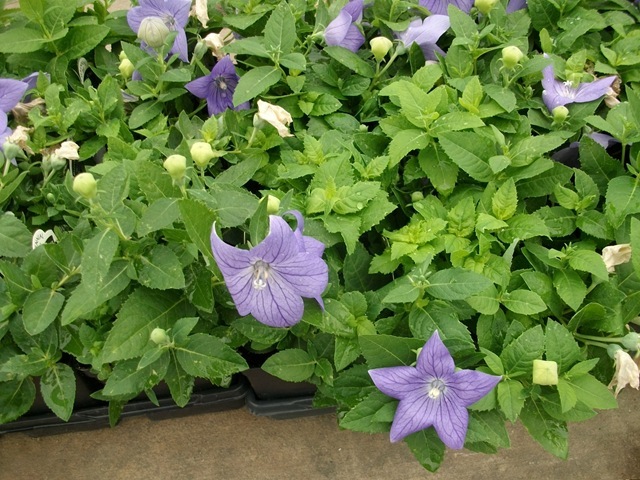 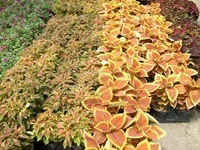 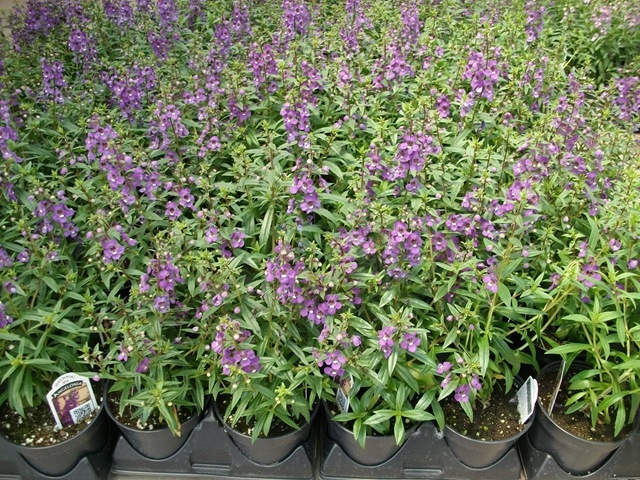 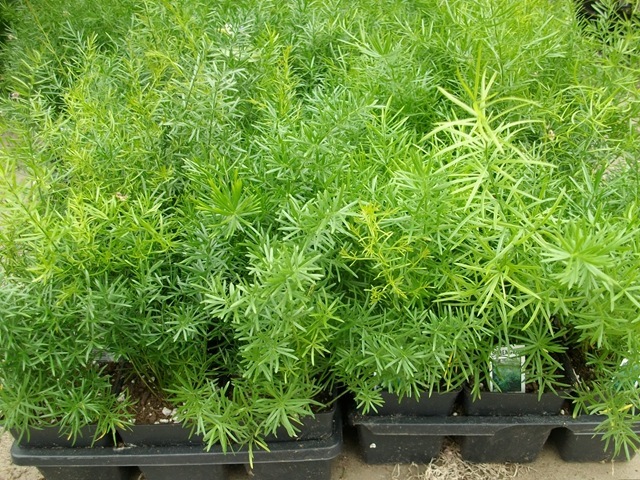 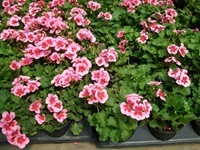 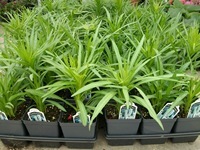 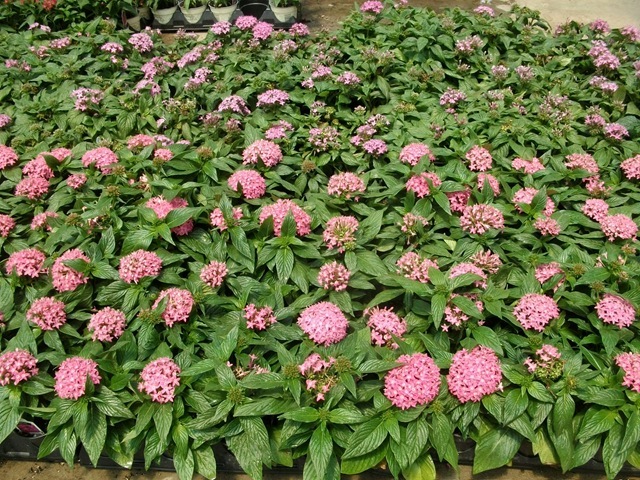 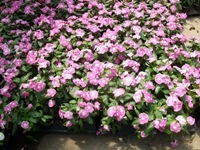 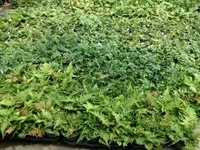 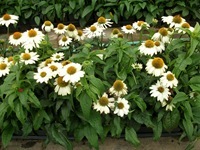 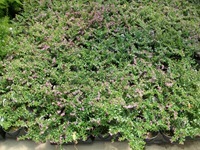 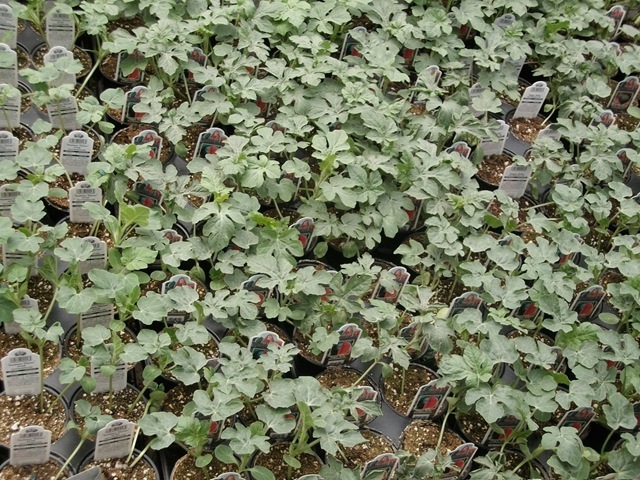 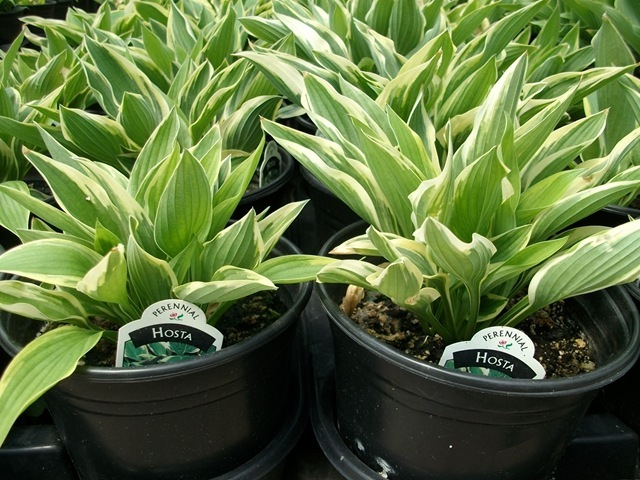 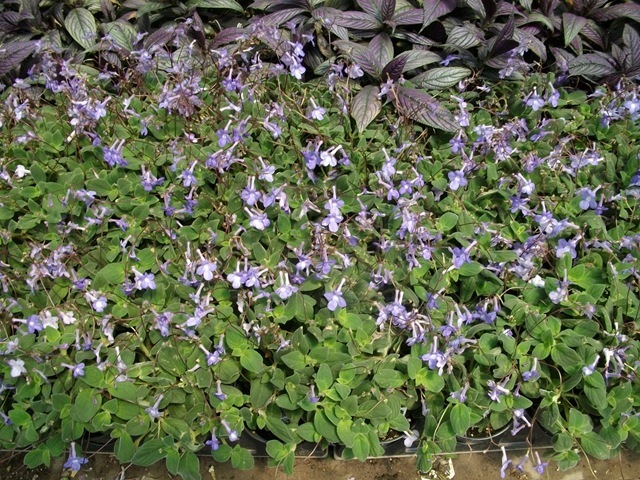 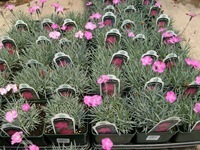 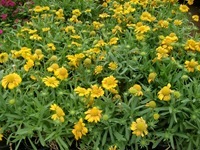 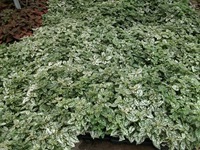 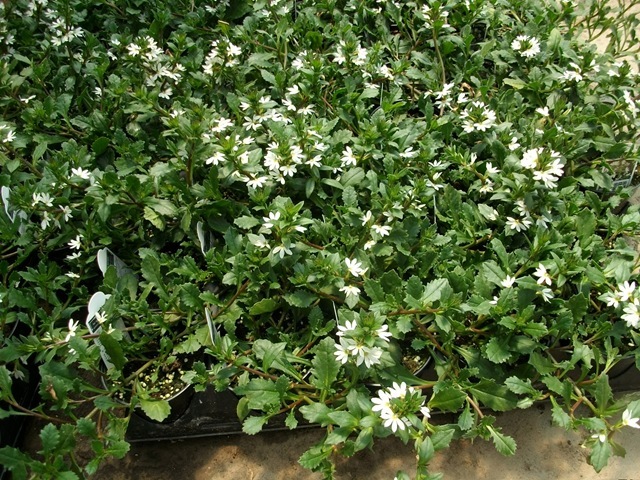 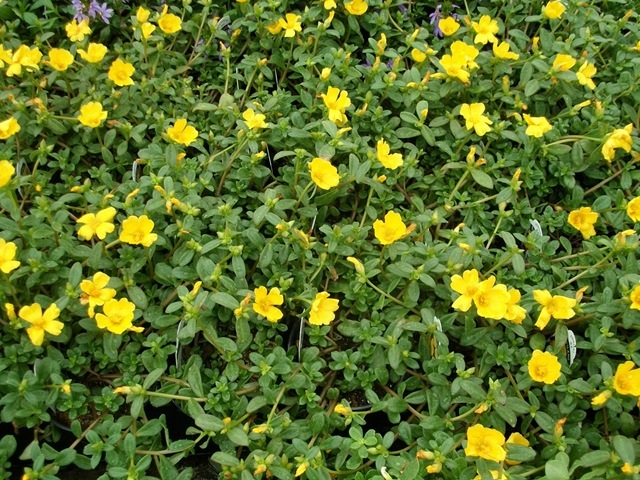 We also still have a good selection of perennials. 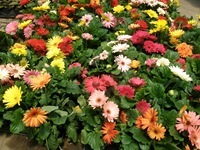 You want flowers? 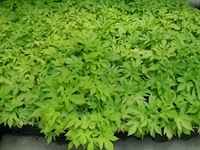 We got ‘em. 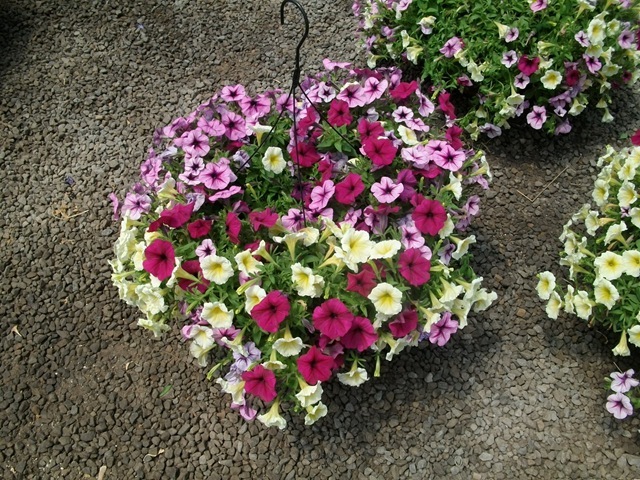 I am behind today so all you get are pictures. Weekend looks great everywhere. 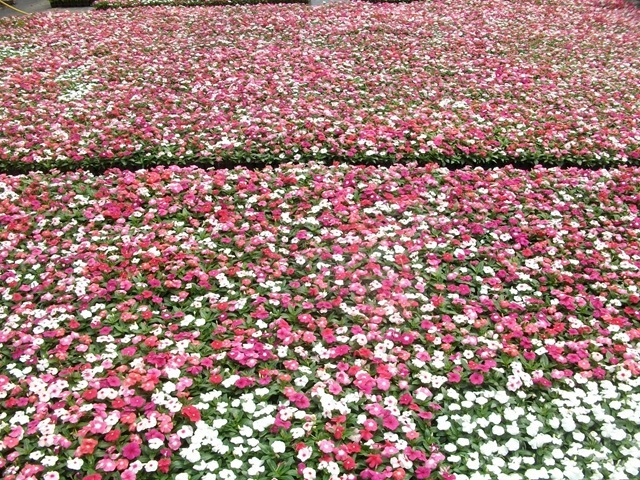 Hope yours is awesome. 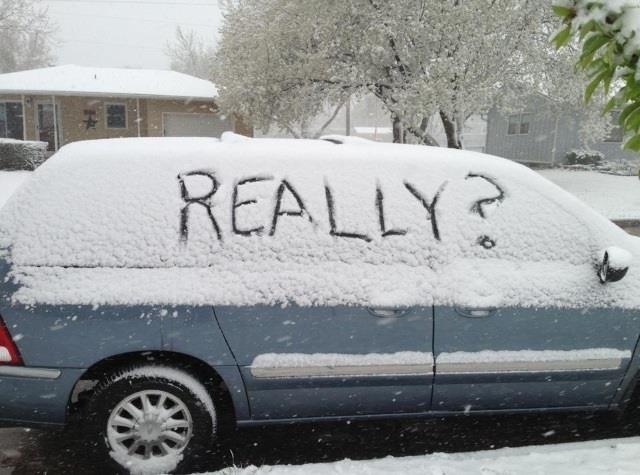 It was in the 80’s here Monday and Tuesday this week. 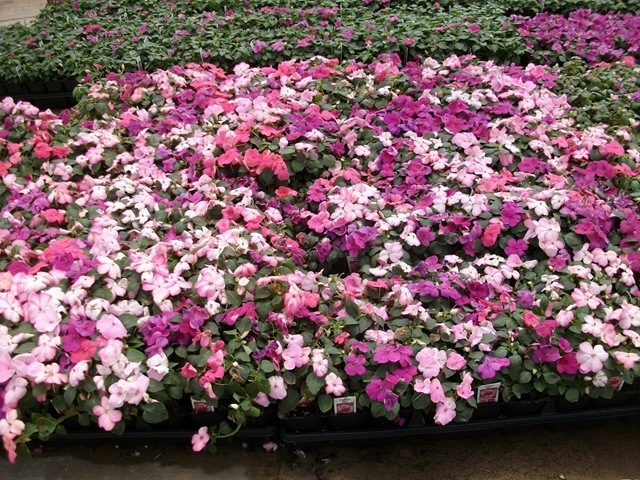 It snowed up to 4” in some places in NW Arkansas last night. 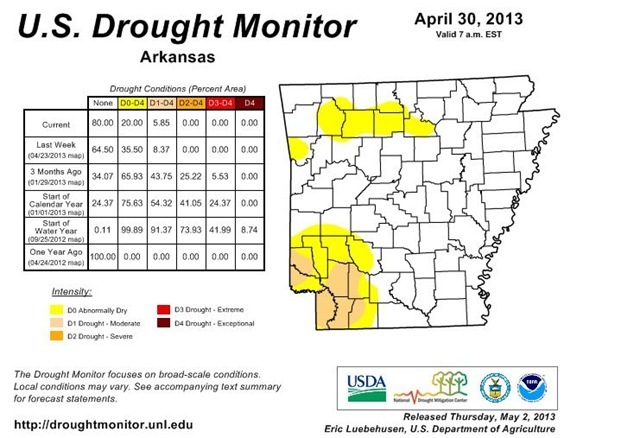 First time snow has been recorded in May in Arkansas since they started keeping records back in the late 1800’s. 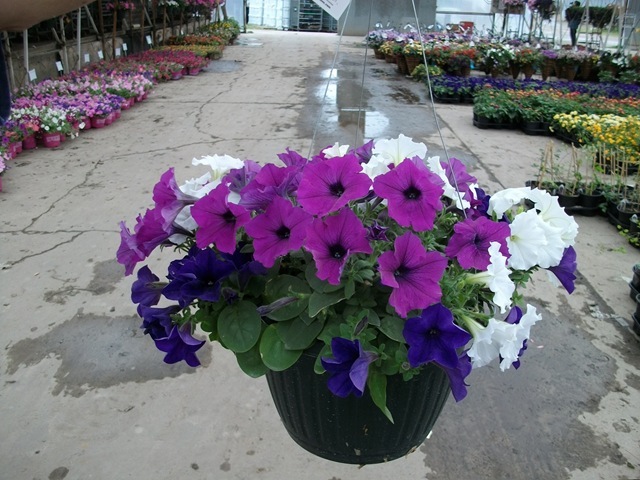 I am starting to really dislike Spring 2013. 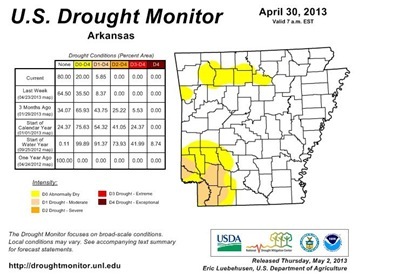 On the plus side, most of Arkansas except for our lone county on the west, some north central and southwest counties in the south are out of the drought. 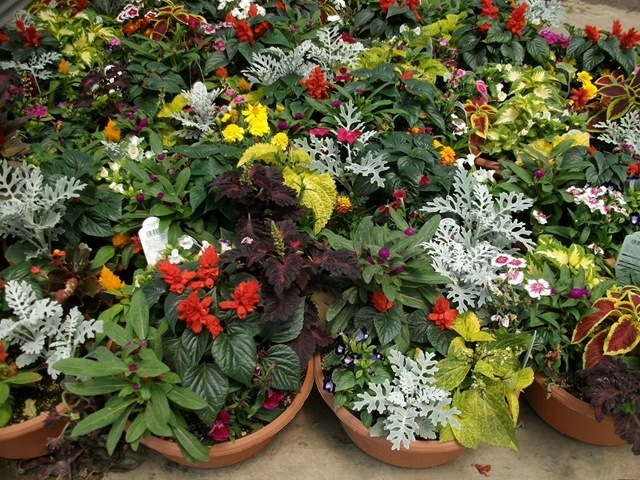 So much for the chit-chat. Now for something completely different – me talking. 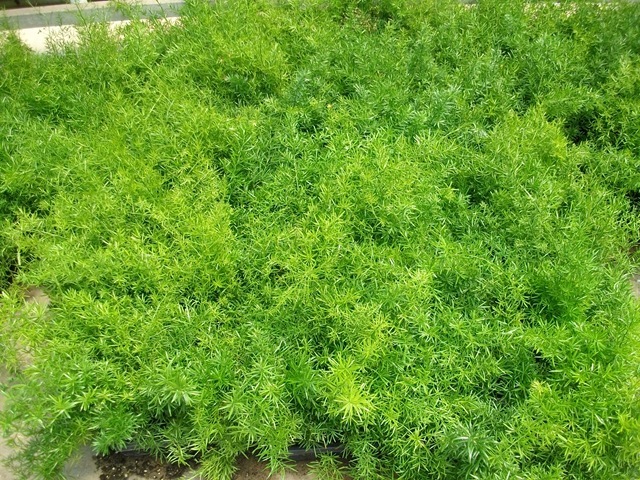 That’s probably enough of me for a month or 7. 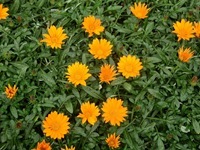 Last up are the pictures.